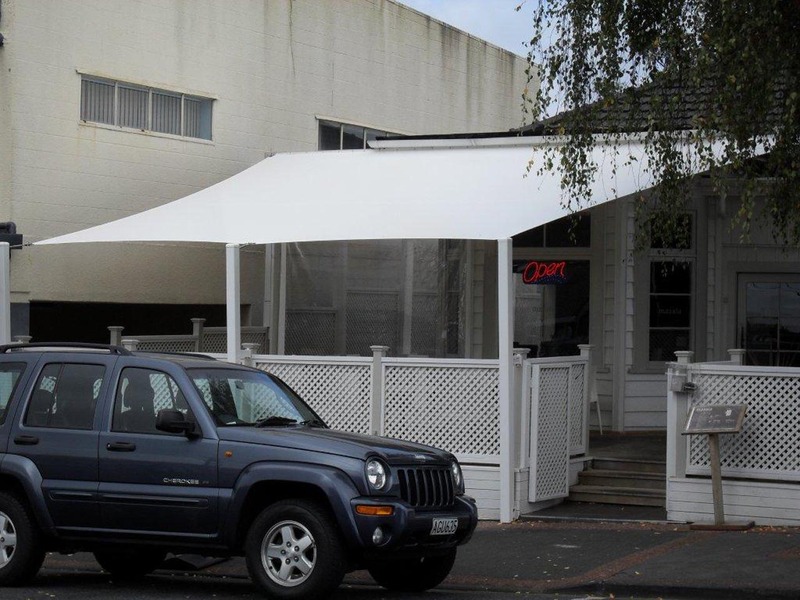 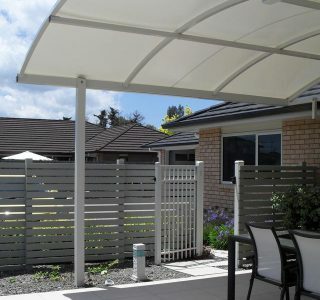 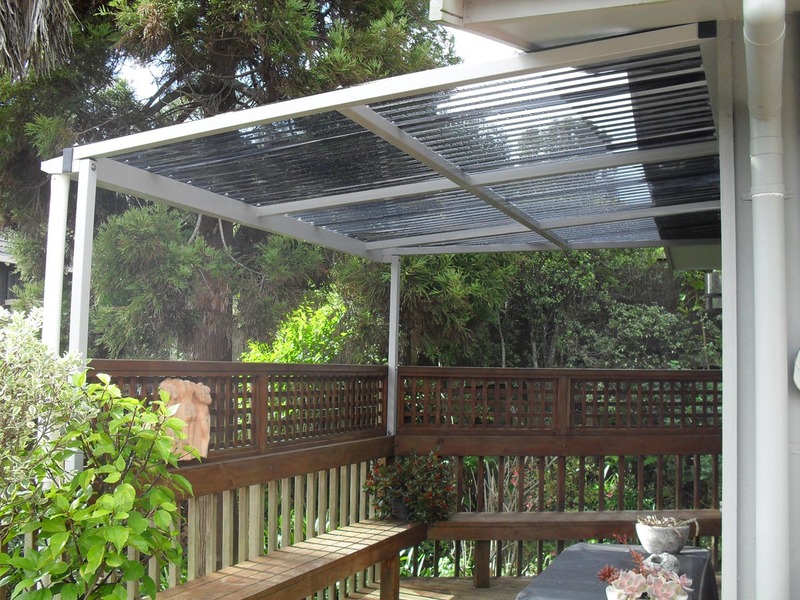 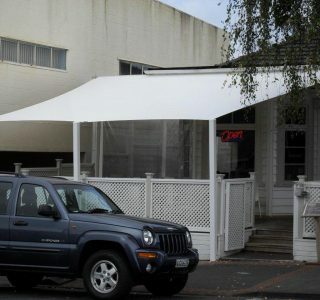 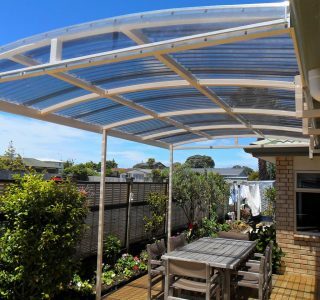 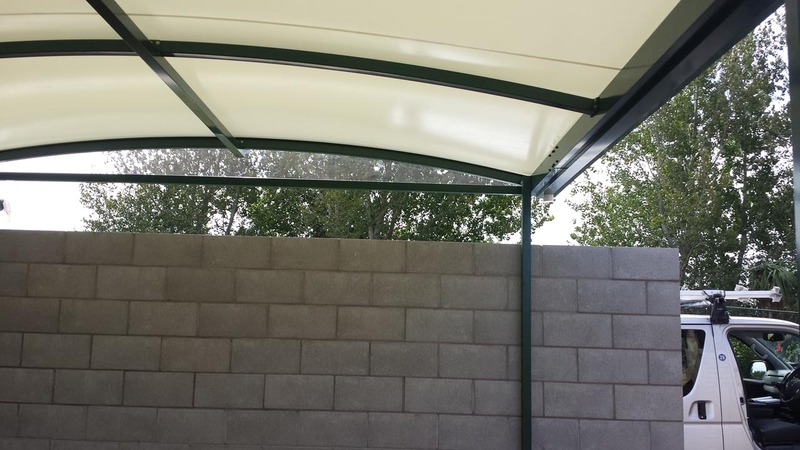 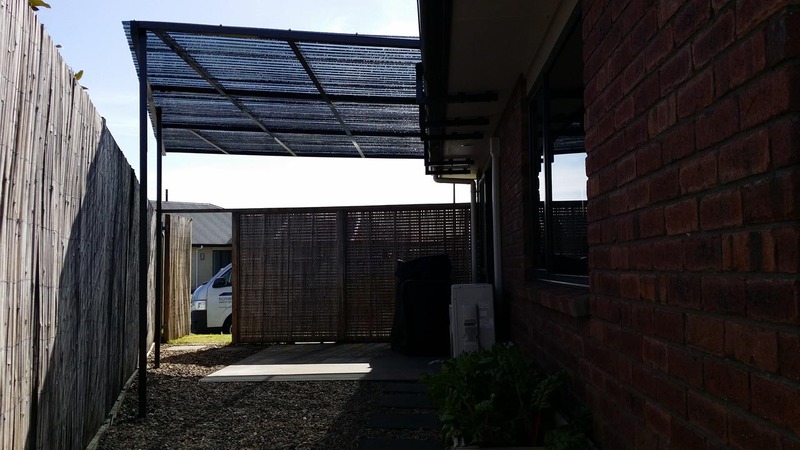 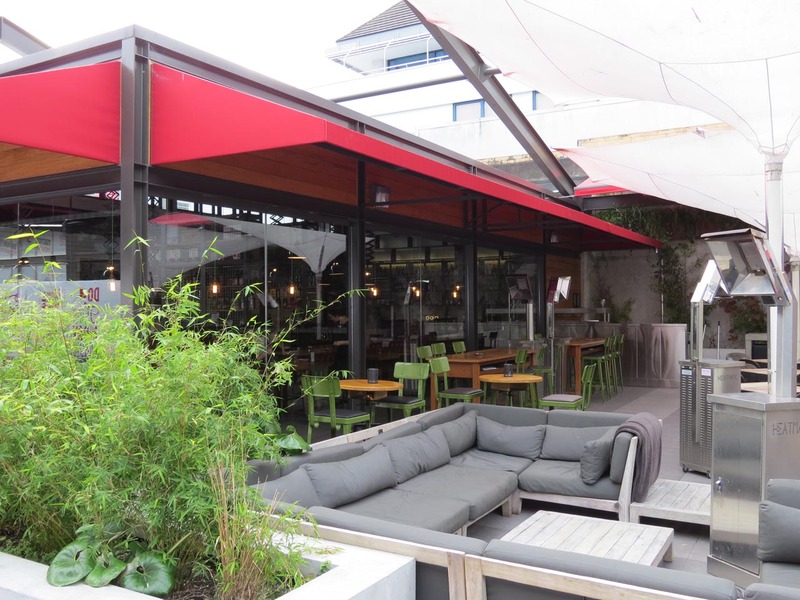 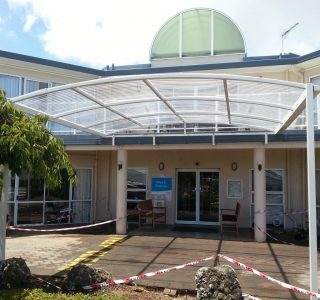 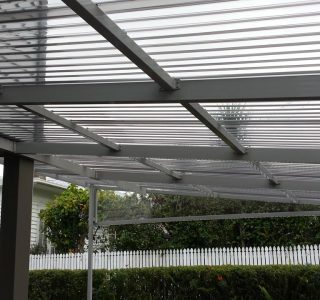 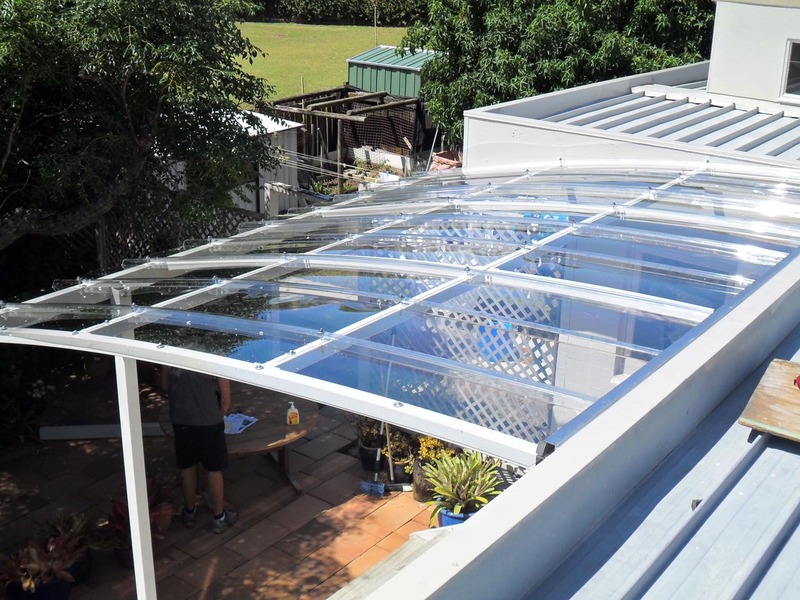 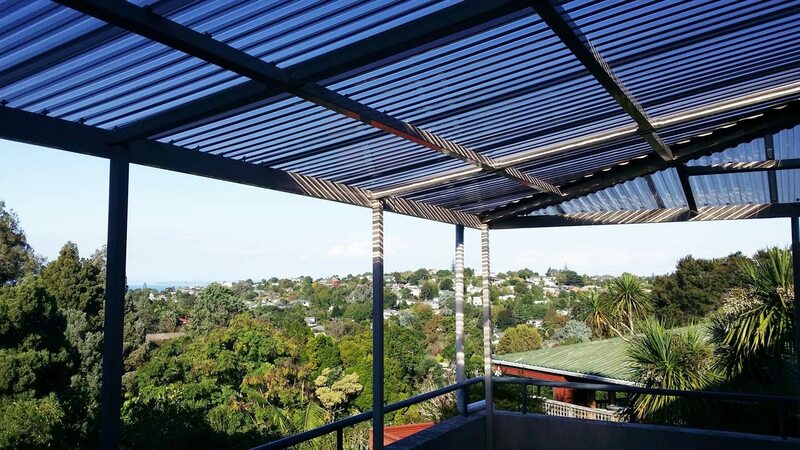 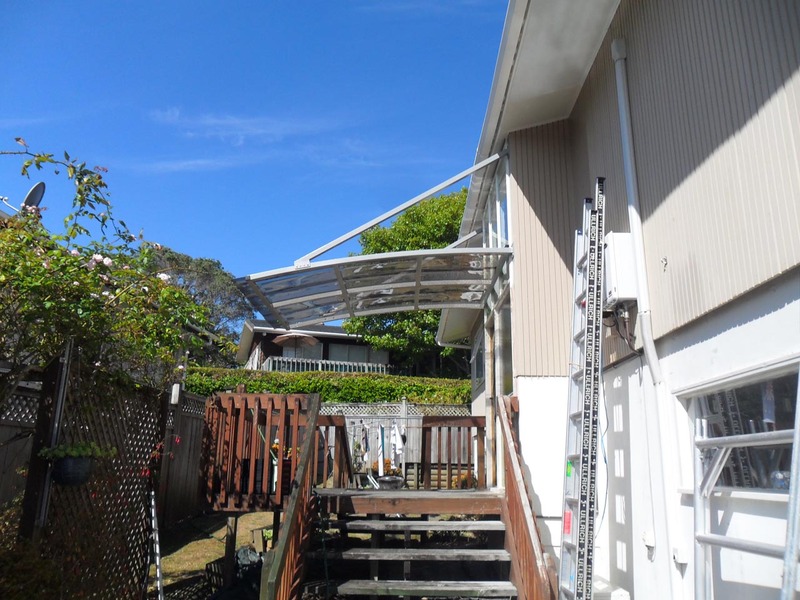 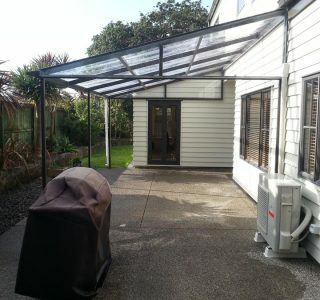 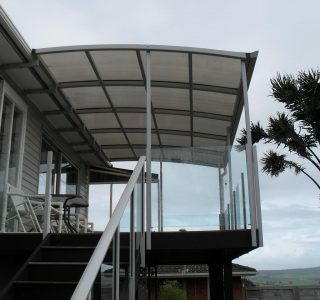 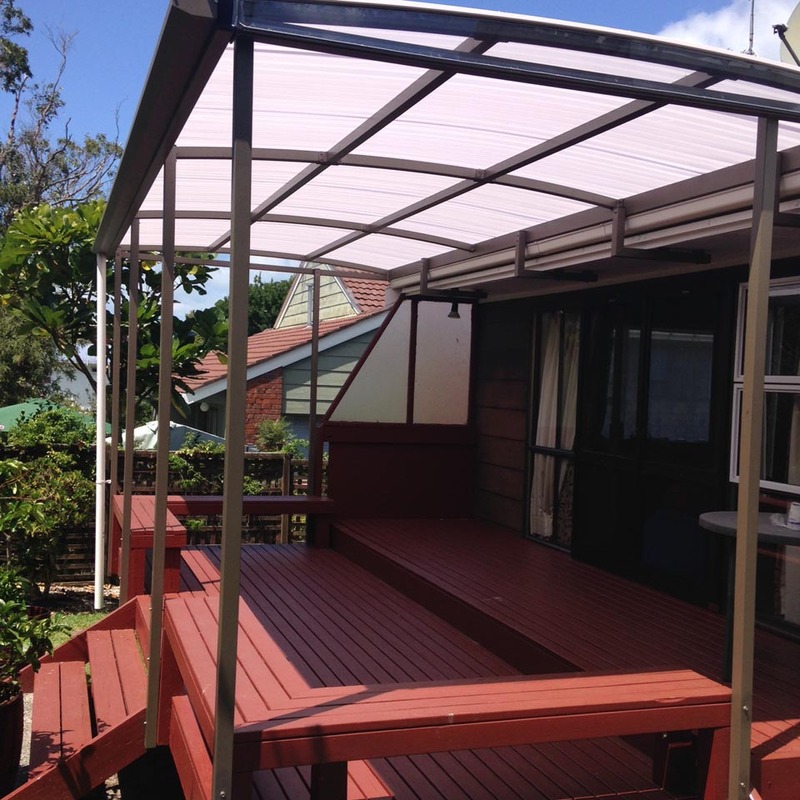 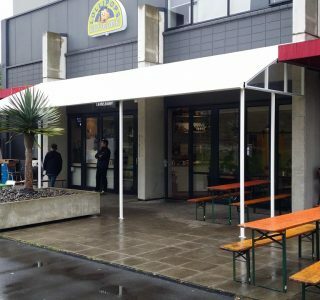 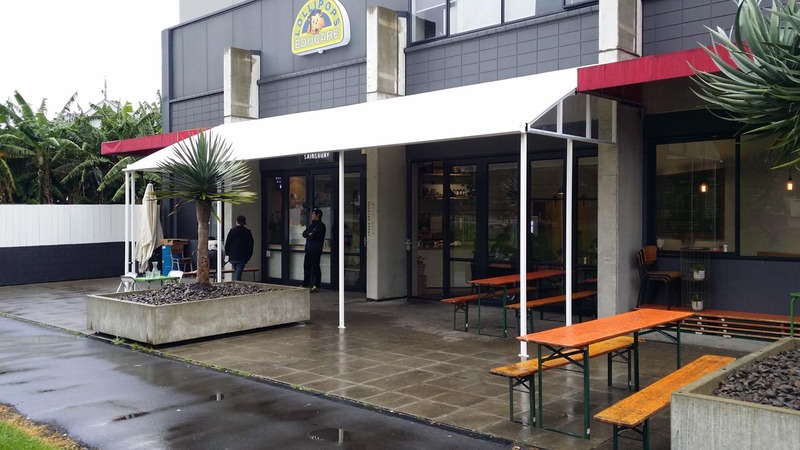 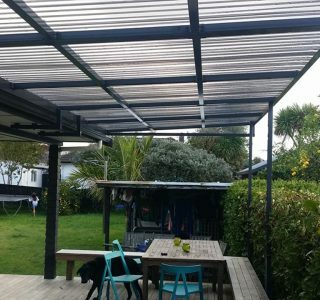 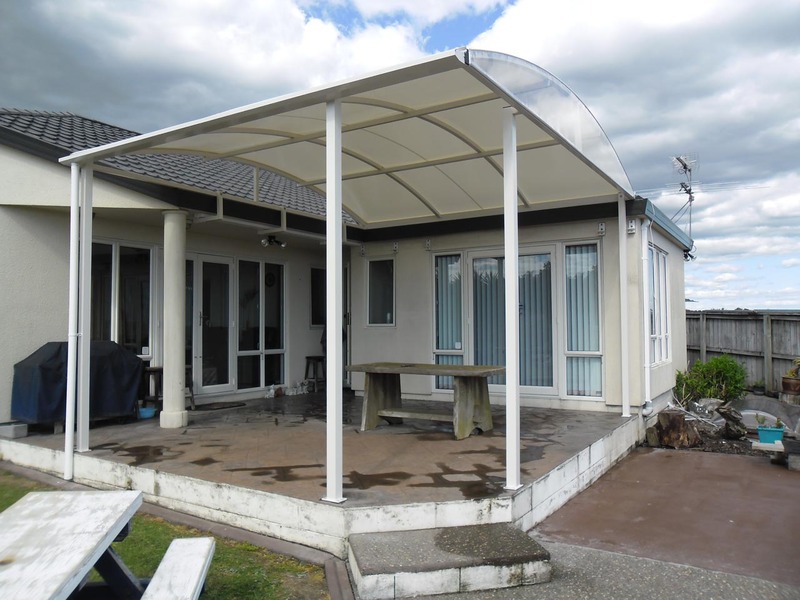 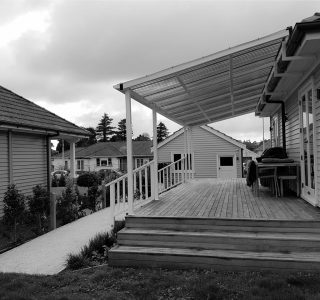 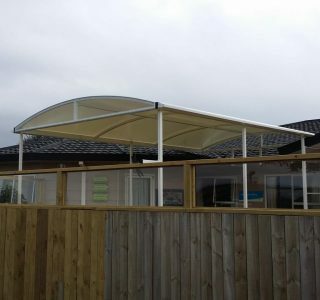 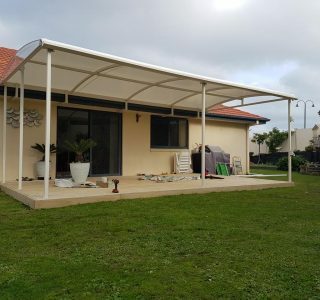 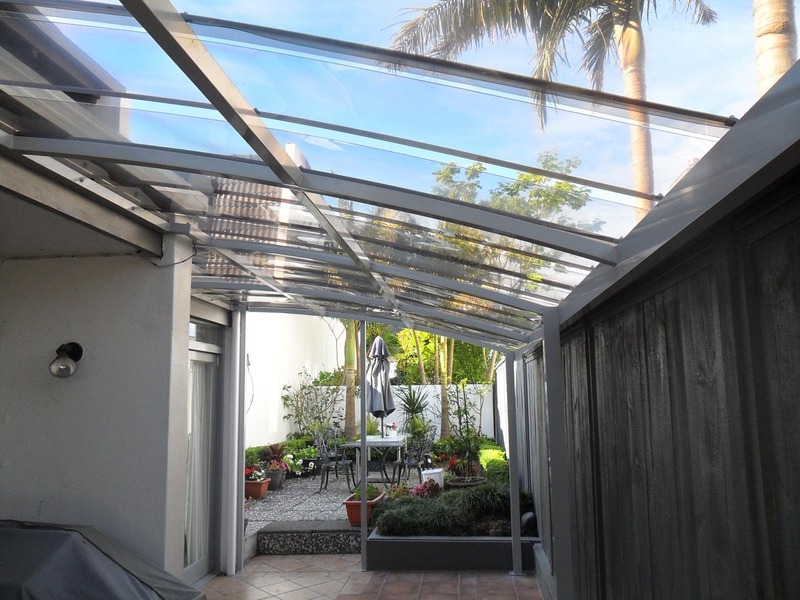 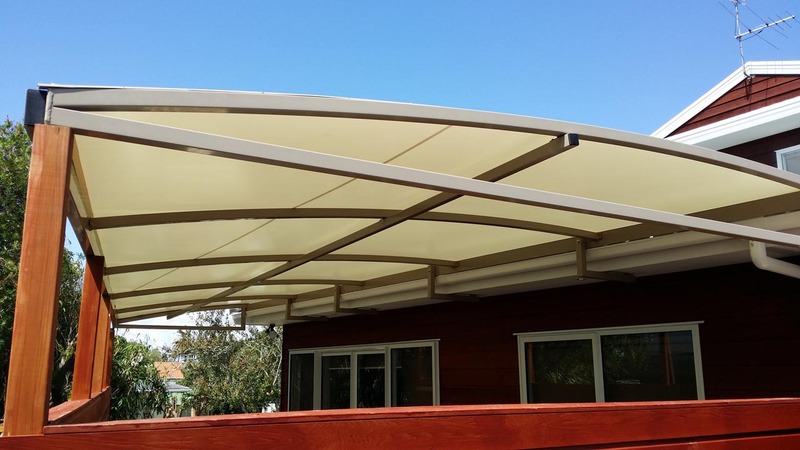 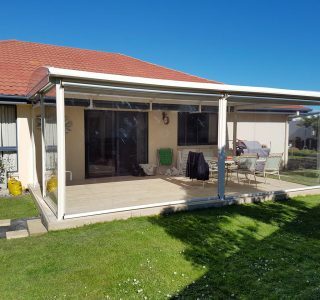 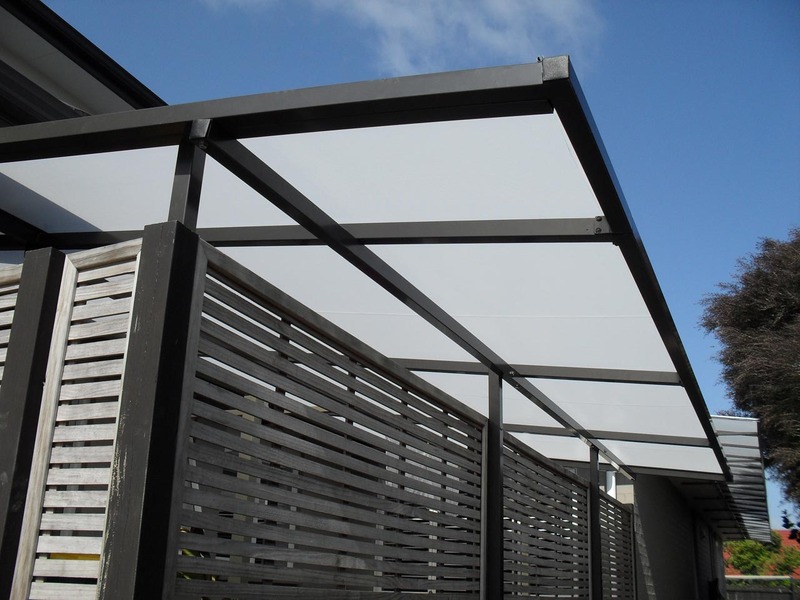 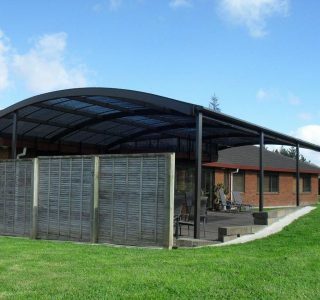 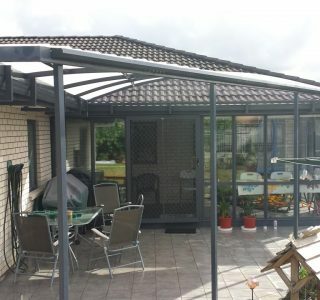 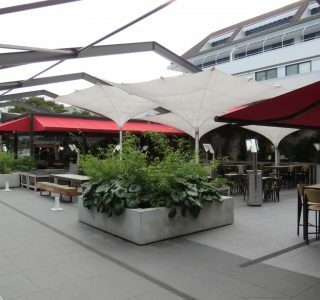 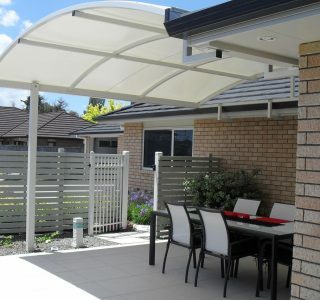 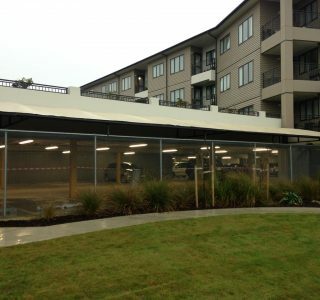 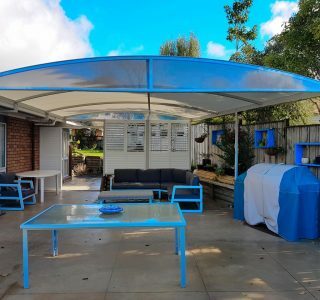 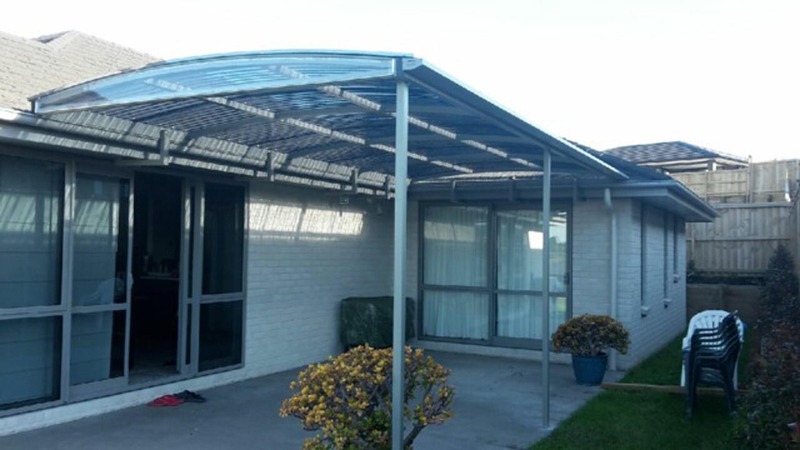 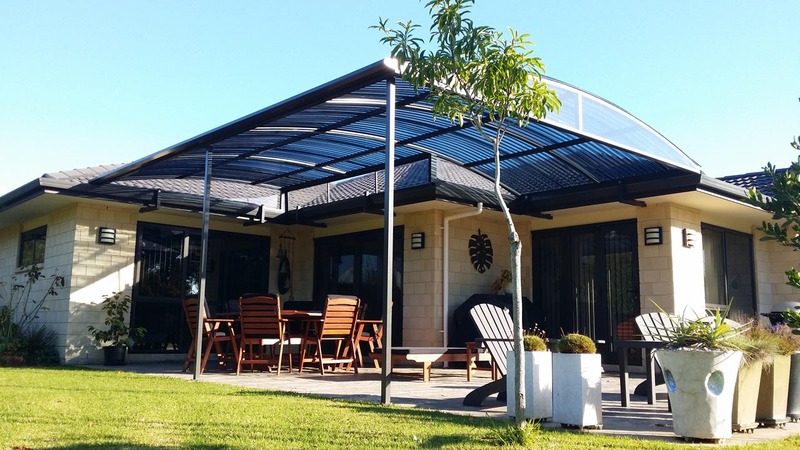 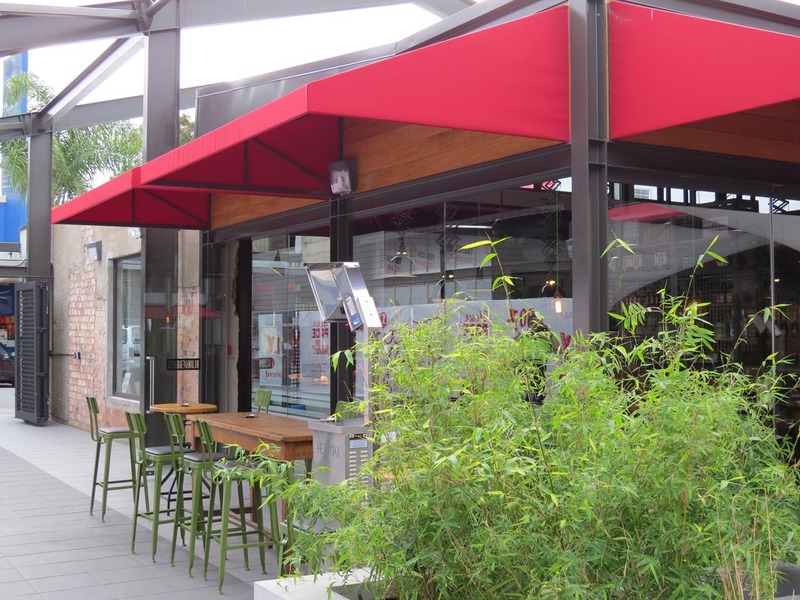 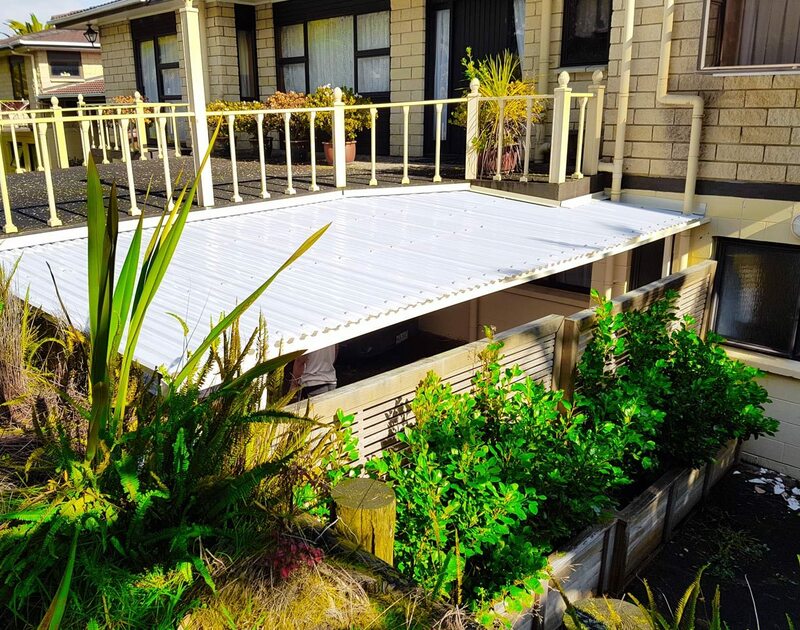 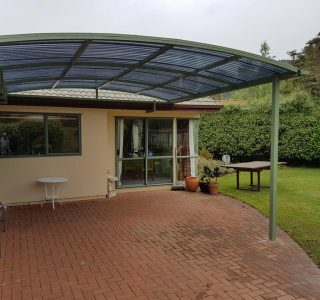 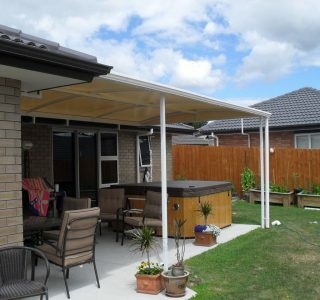 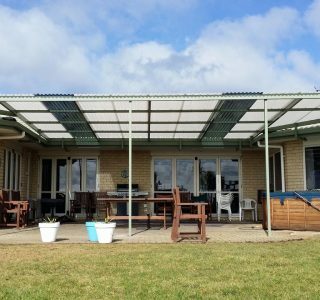 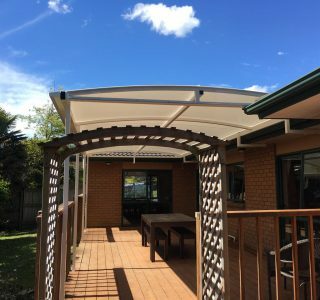 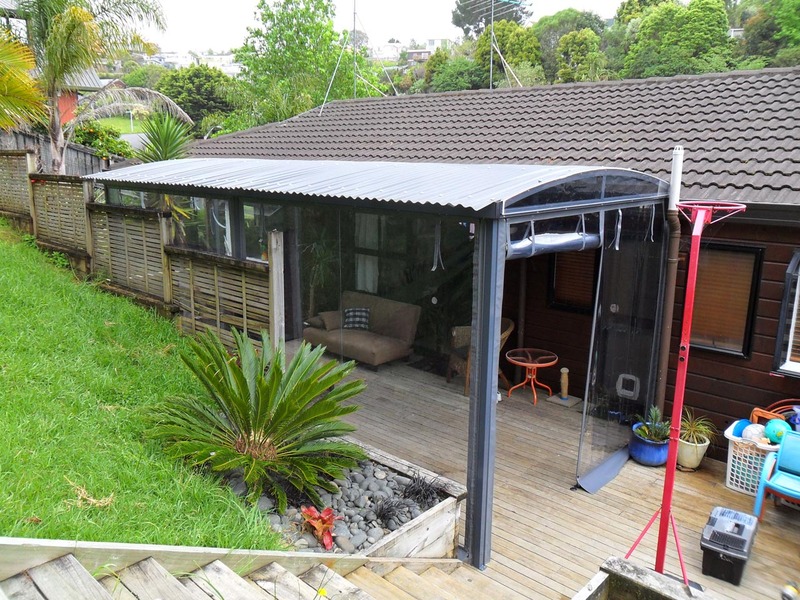 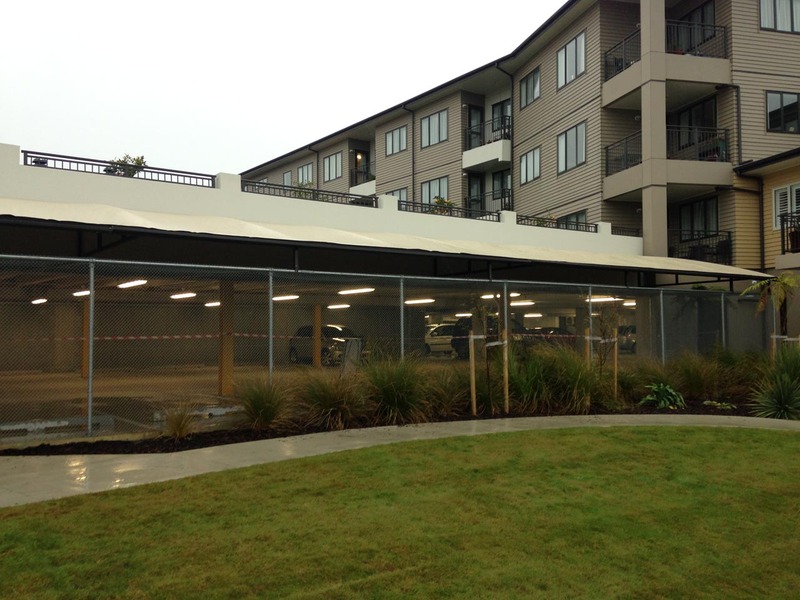 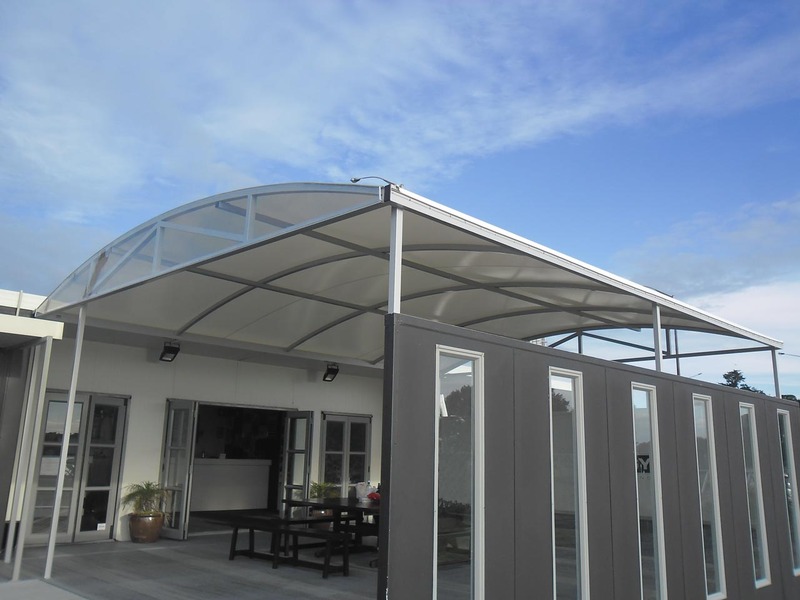 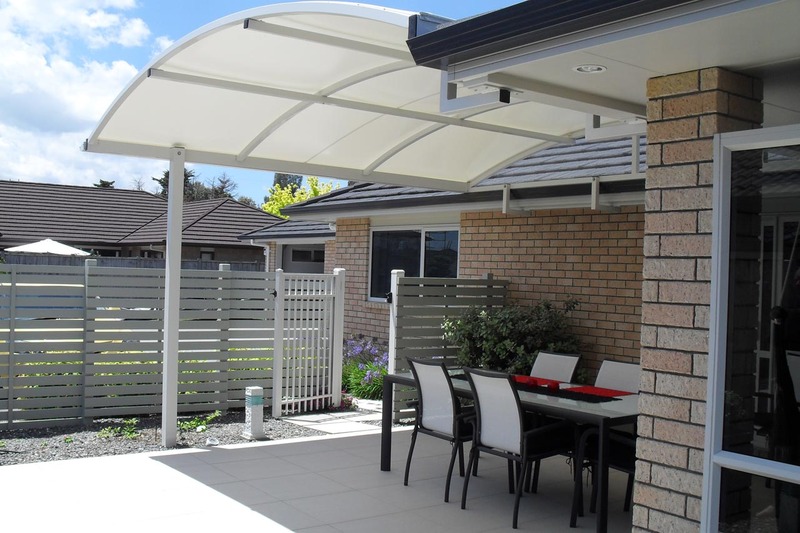 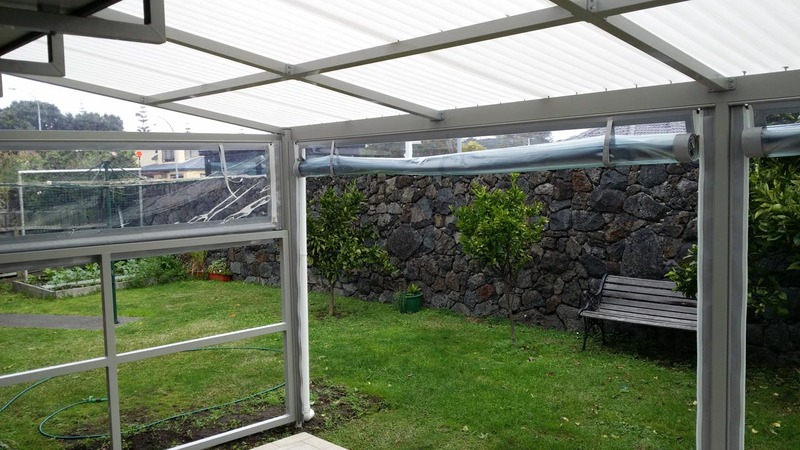 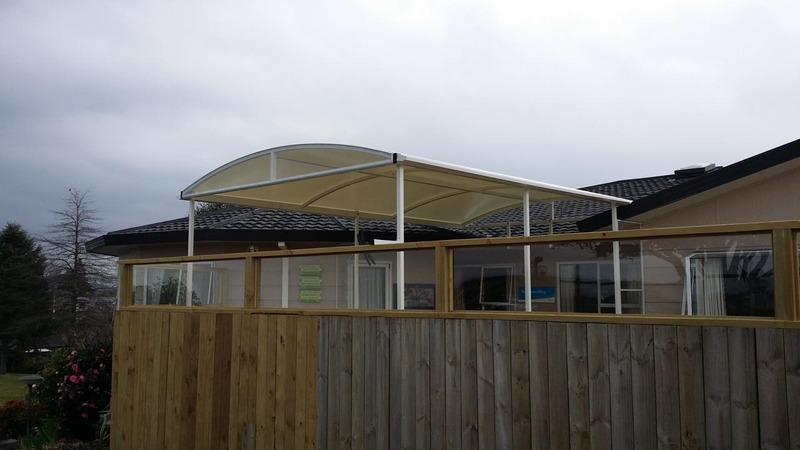 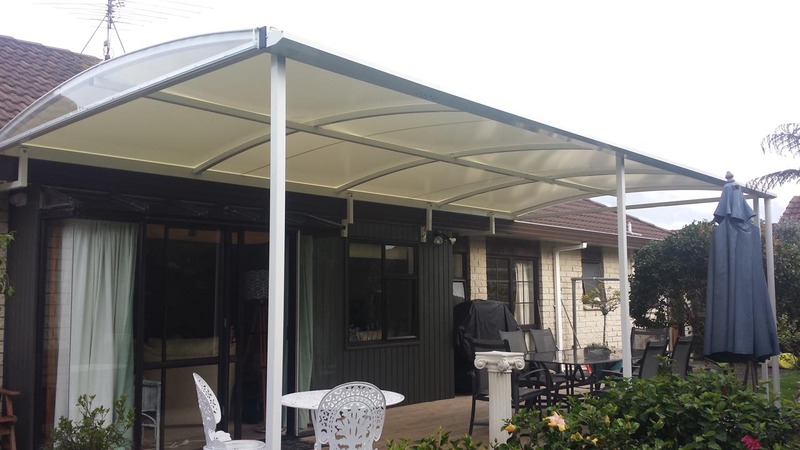 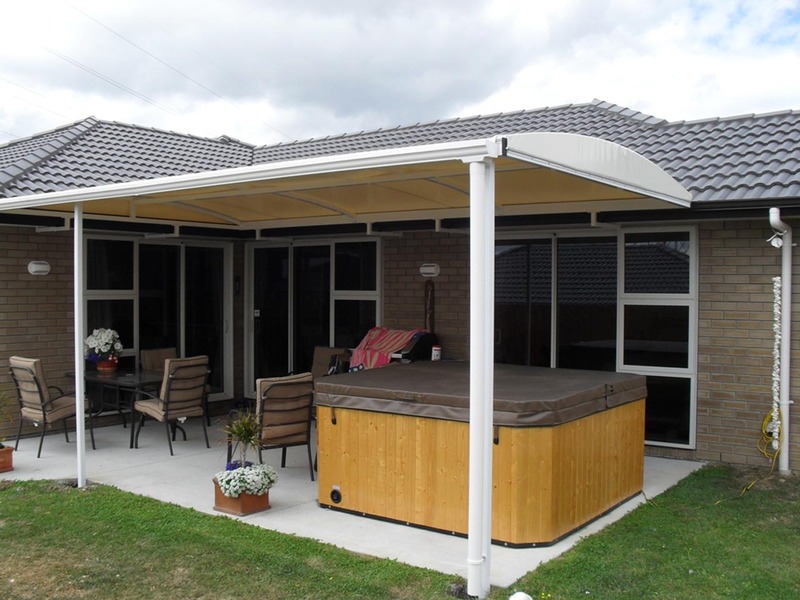 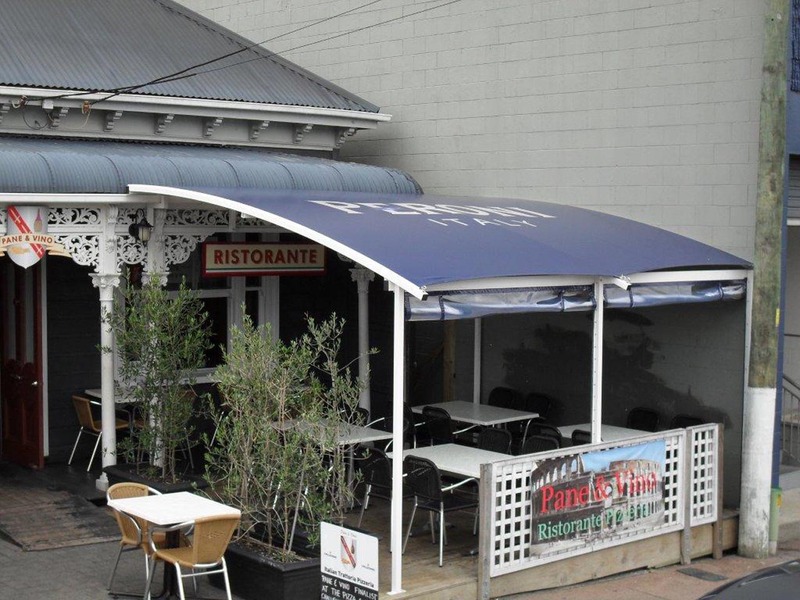 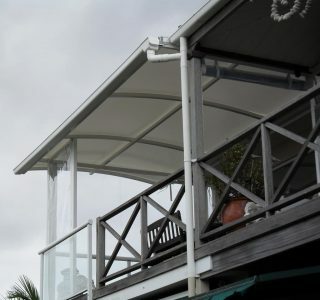 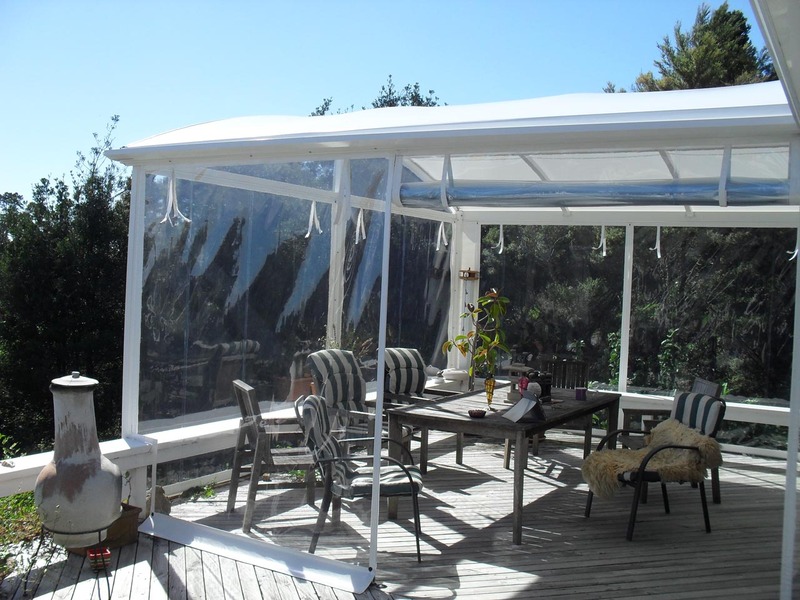 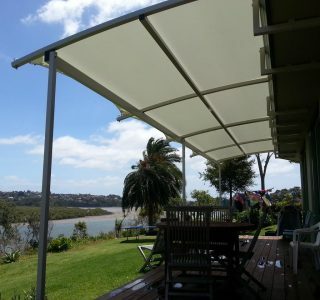 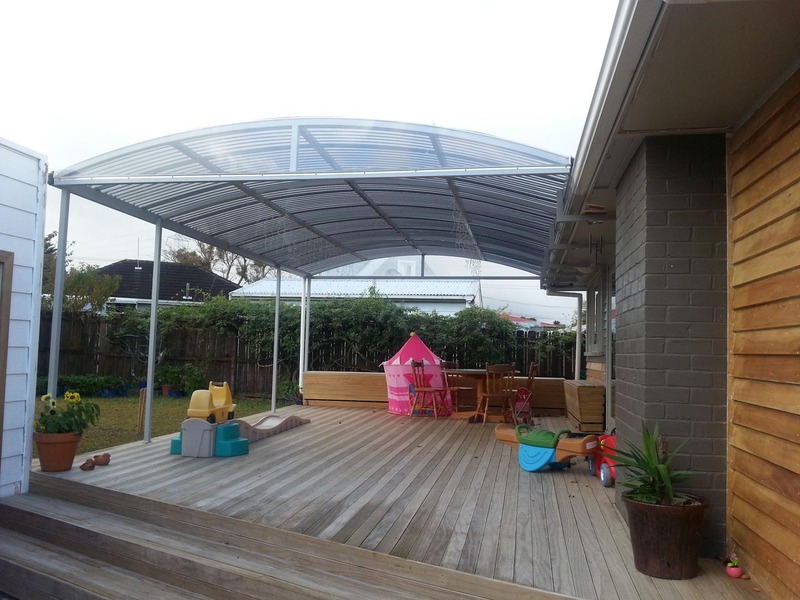 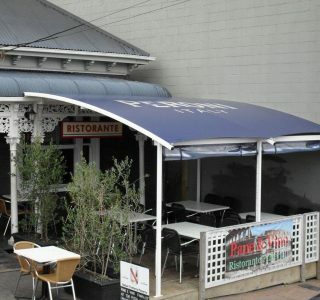 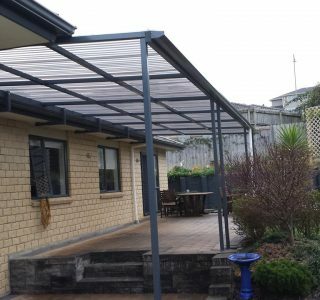 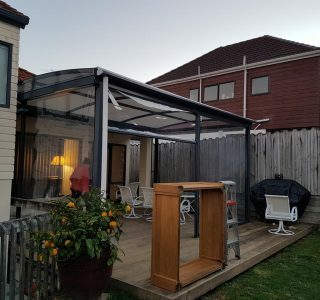 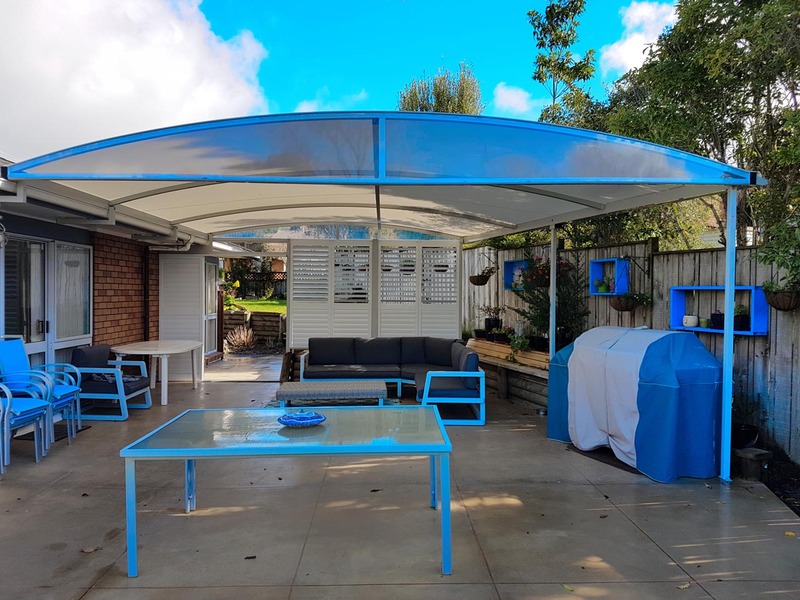 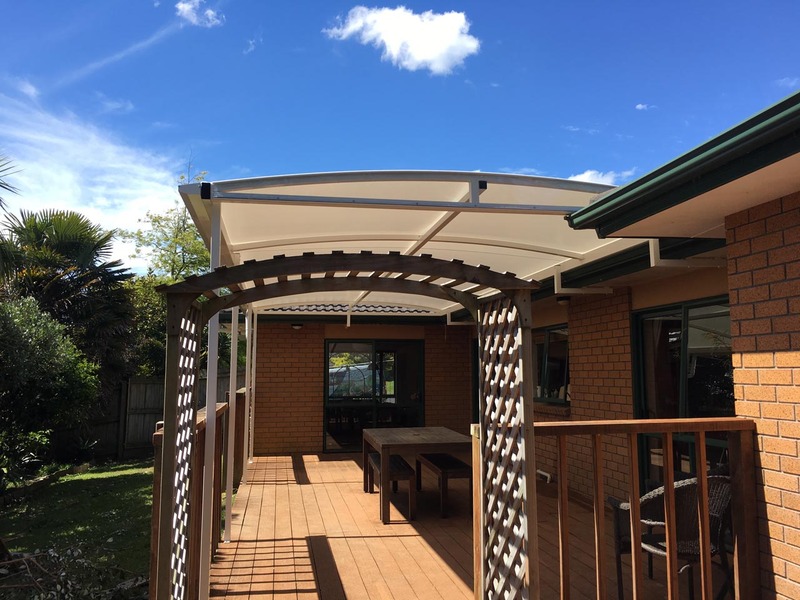 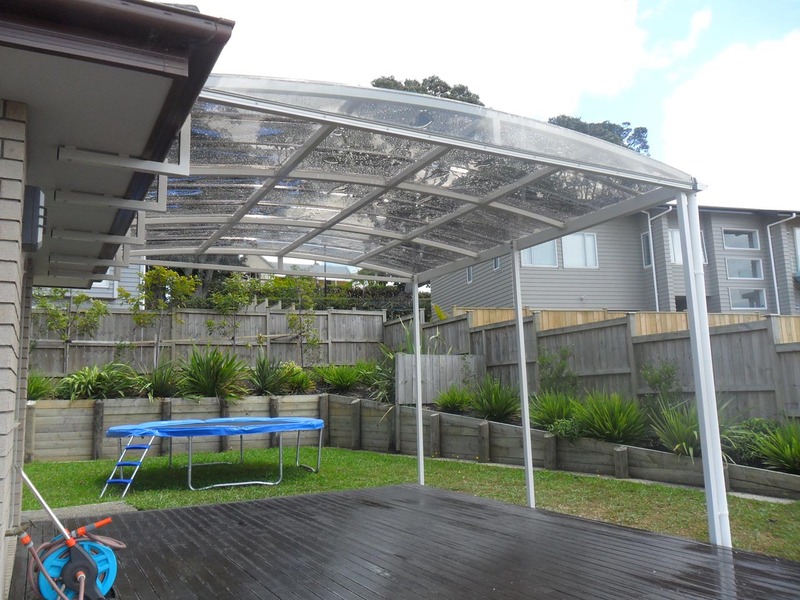 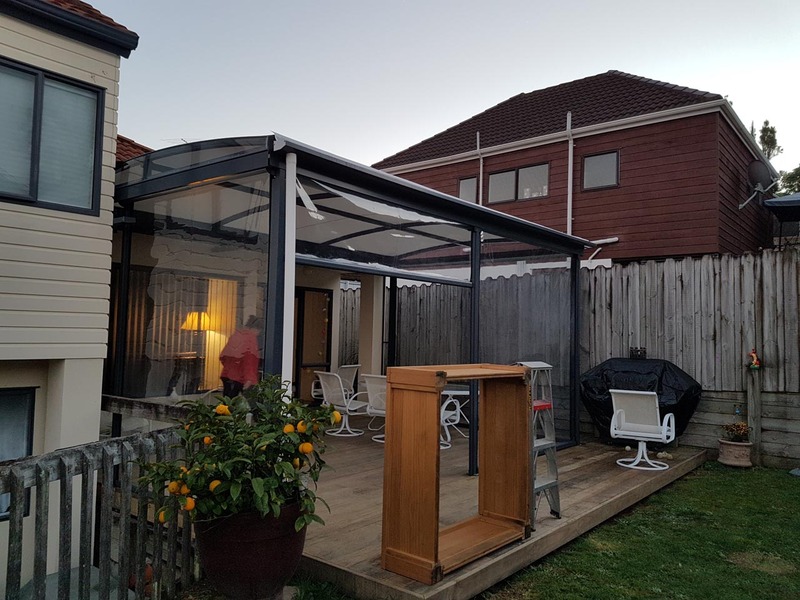 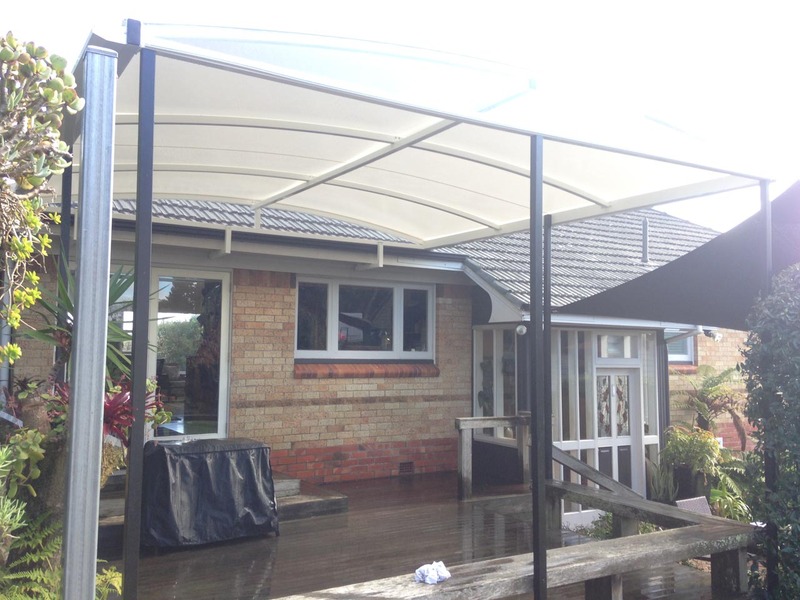 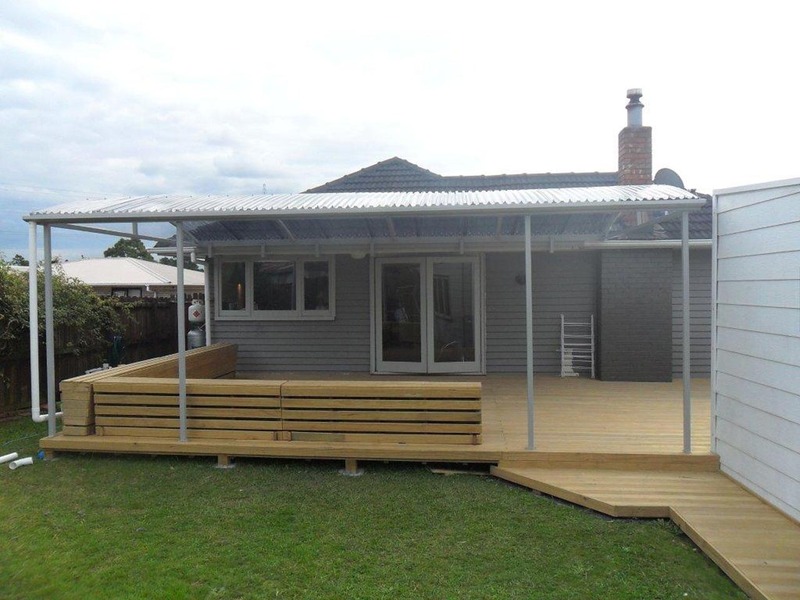 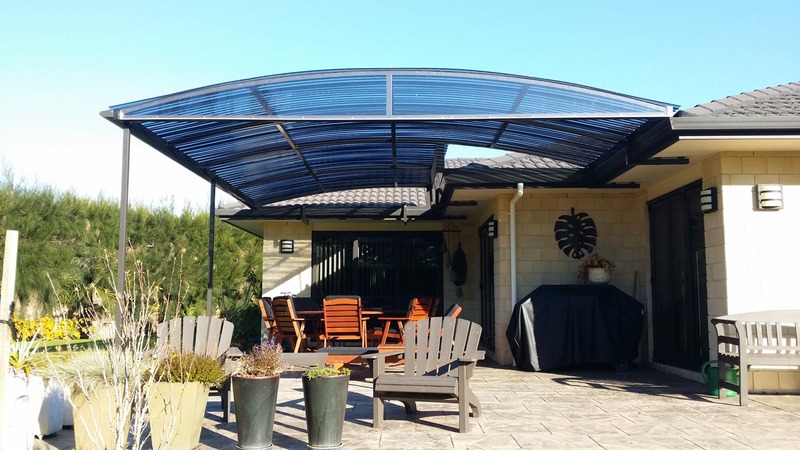 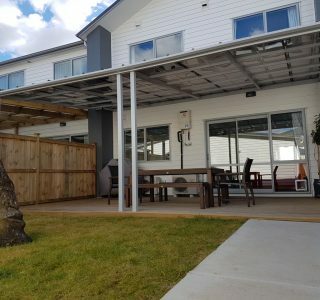 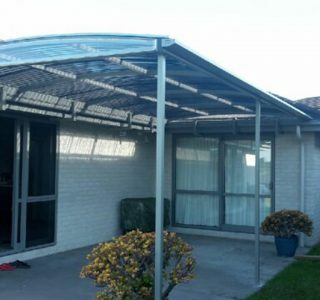 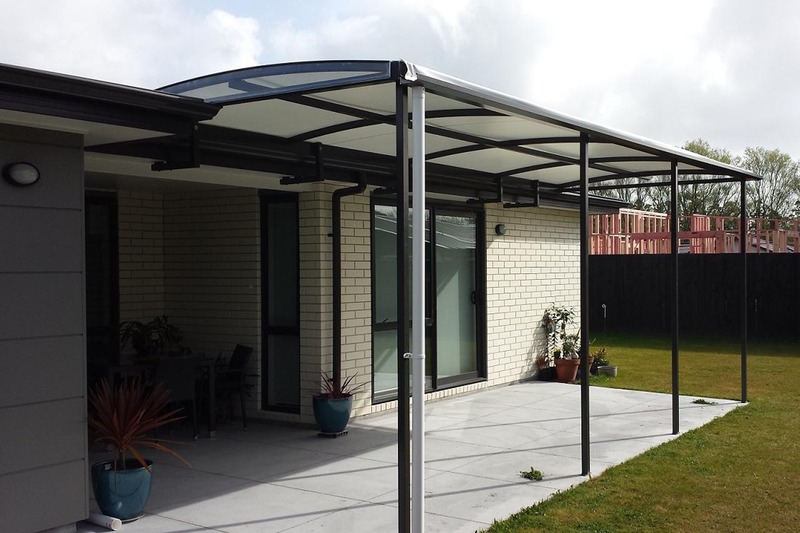 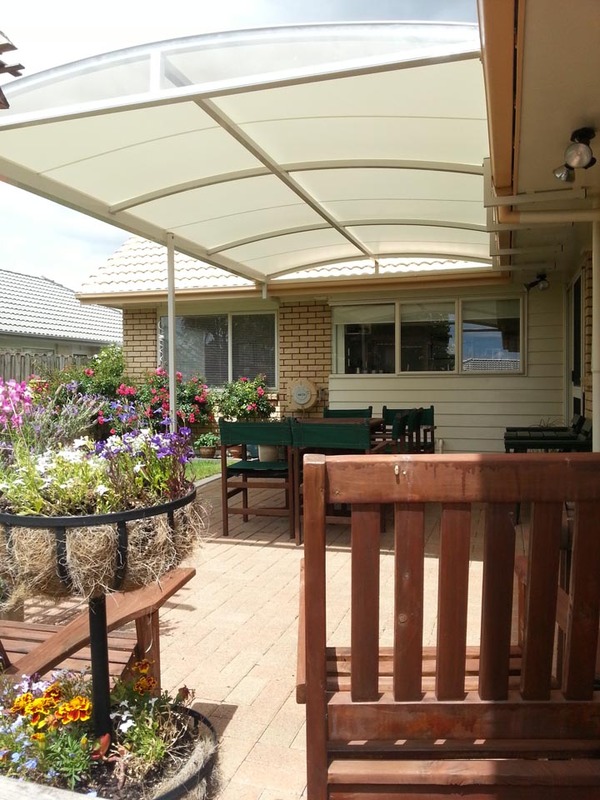 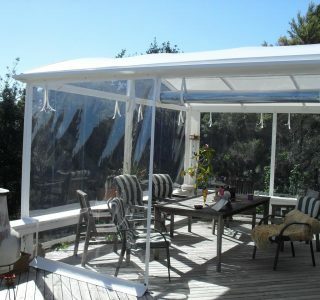 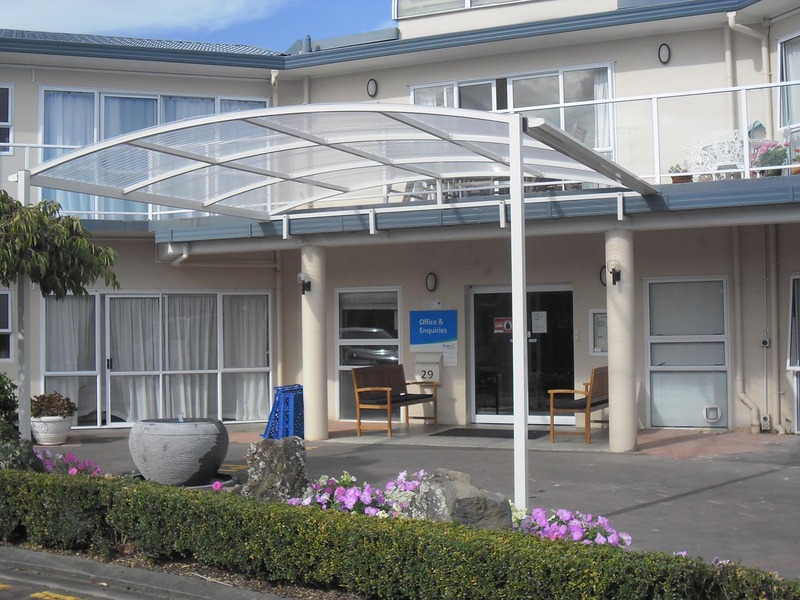 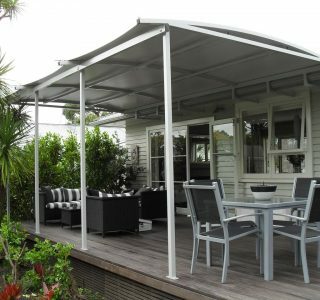 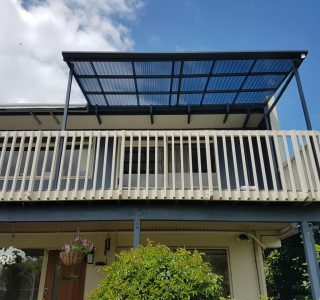 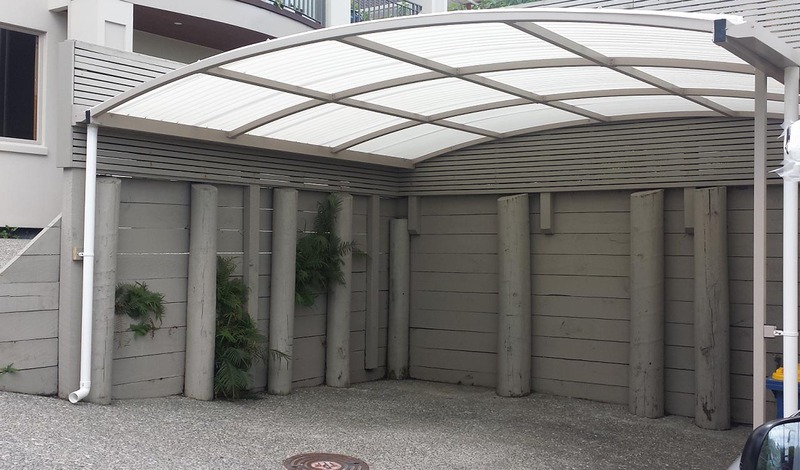 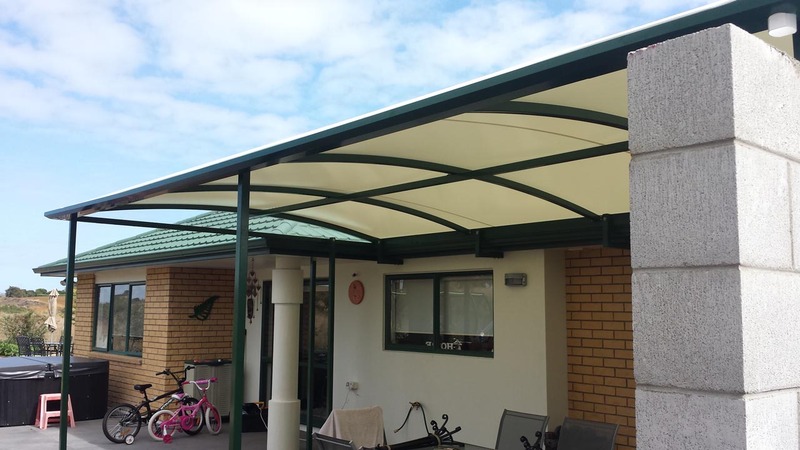 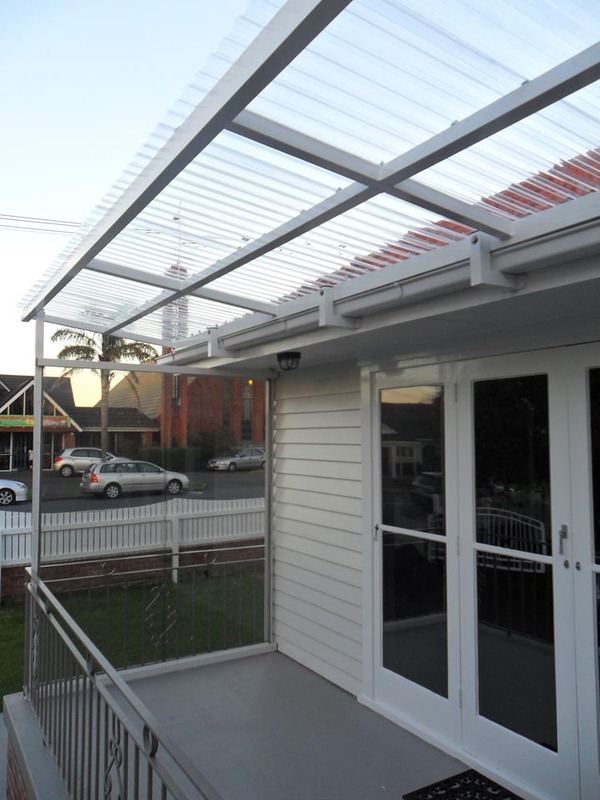 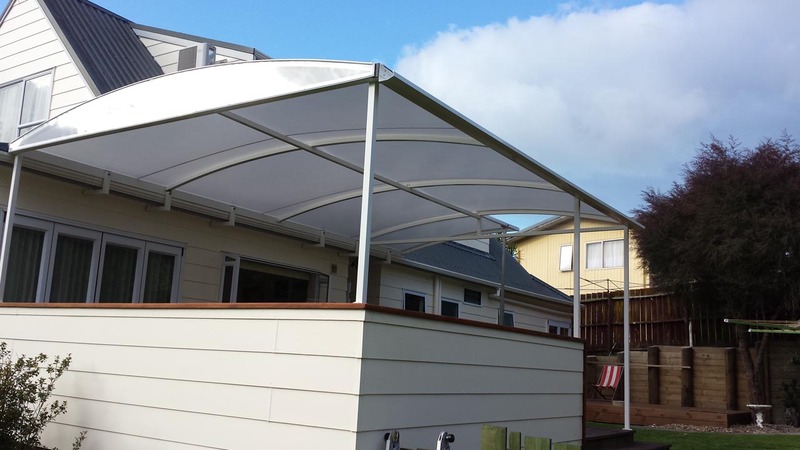 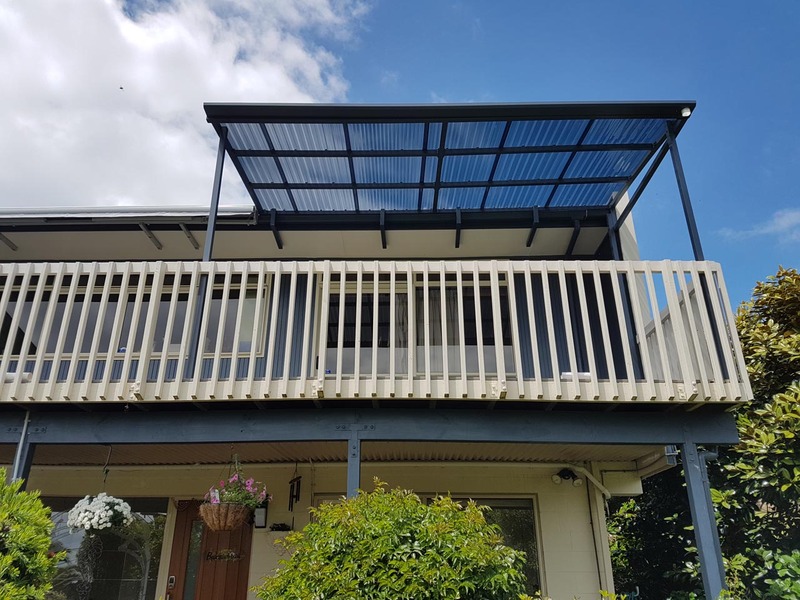 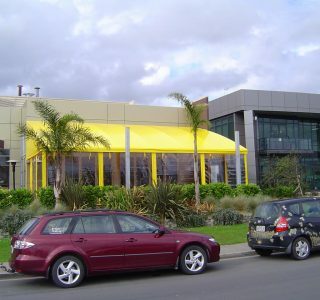 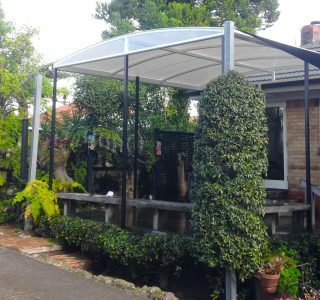 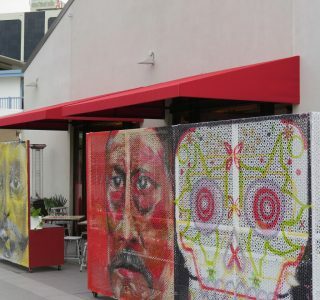 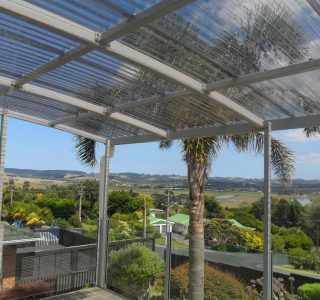 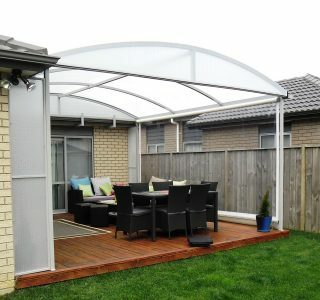 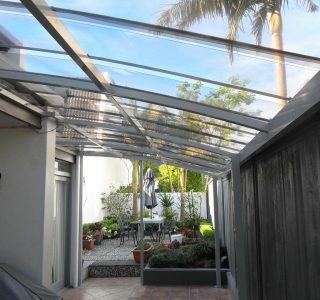 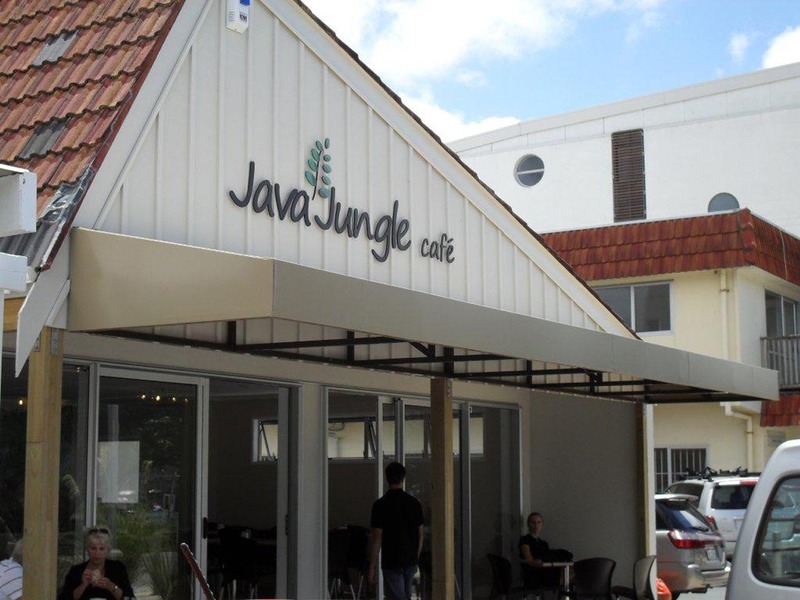 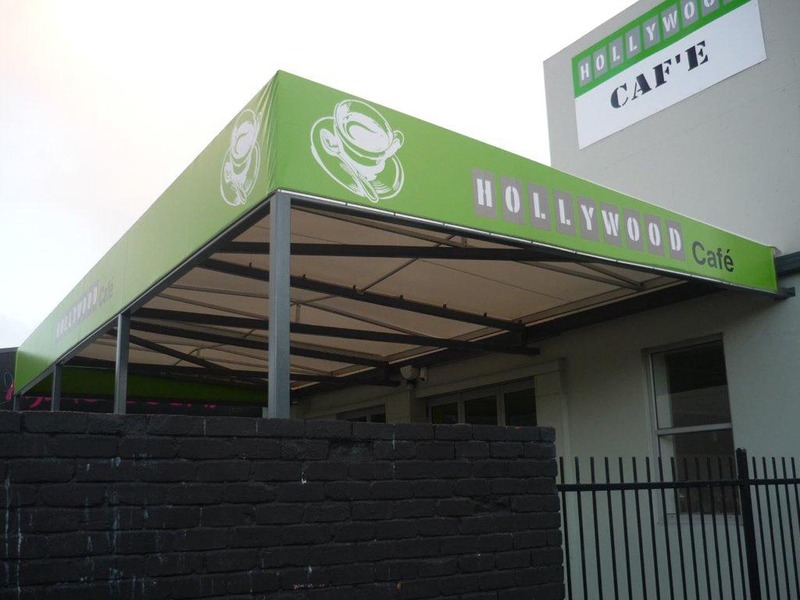 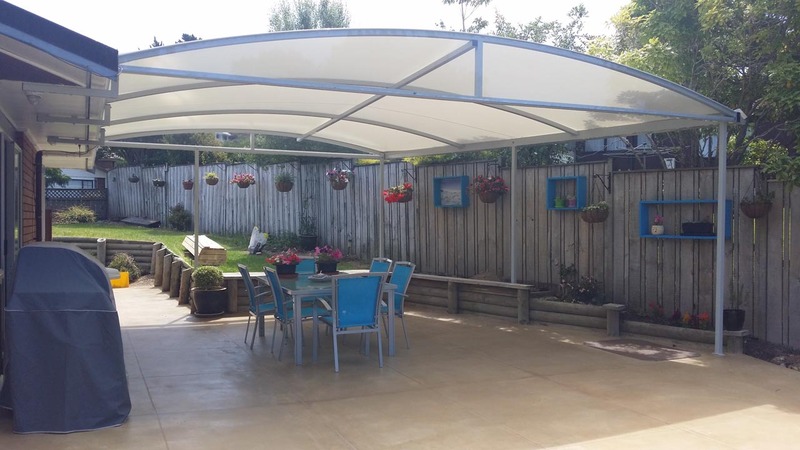 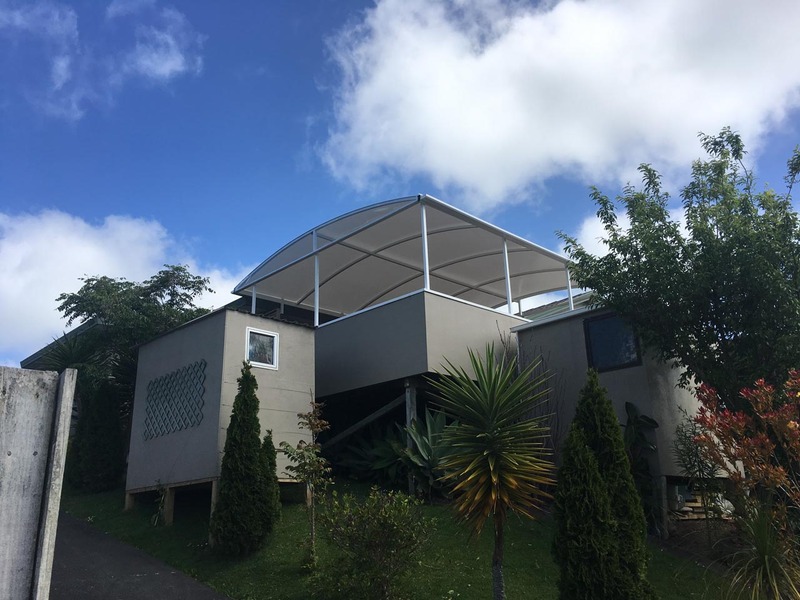 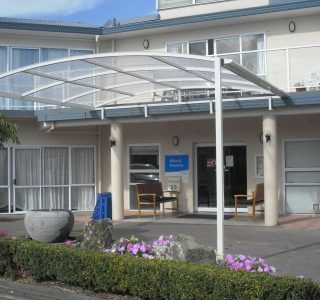 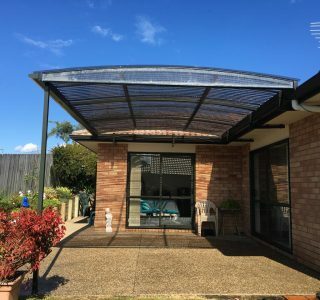 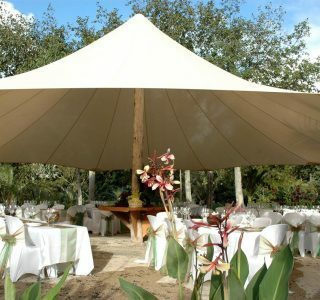 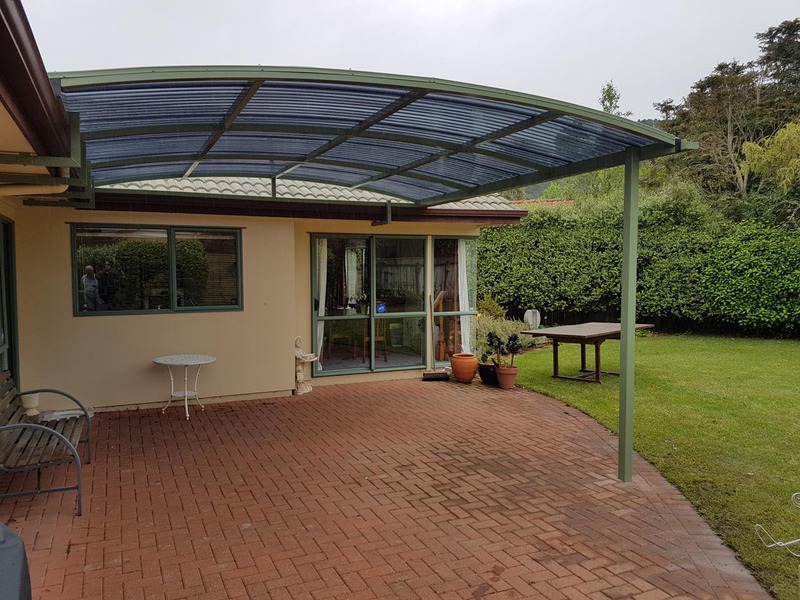 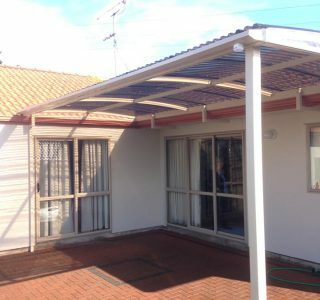 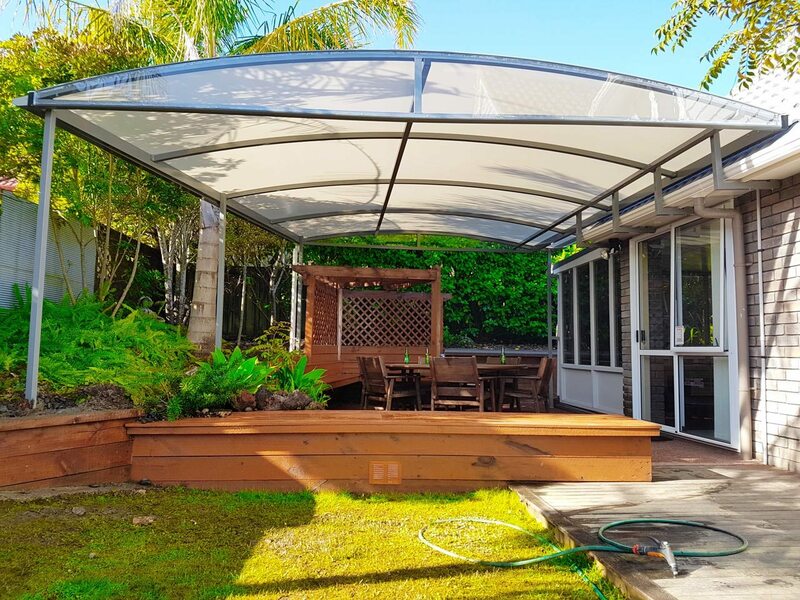 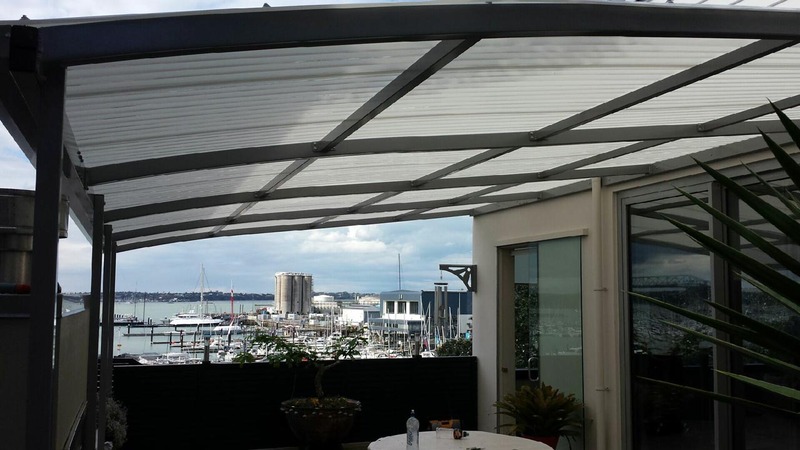 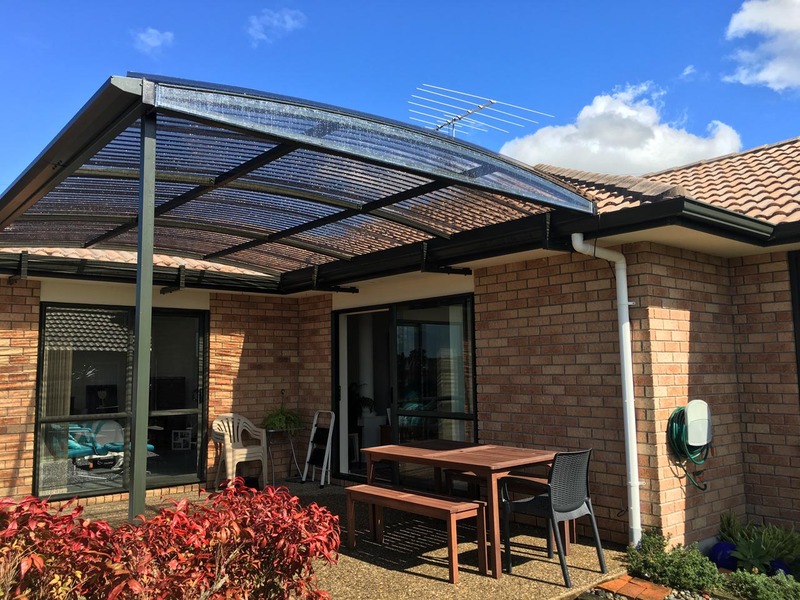 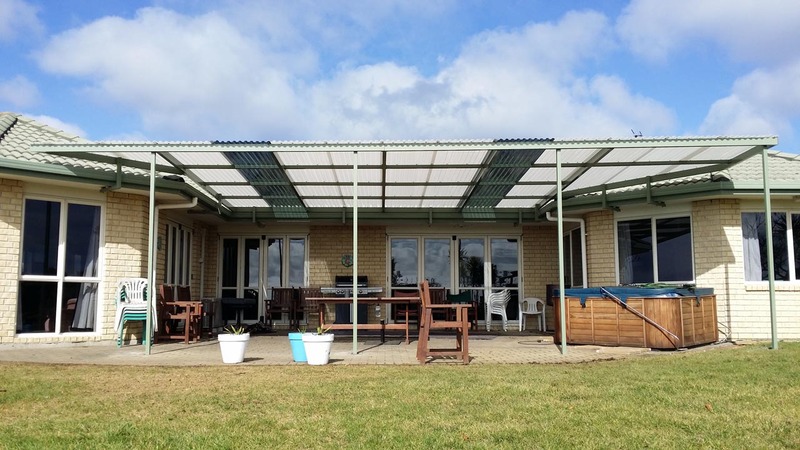 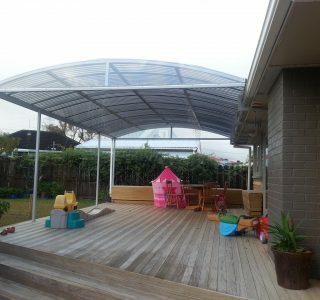 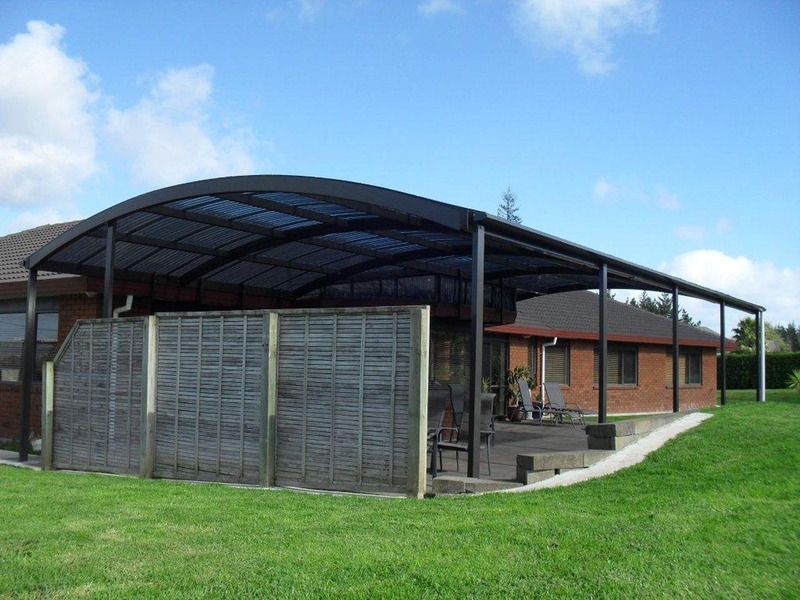 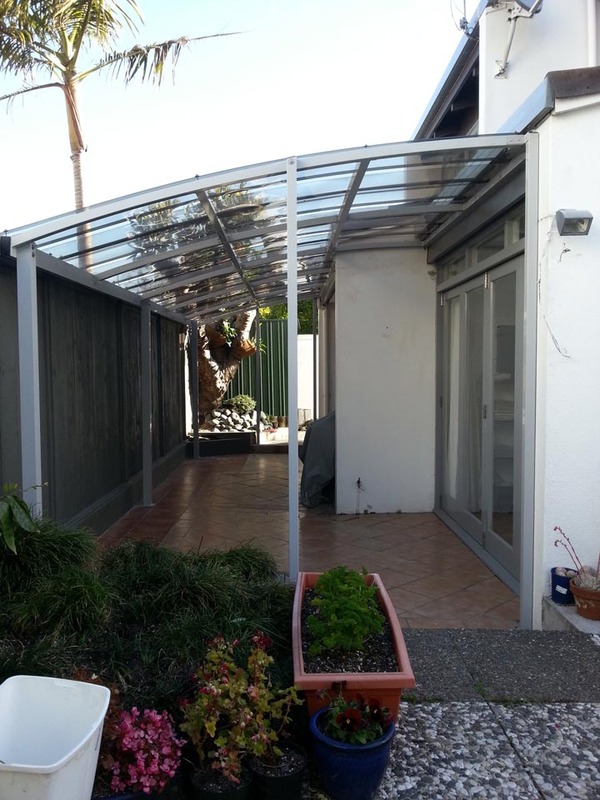 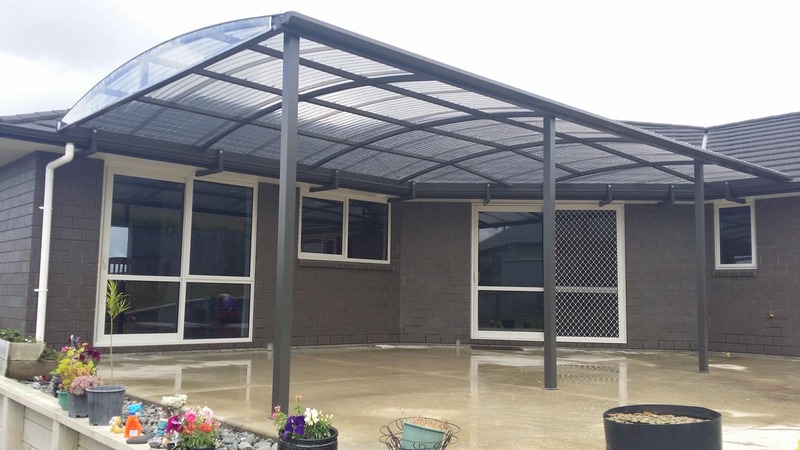 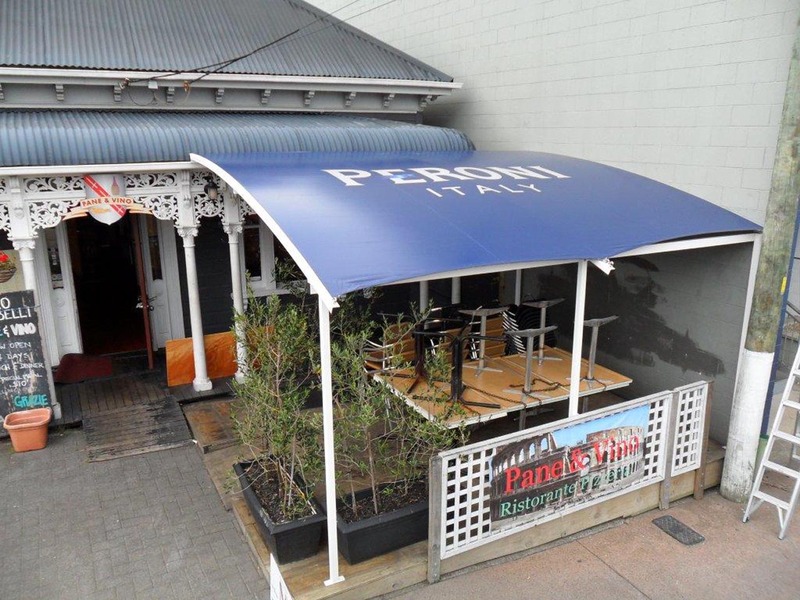 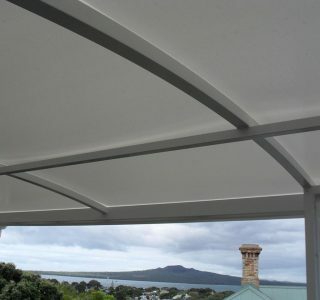 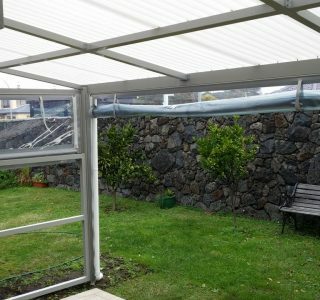 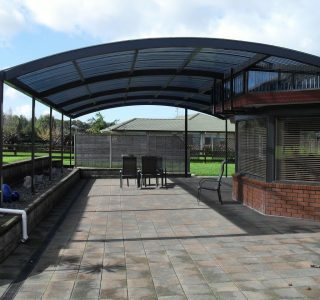 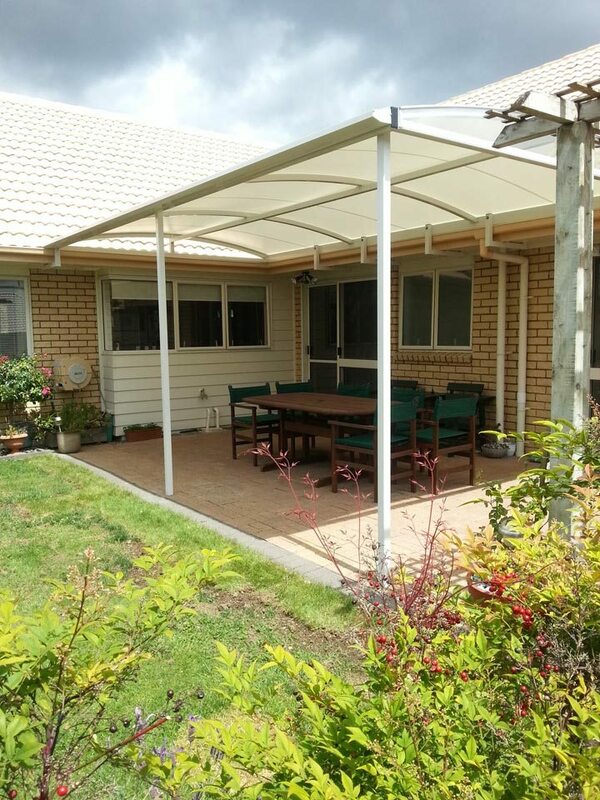 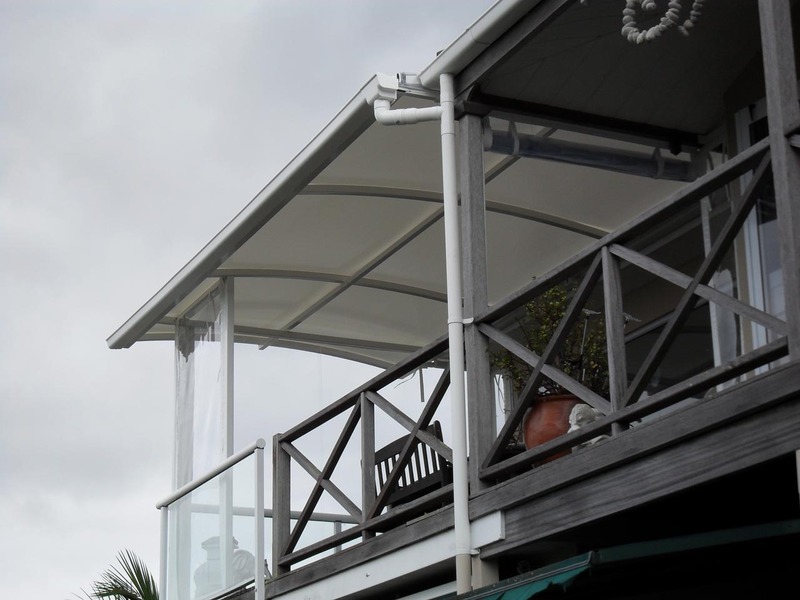 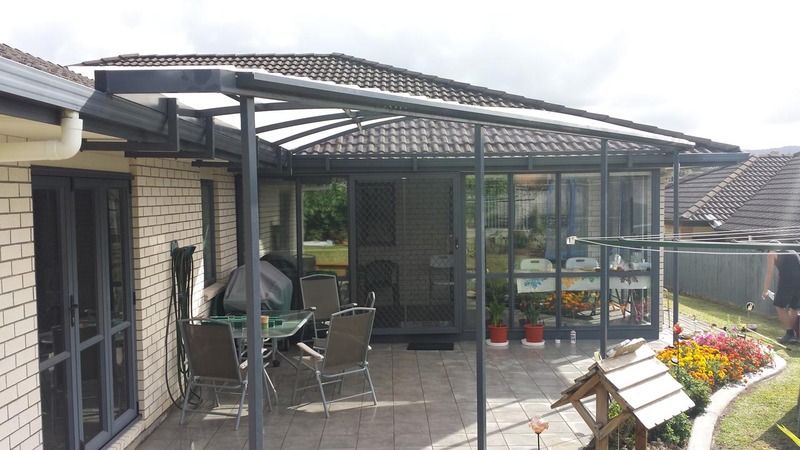 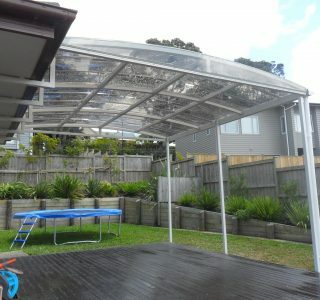 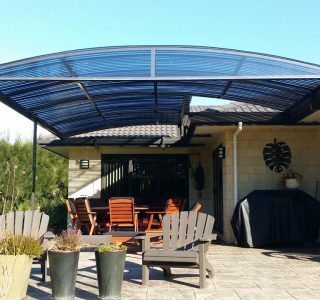 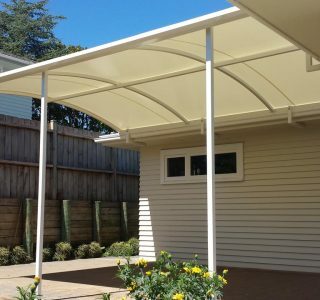 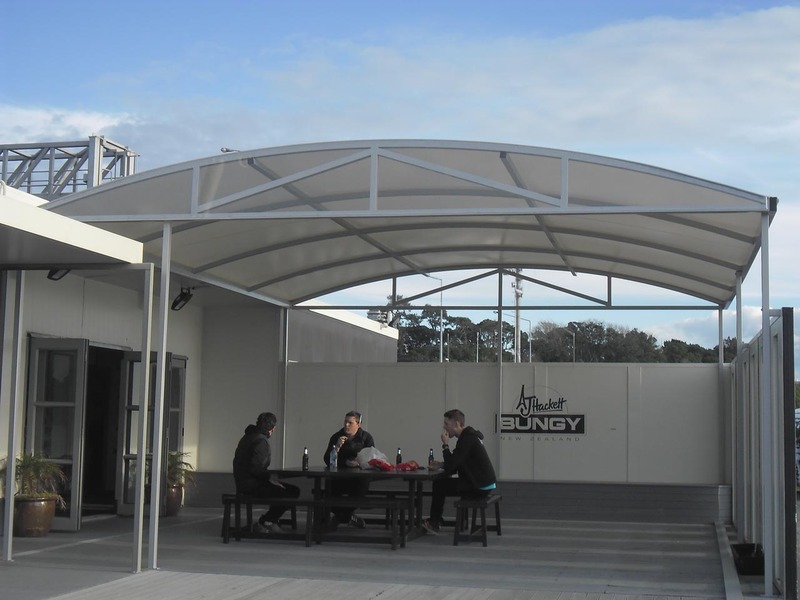 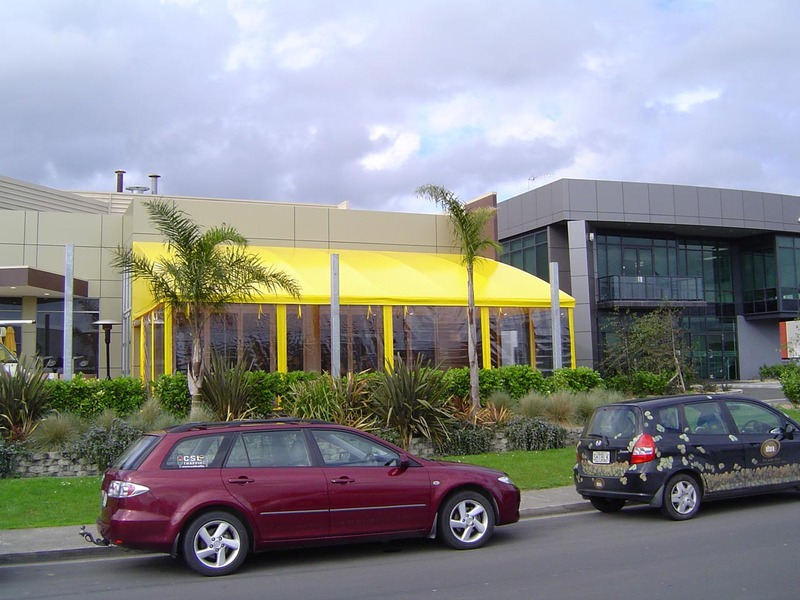 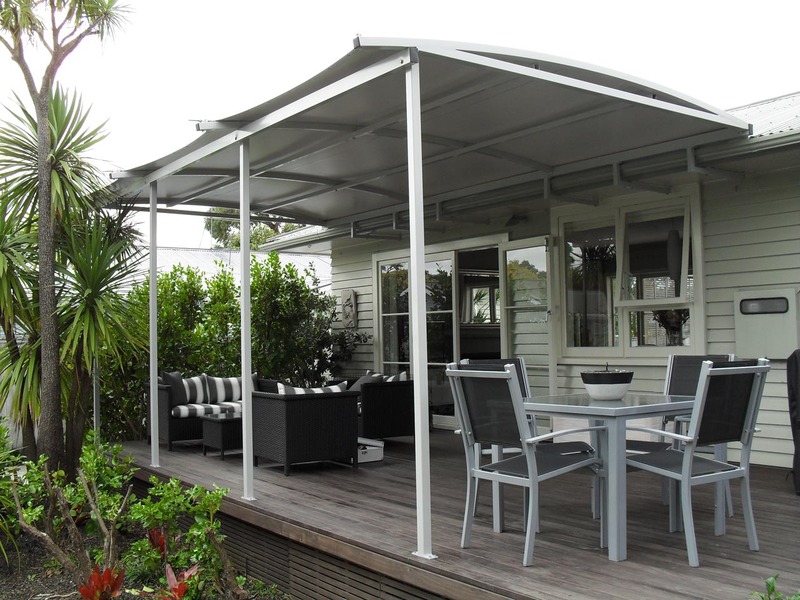 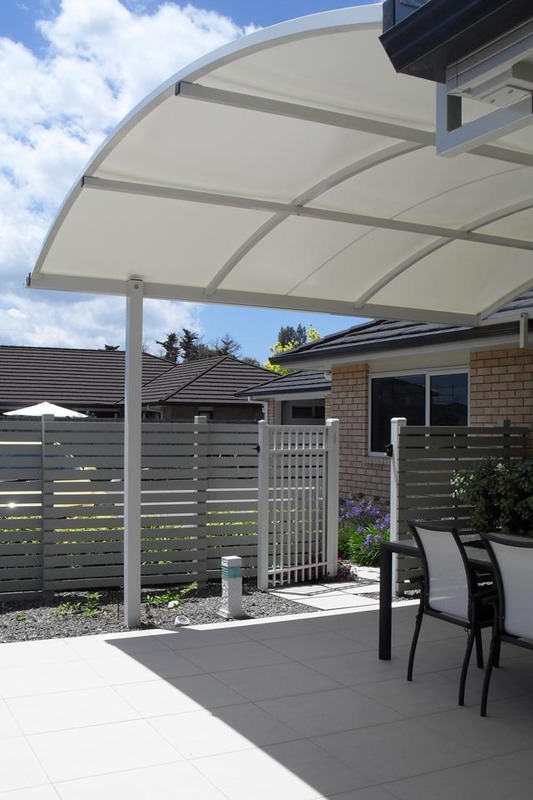 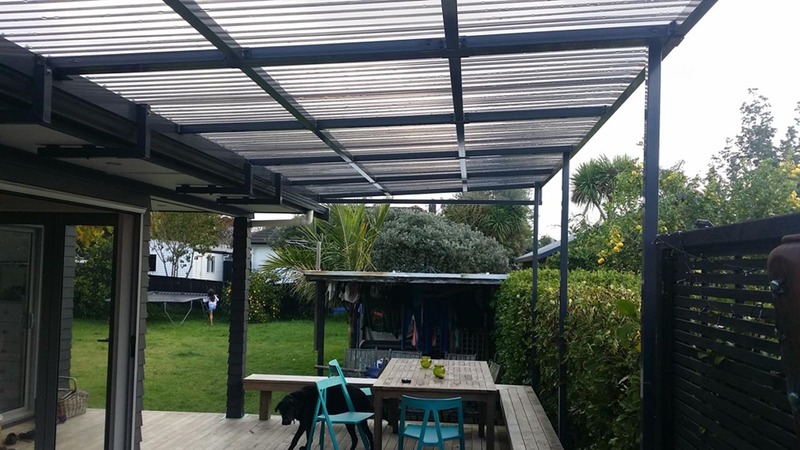 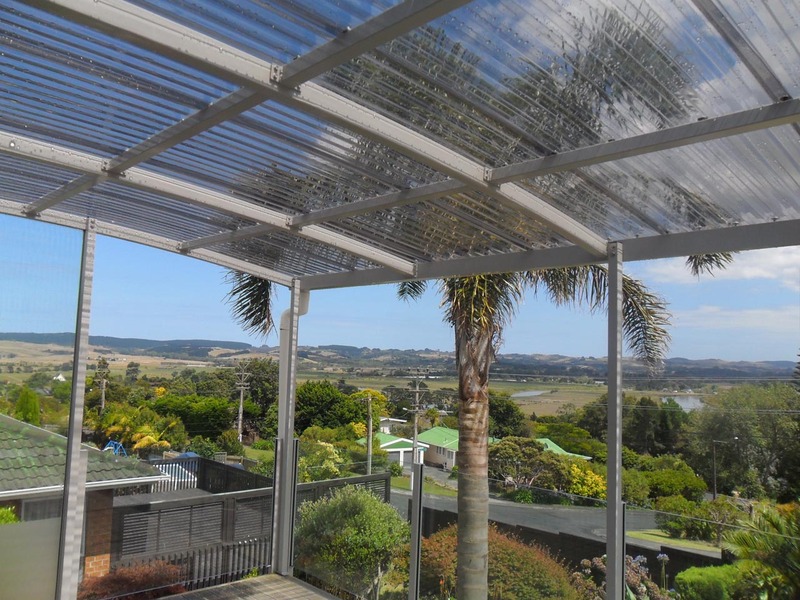 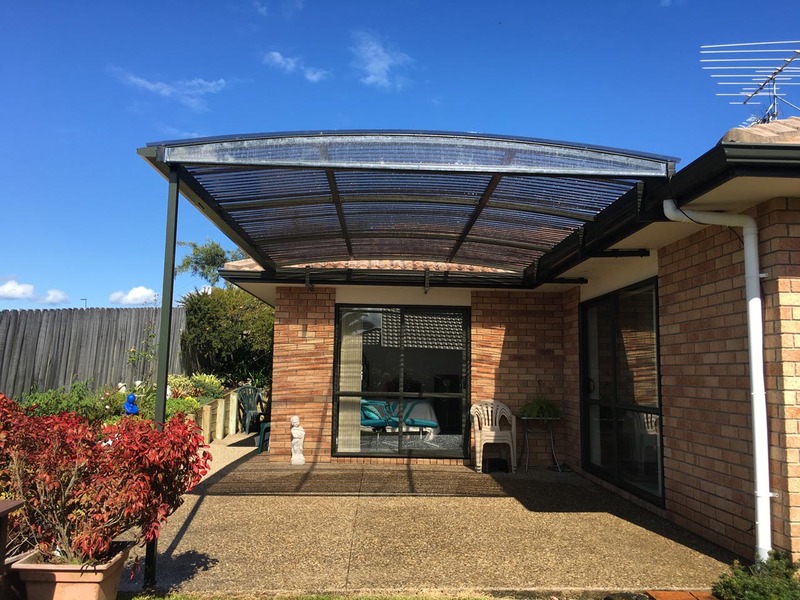 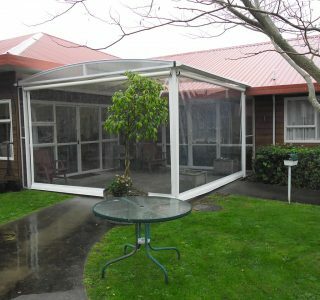 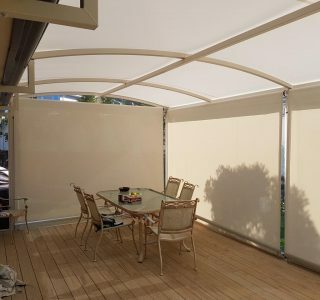 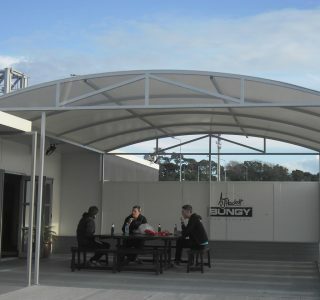 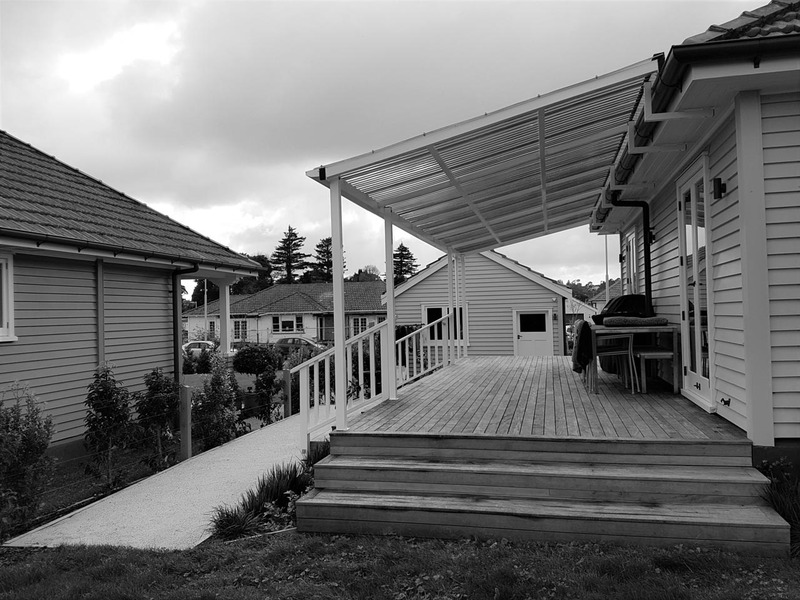 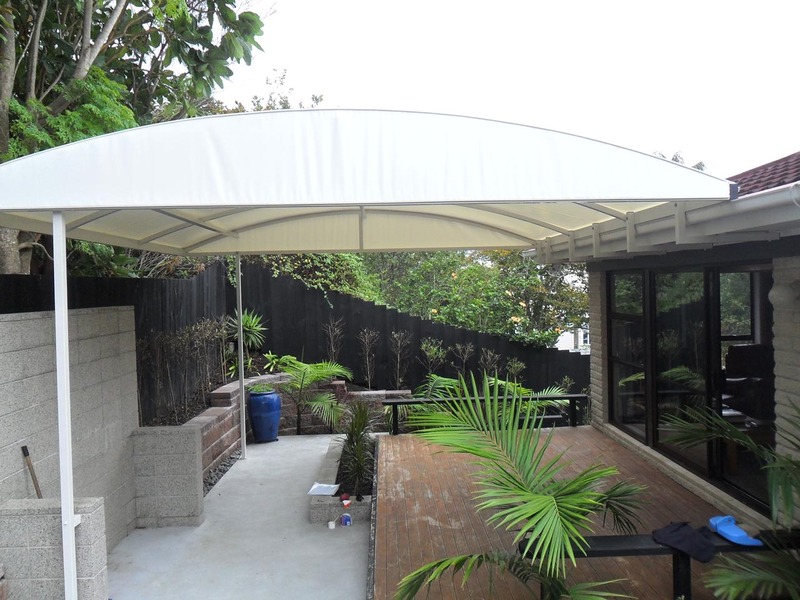 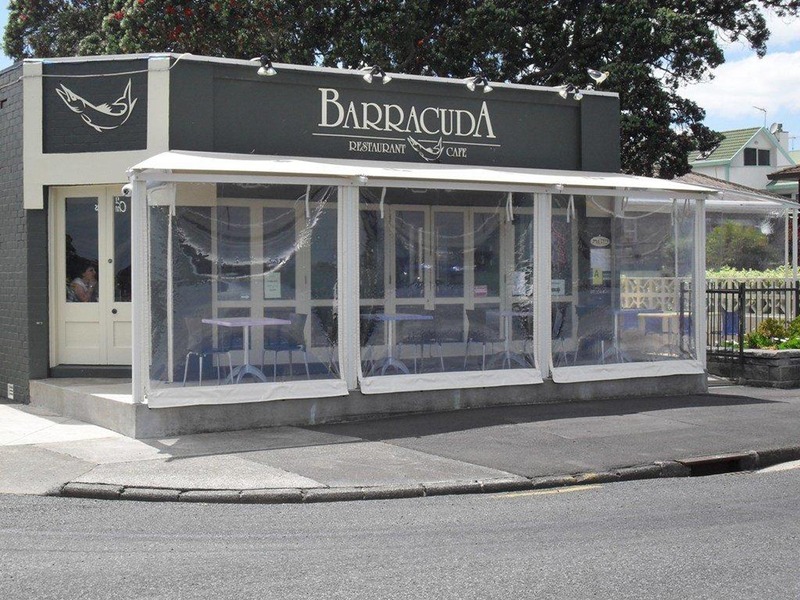 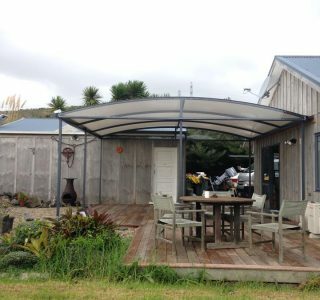 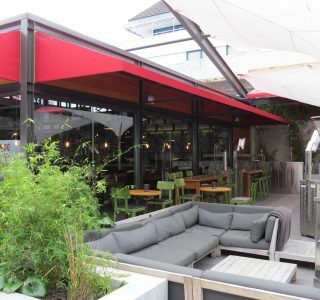 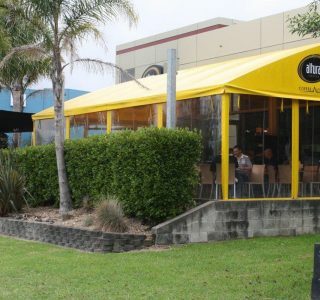 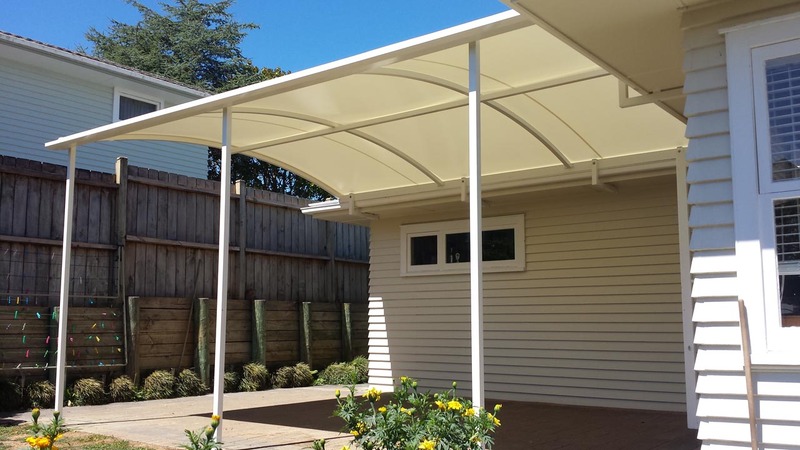 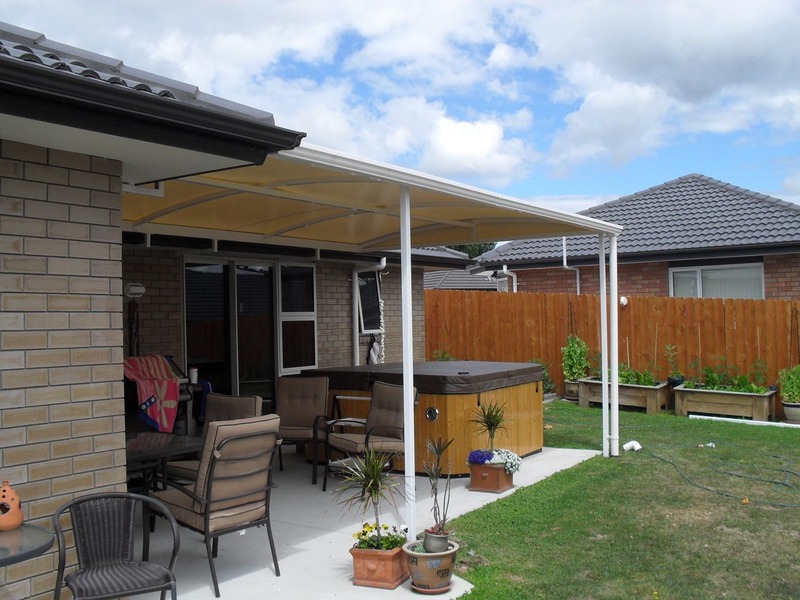 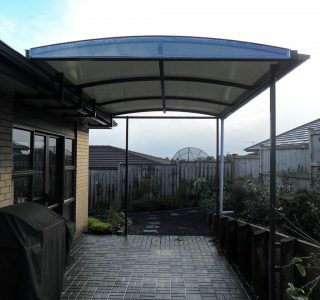 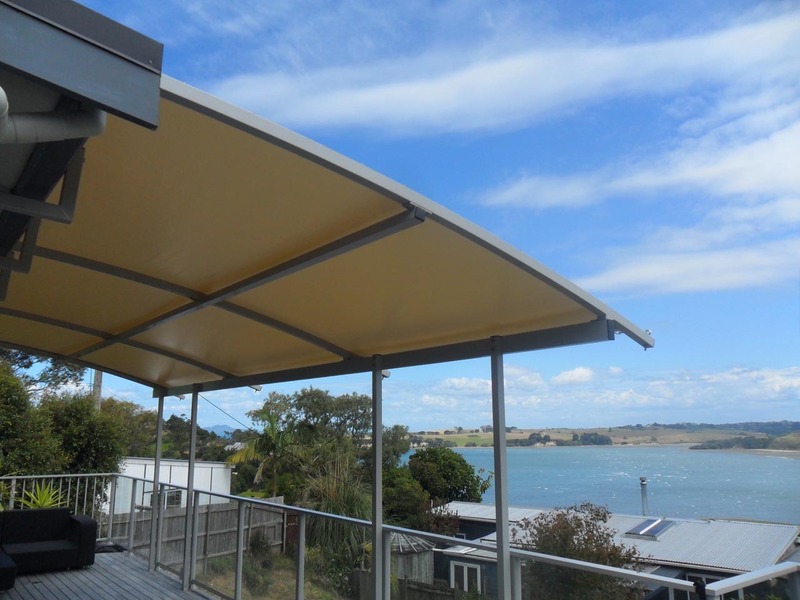 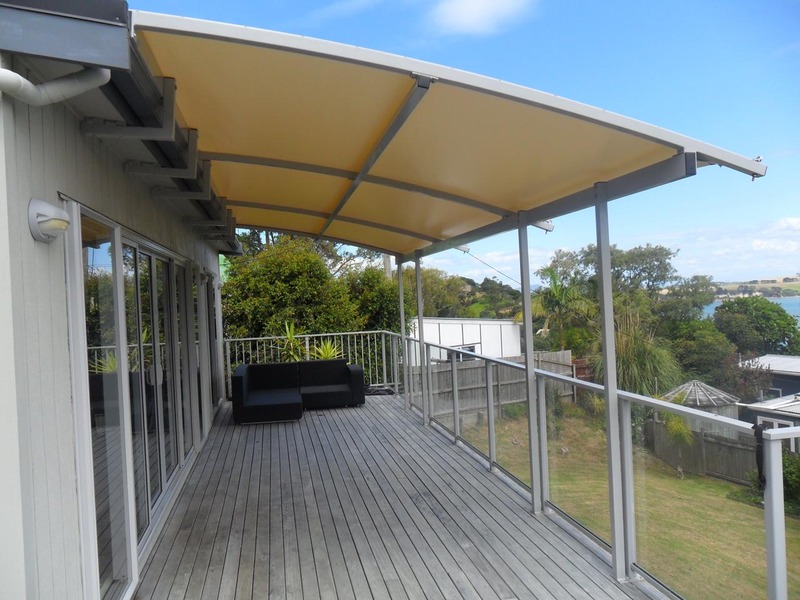 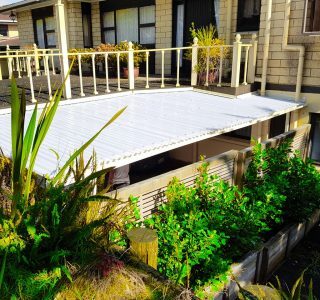 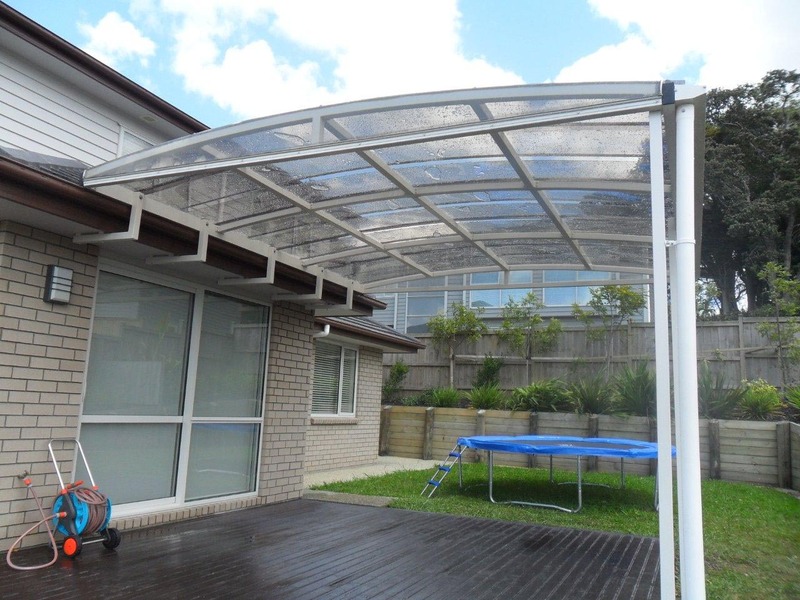 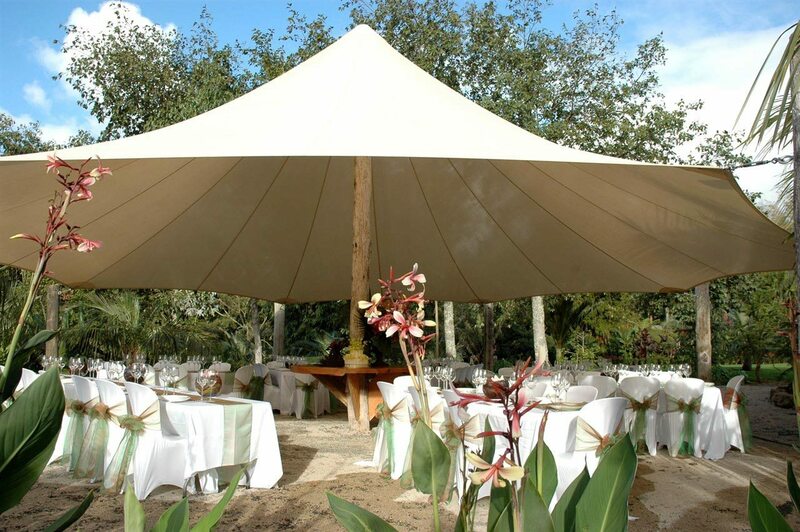 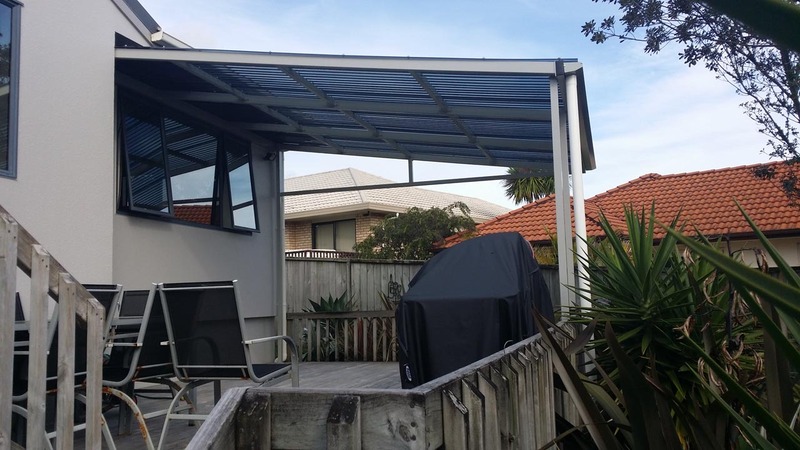 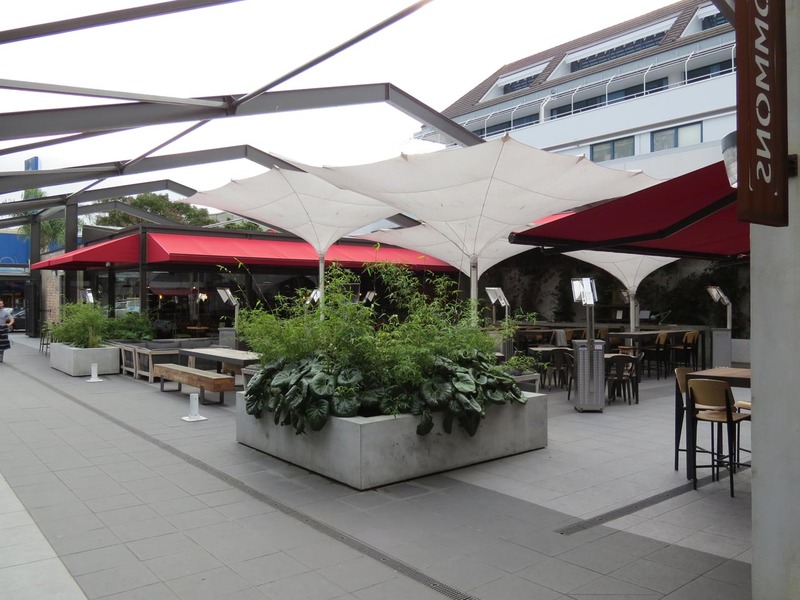 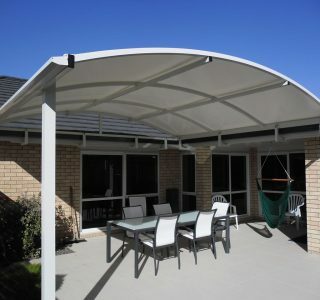 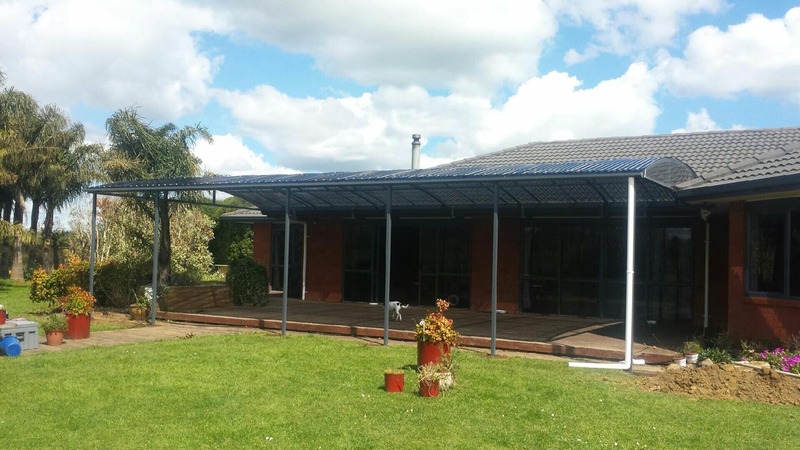 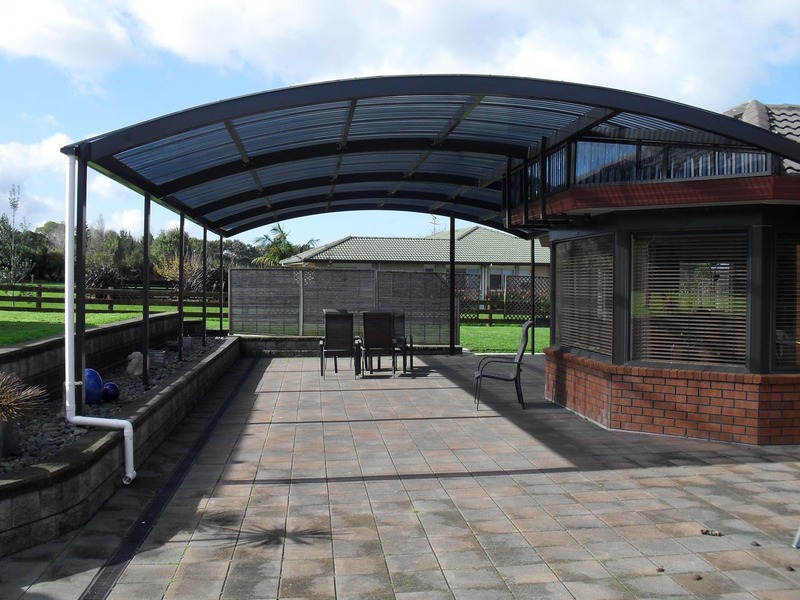 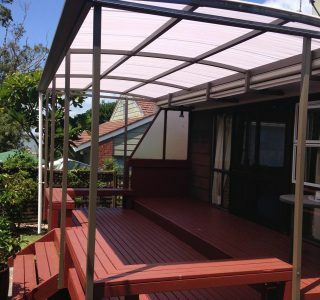 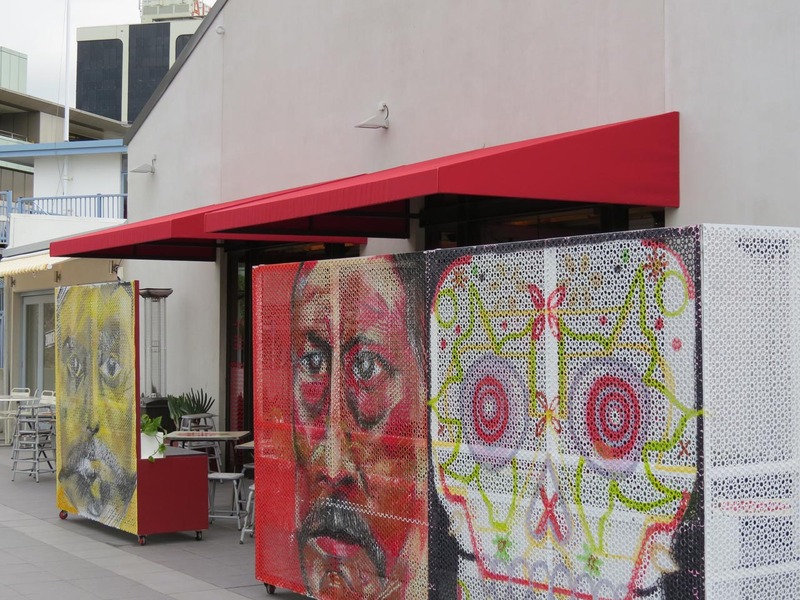 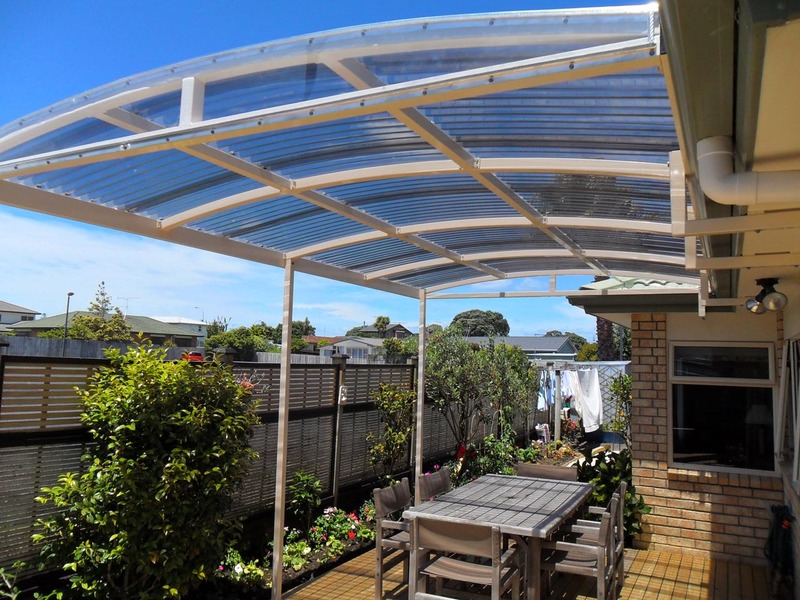 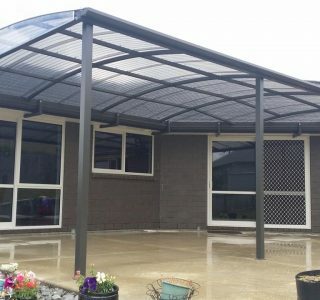 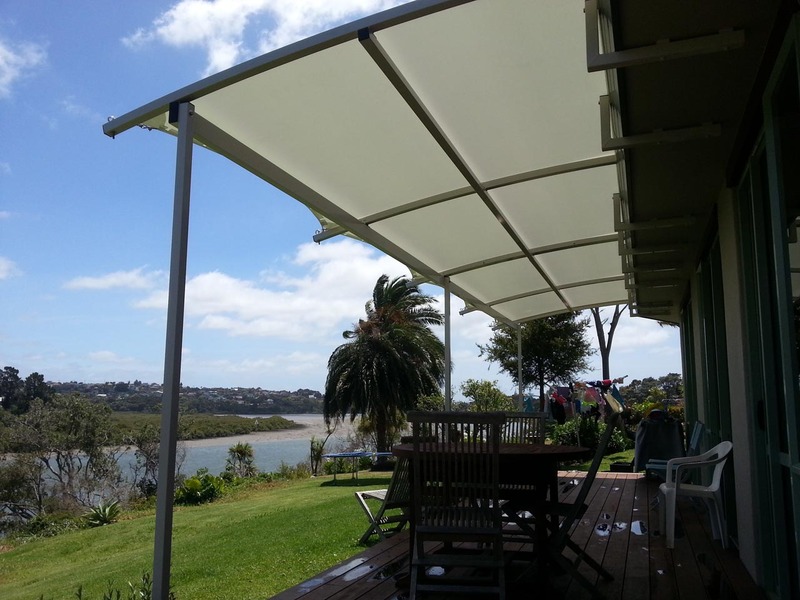 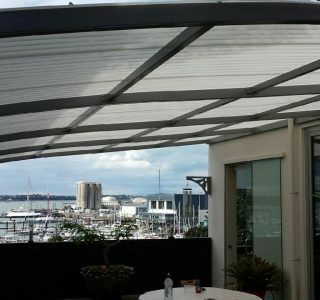 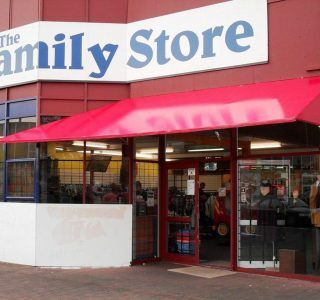 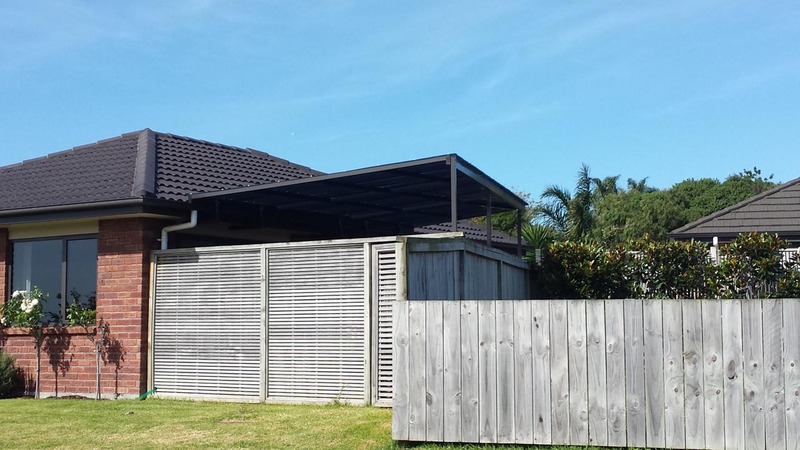 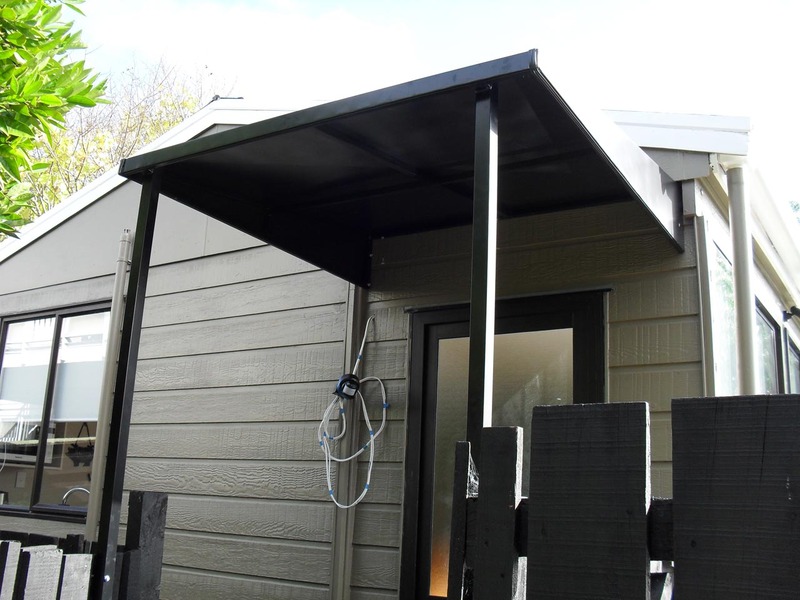 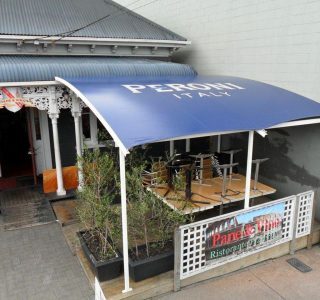 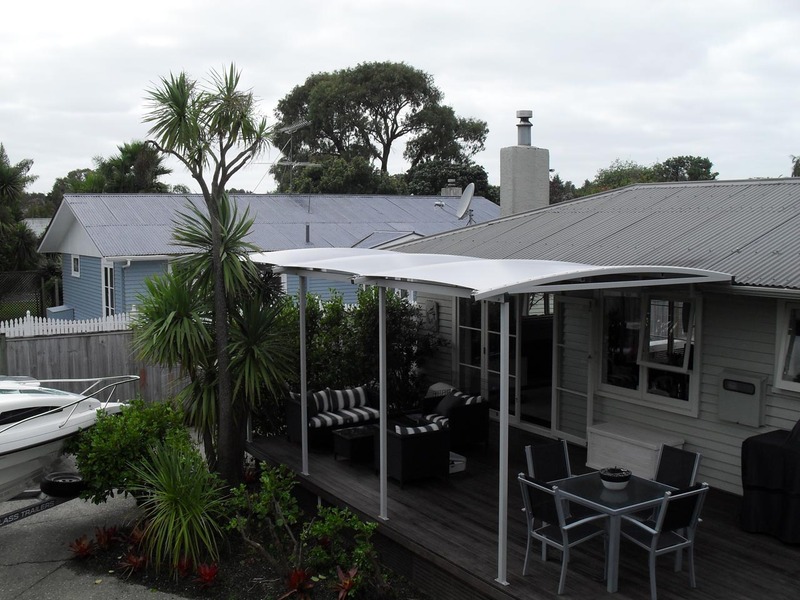 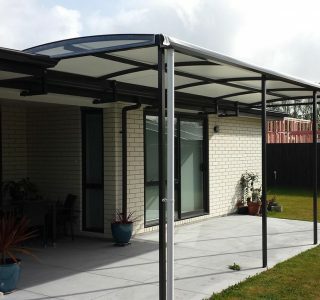 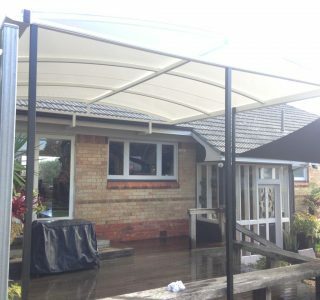 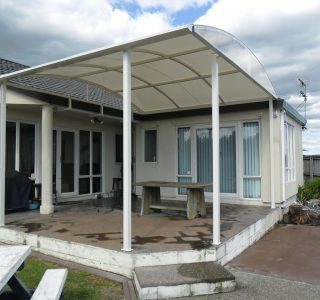 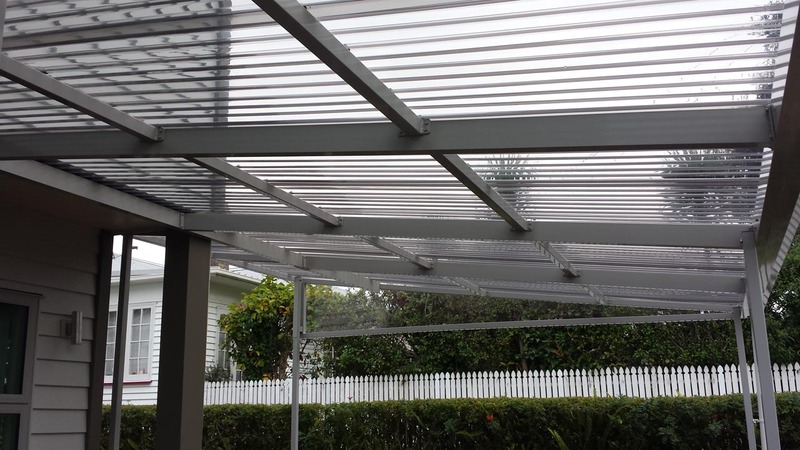 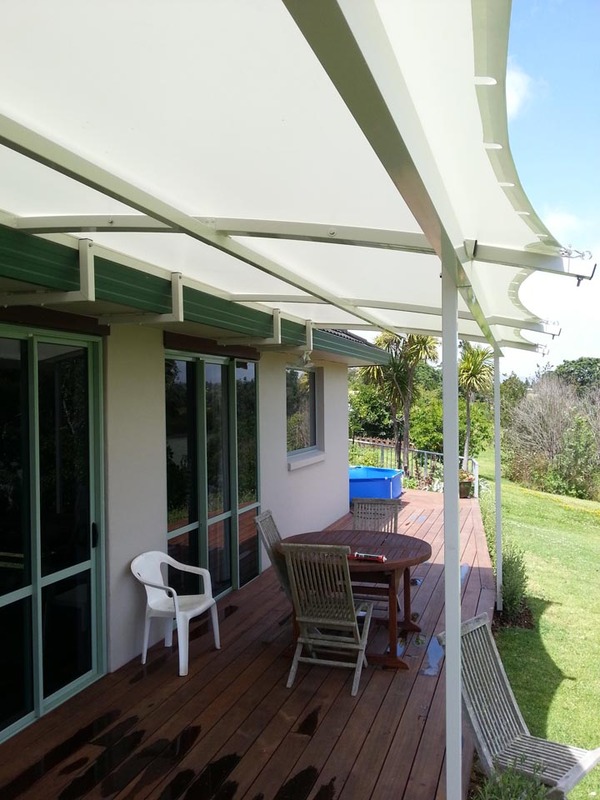 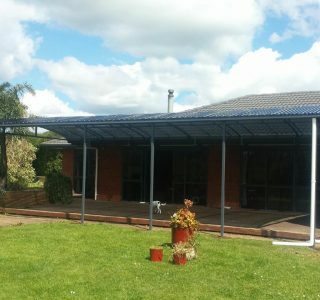 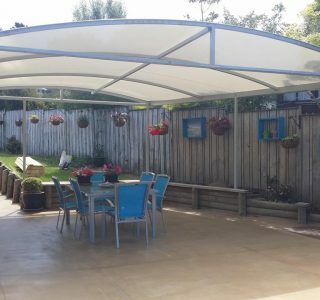 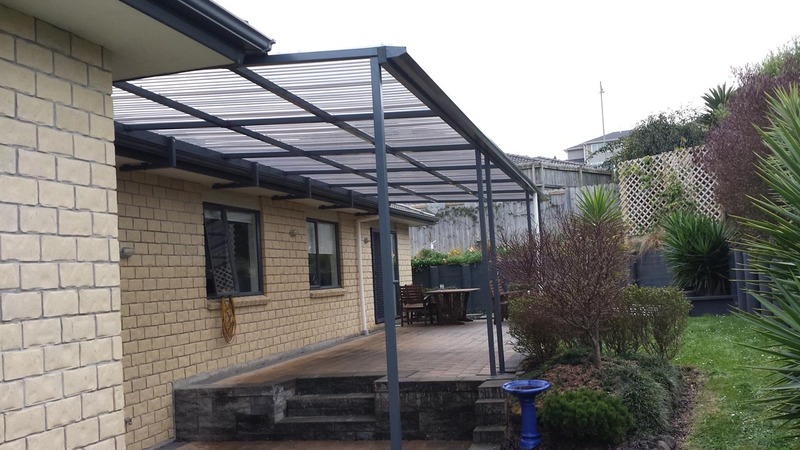 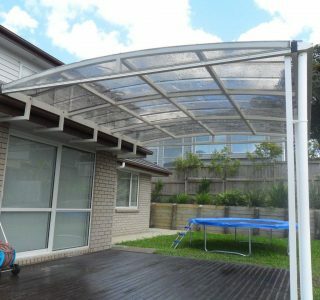 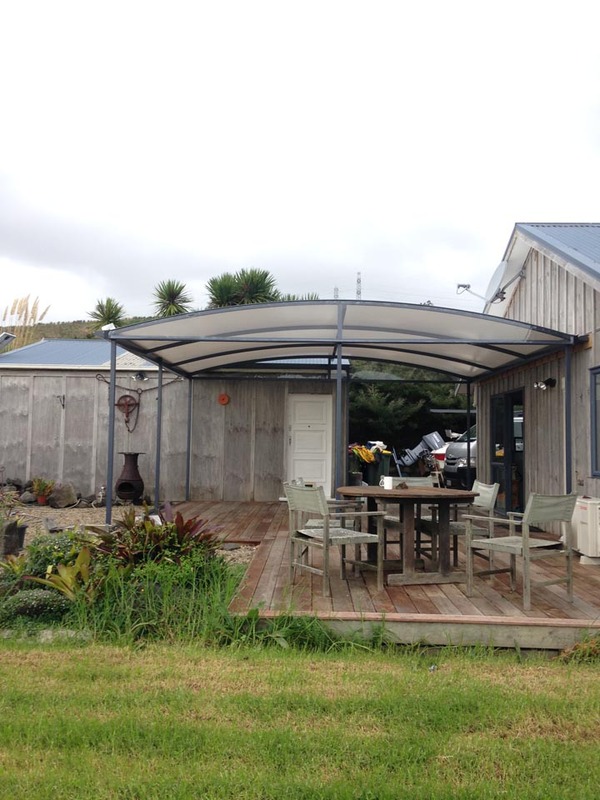 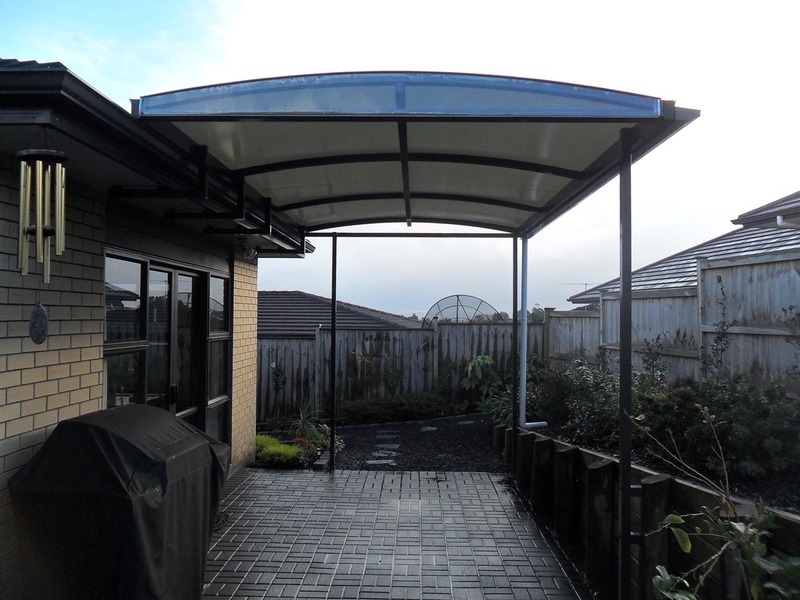 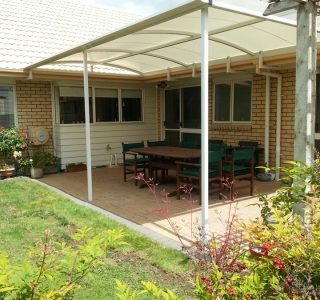 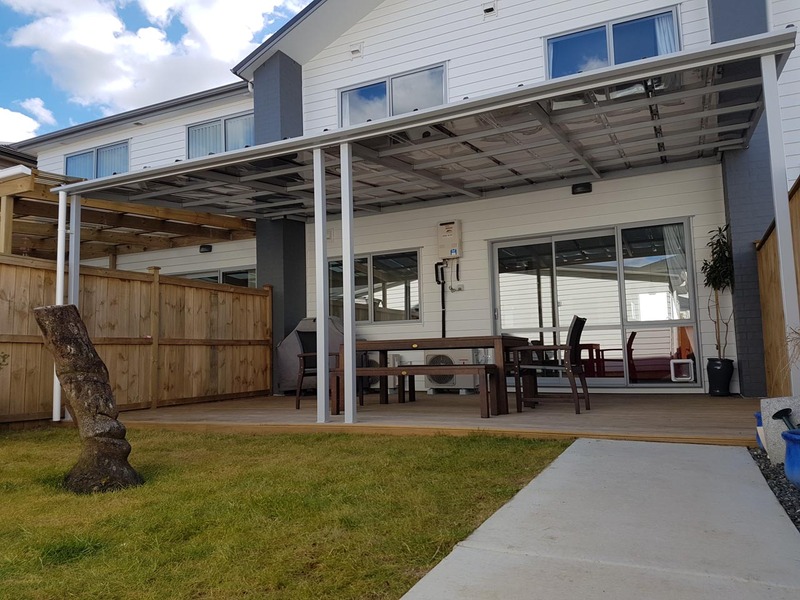 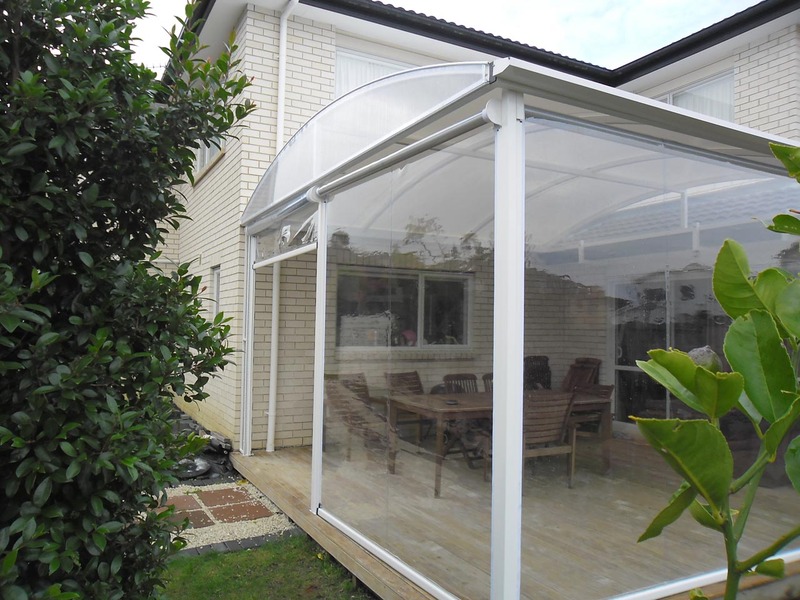 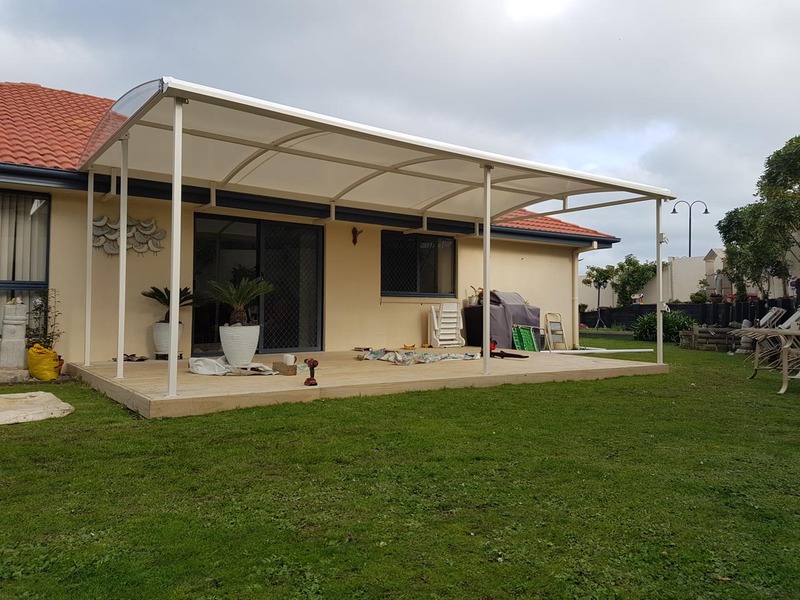 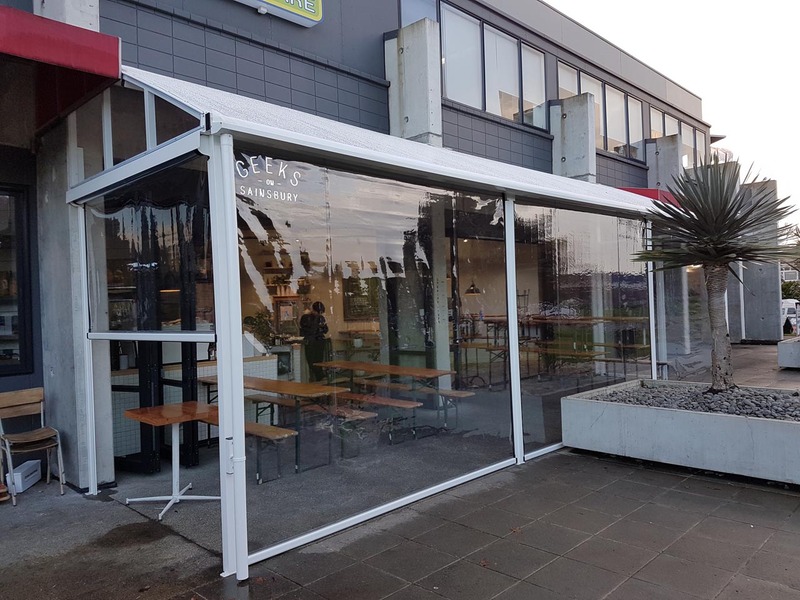 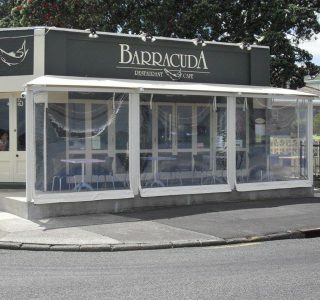 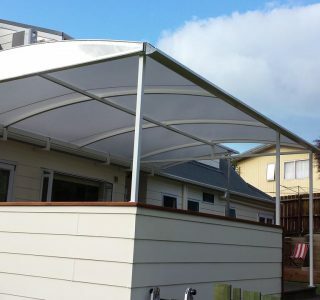 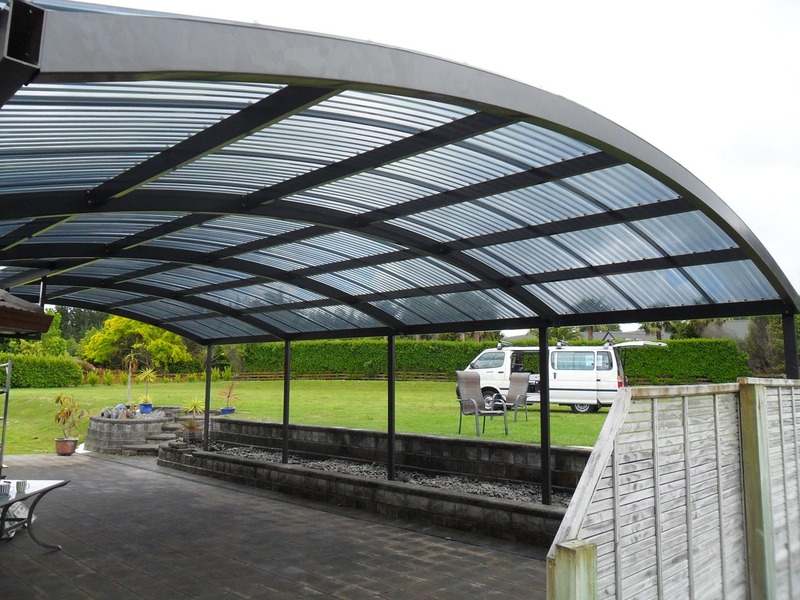 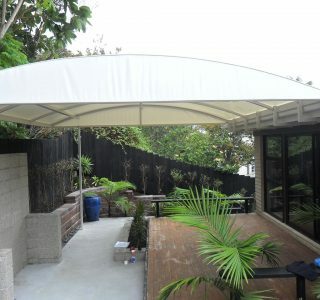 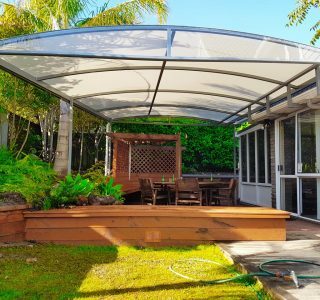 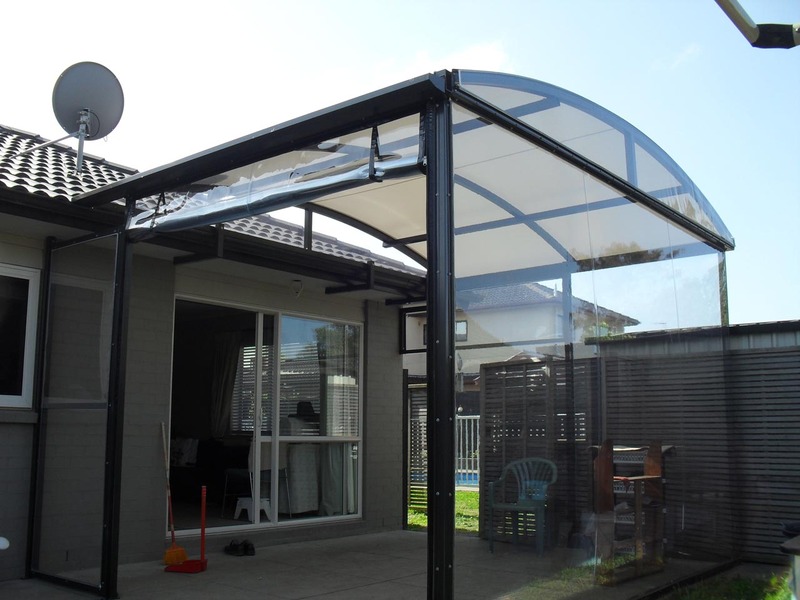 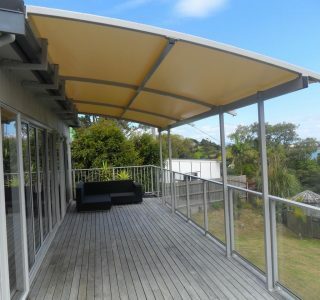 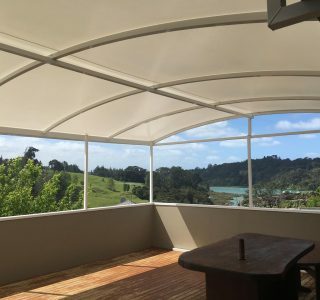 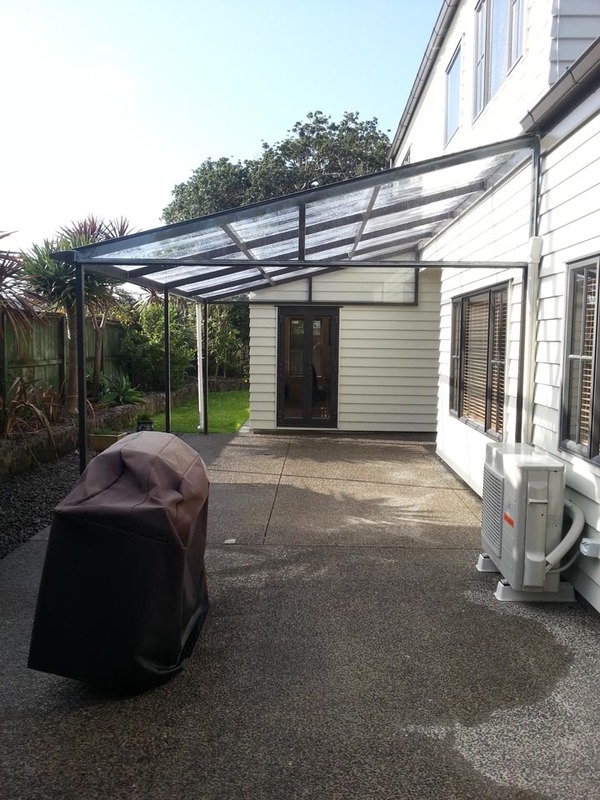 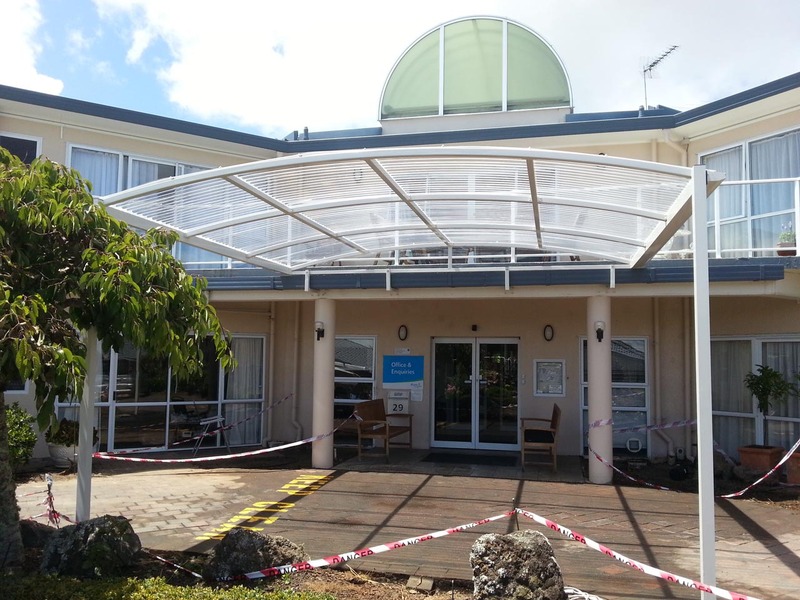 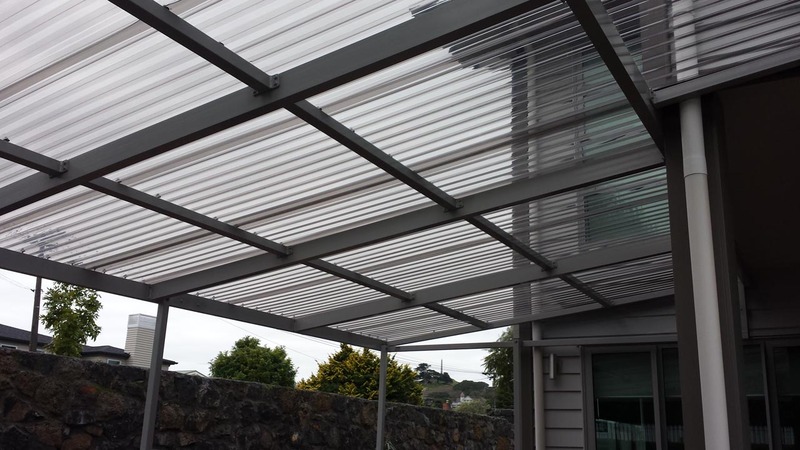 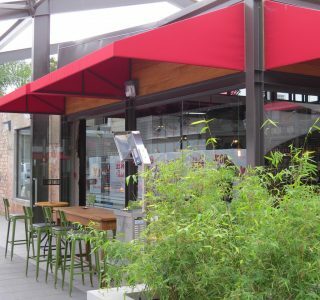 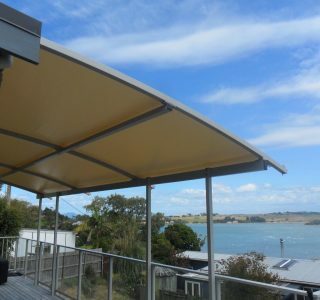 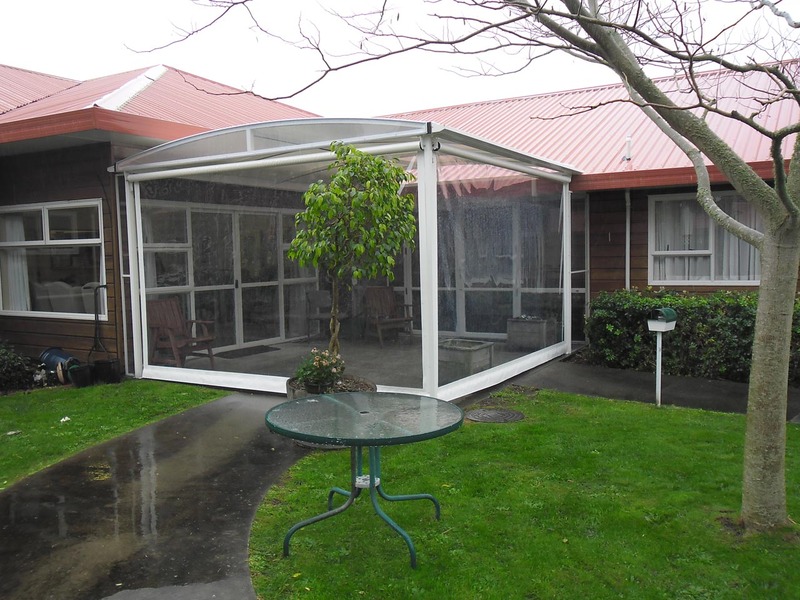 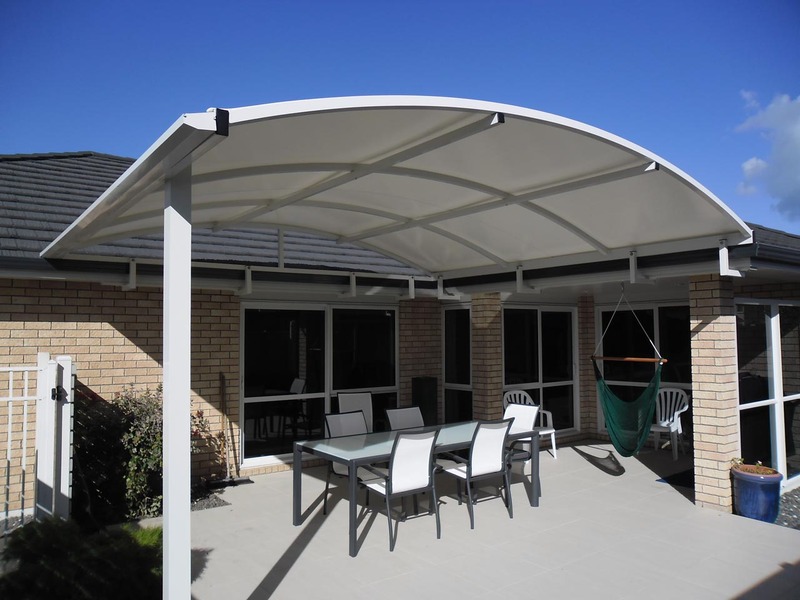 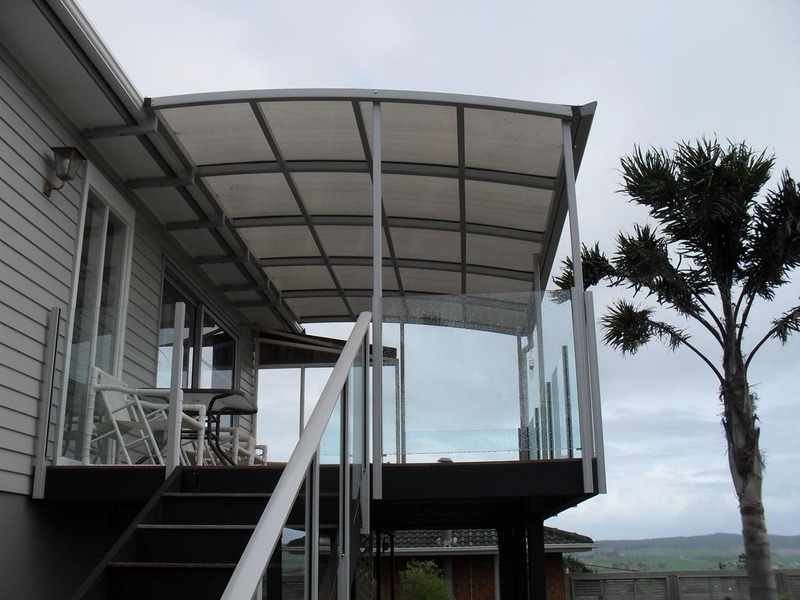 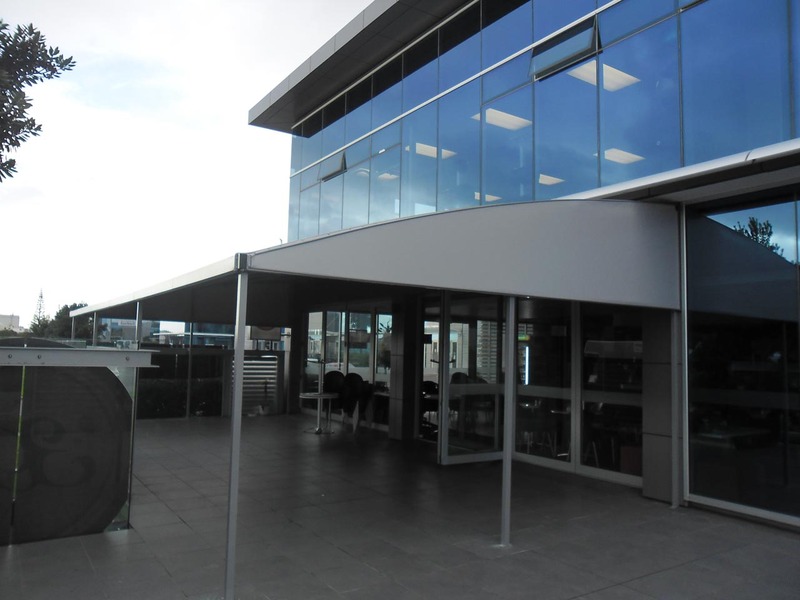 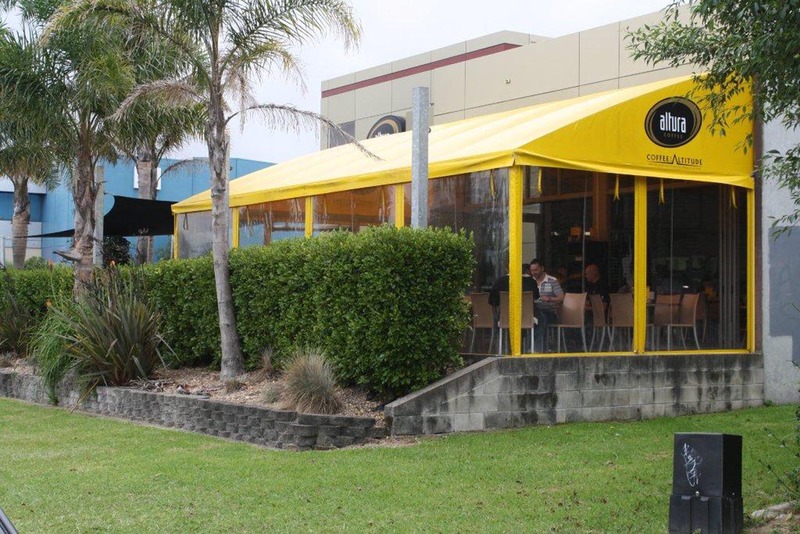 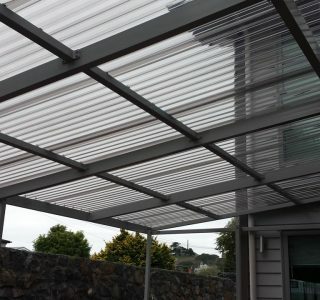 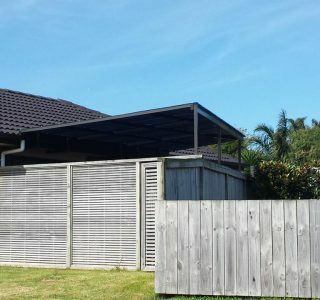 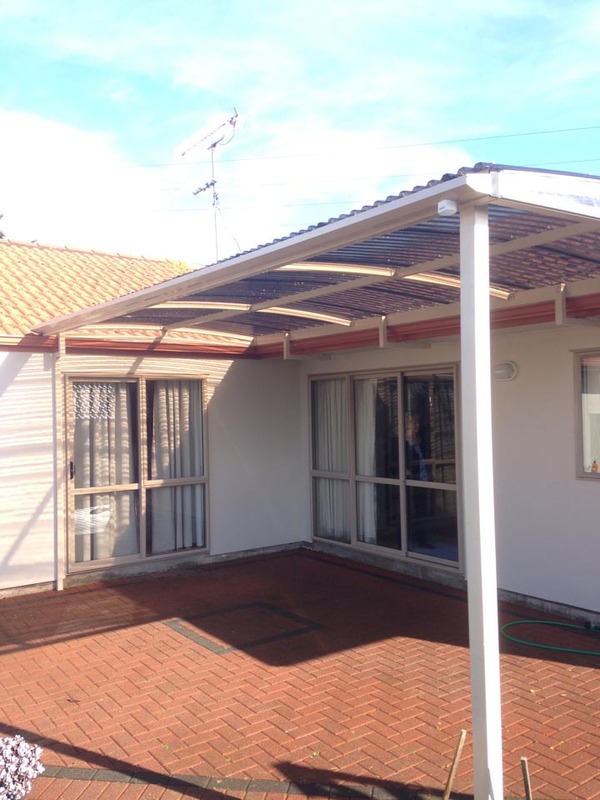 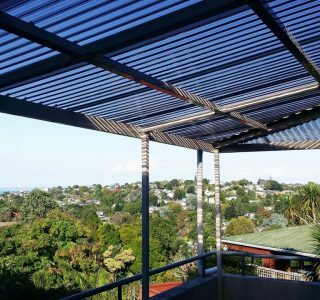 A Tensioned Membrane Structure, otherwise known as a TMS will complete your outdoor area and offers great coverage. 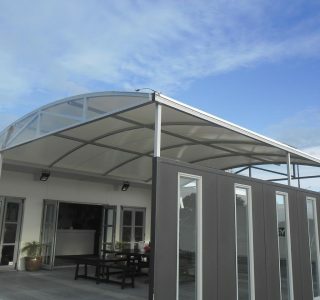 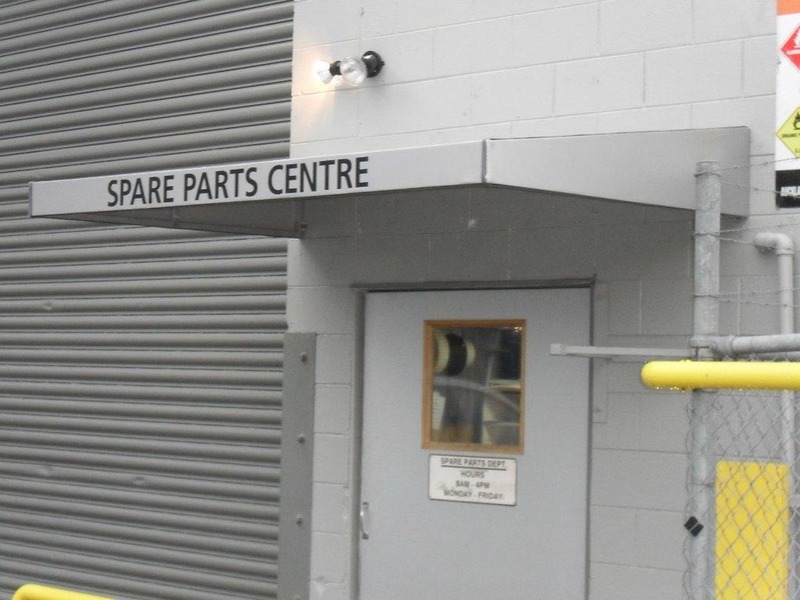 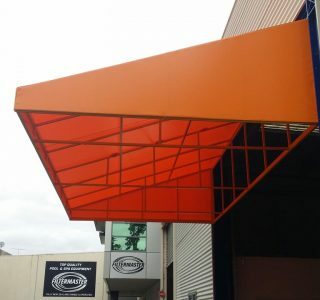 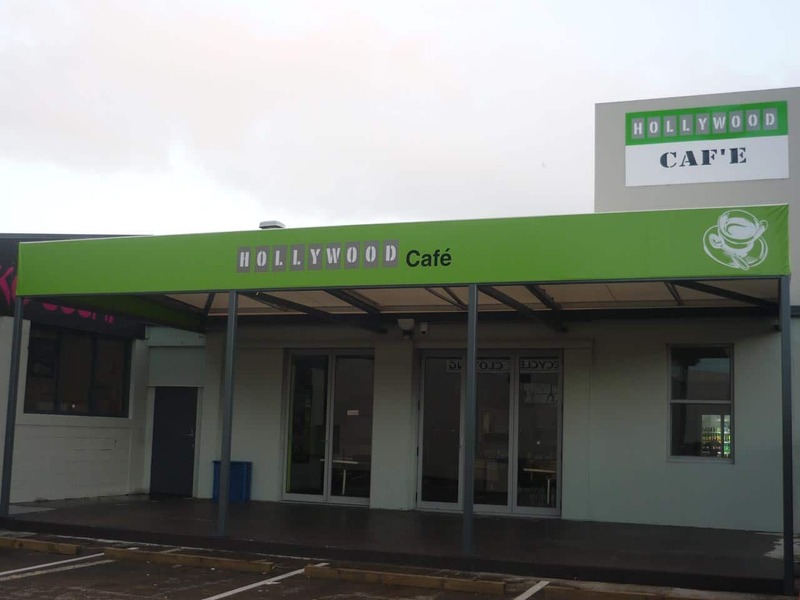 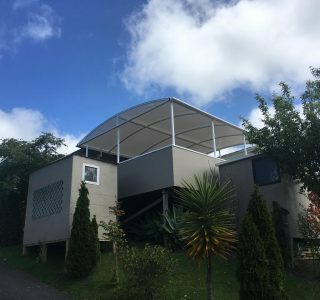 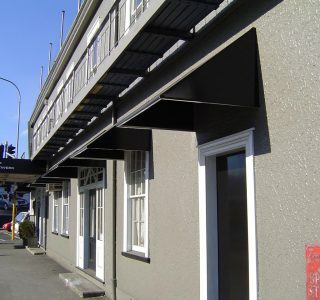 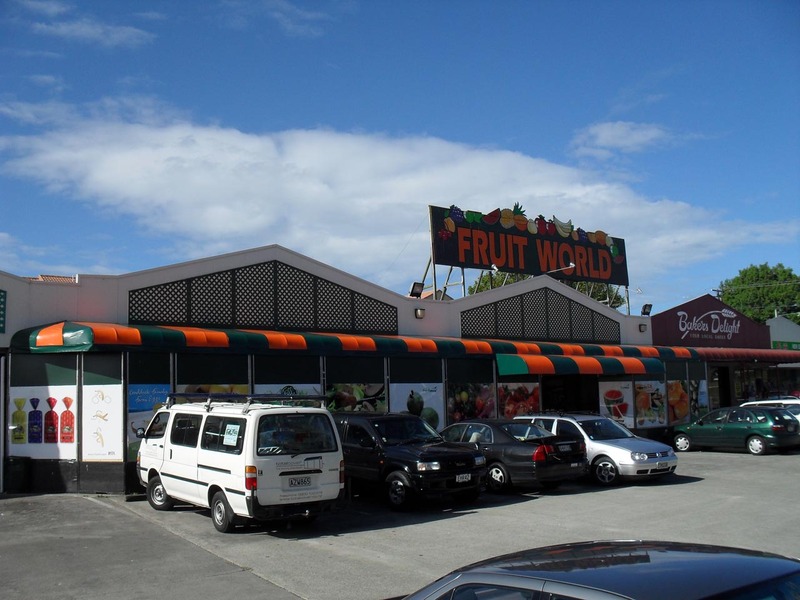 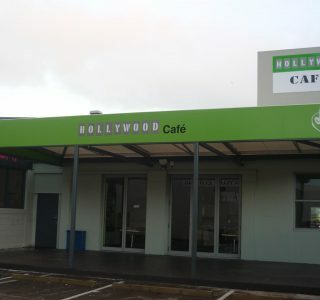 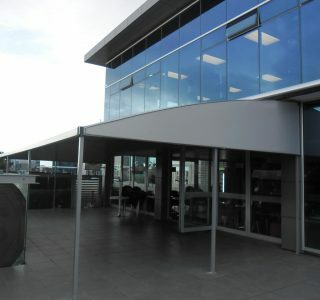 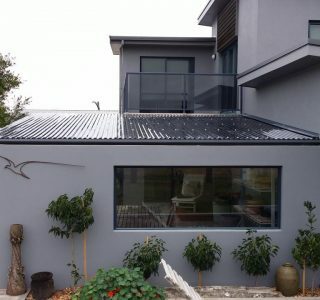 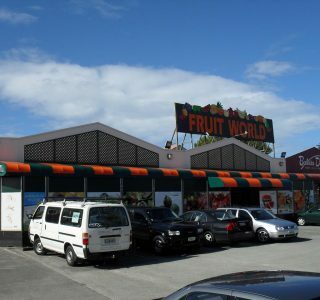 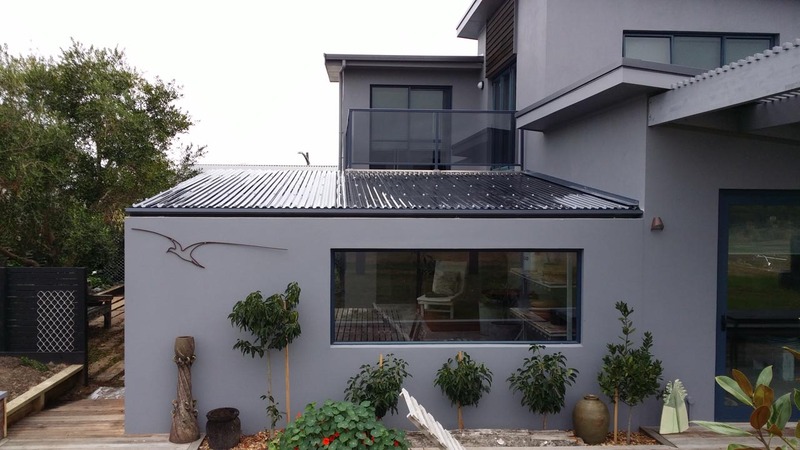 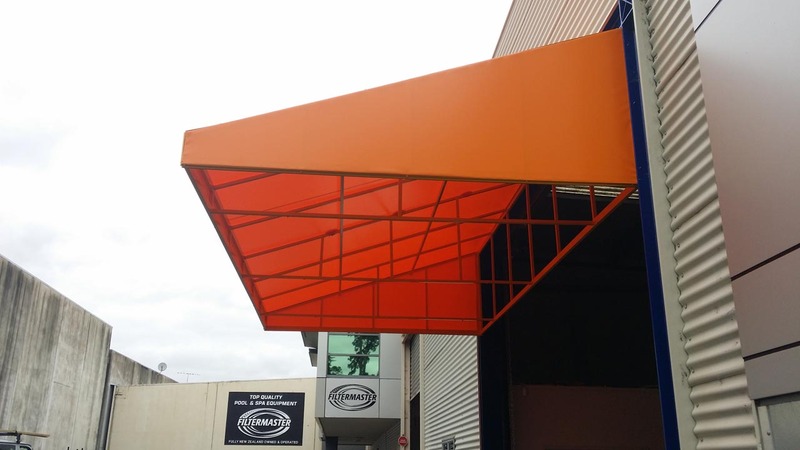 A TMS has a full aluminium frame with a curved roof. 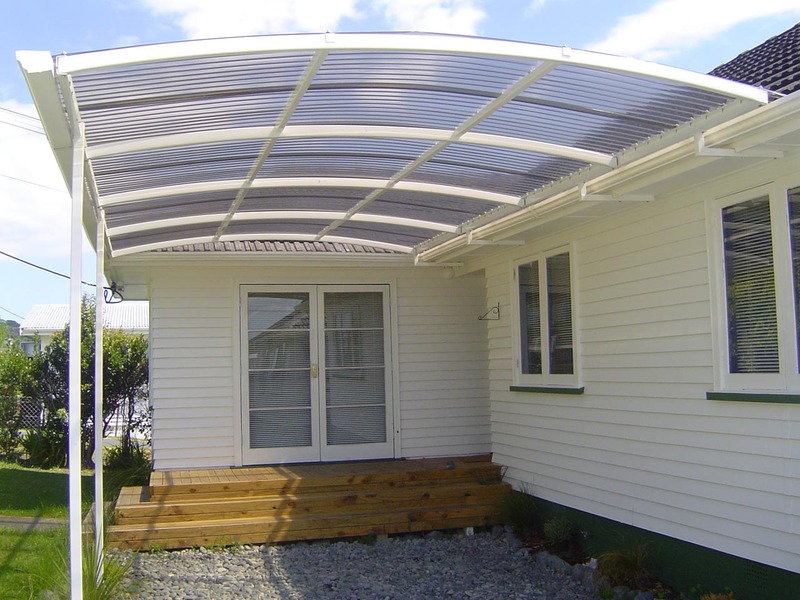 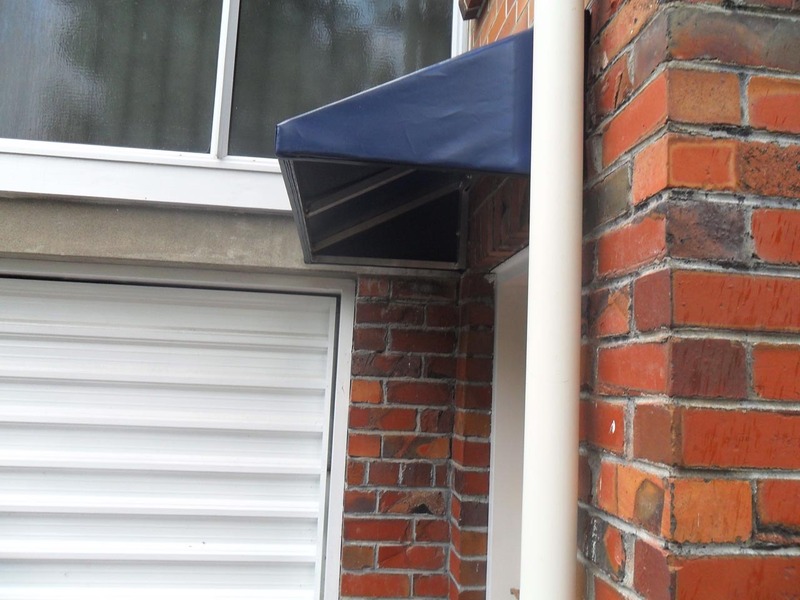 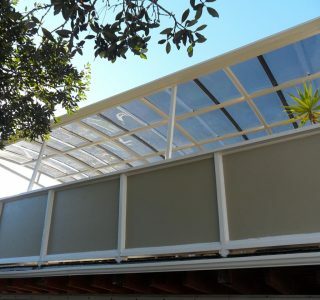 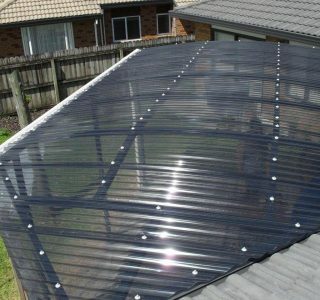 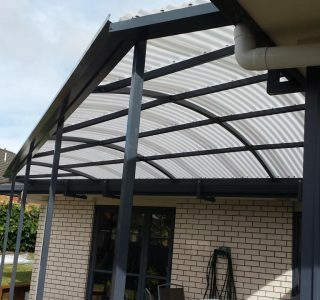 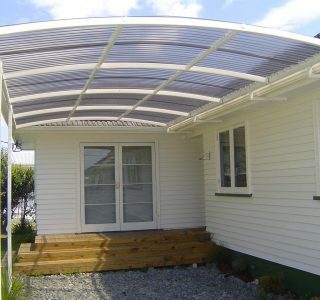 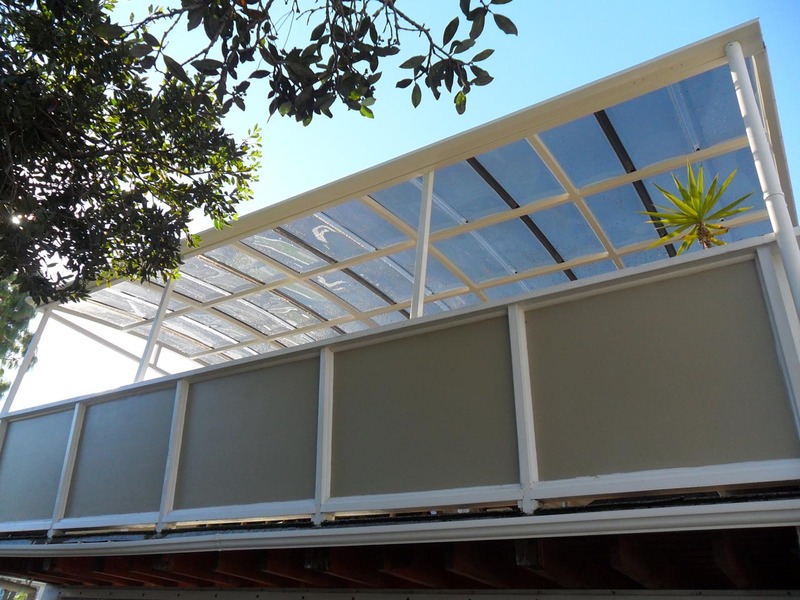 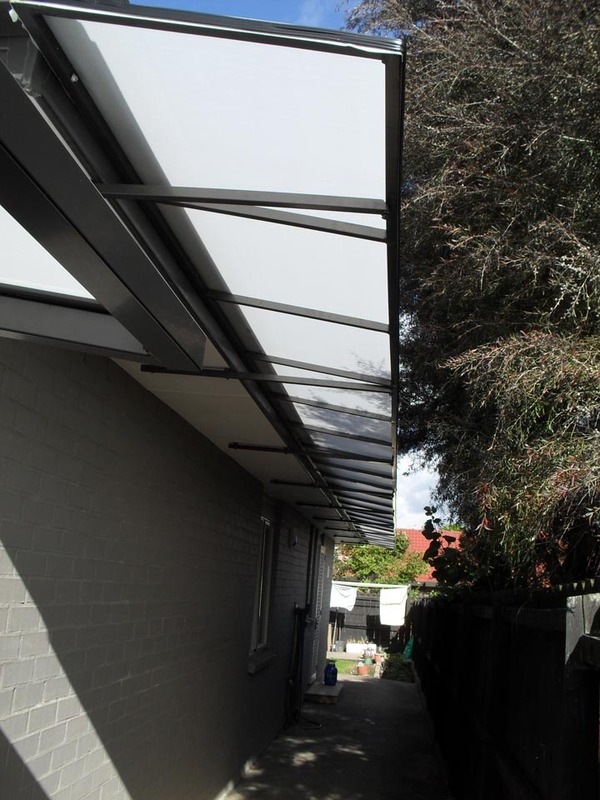 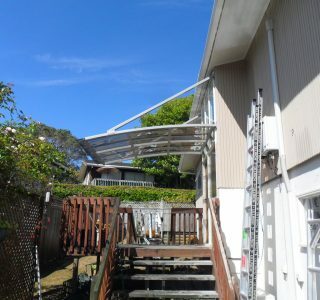 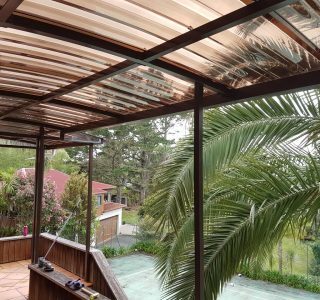 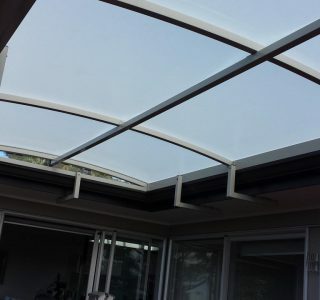 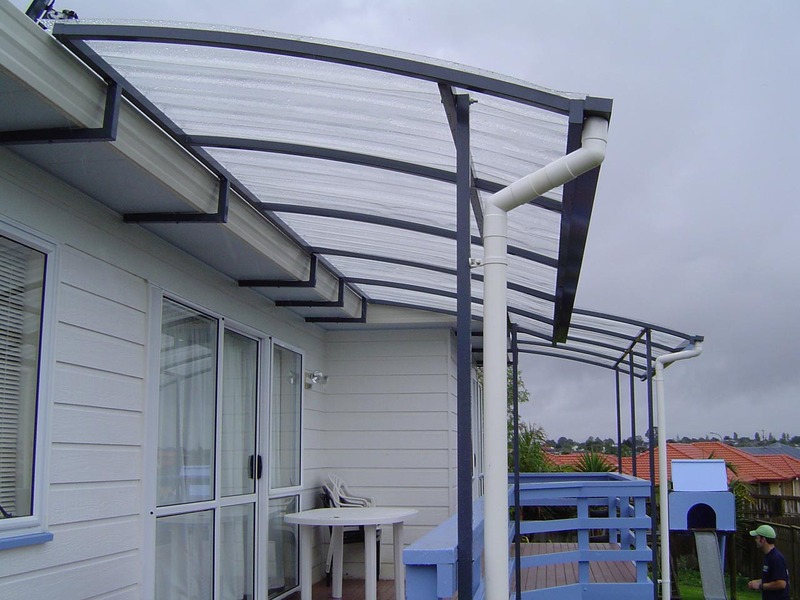 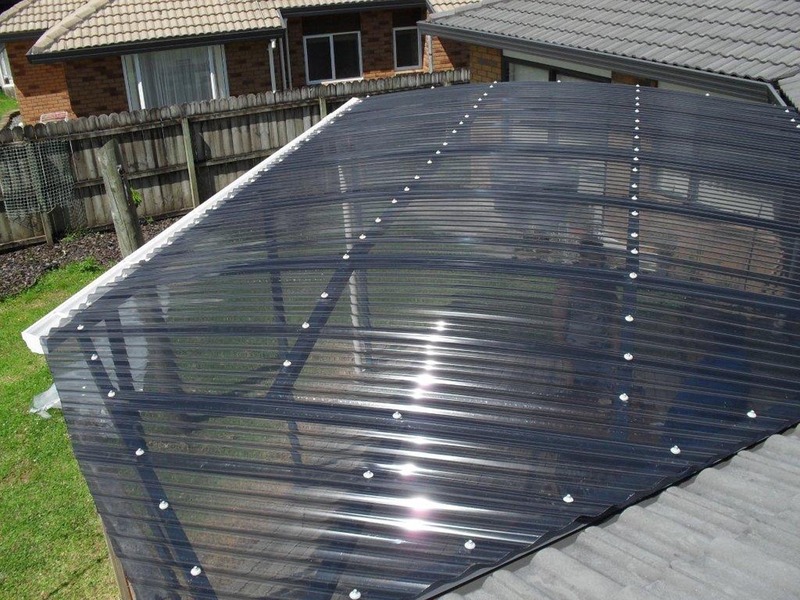 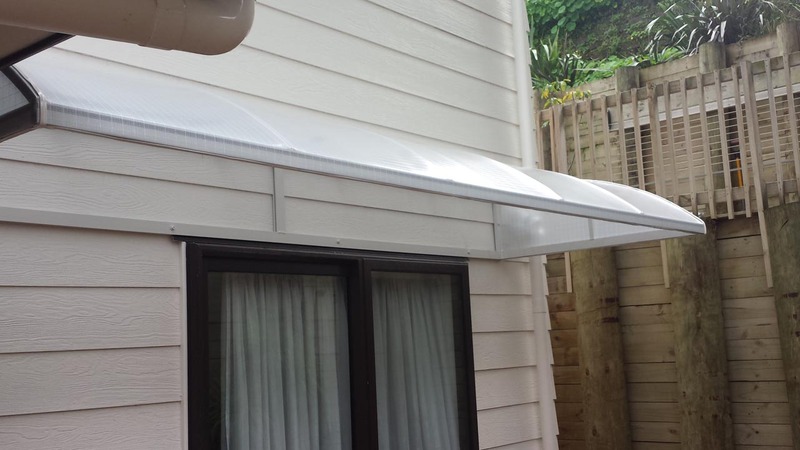 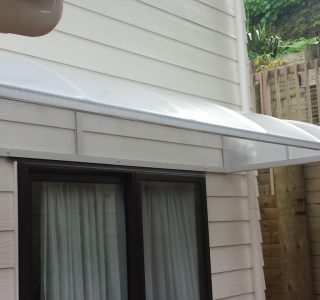 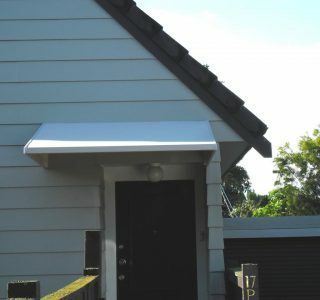 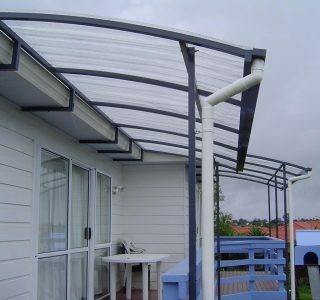 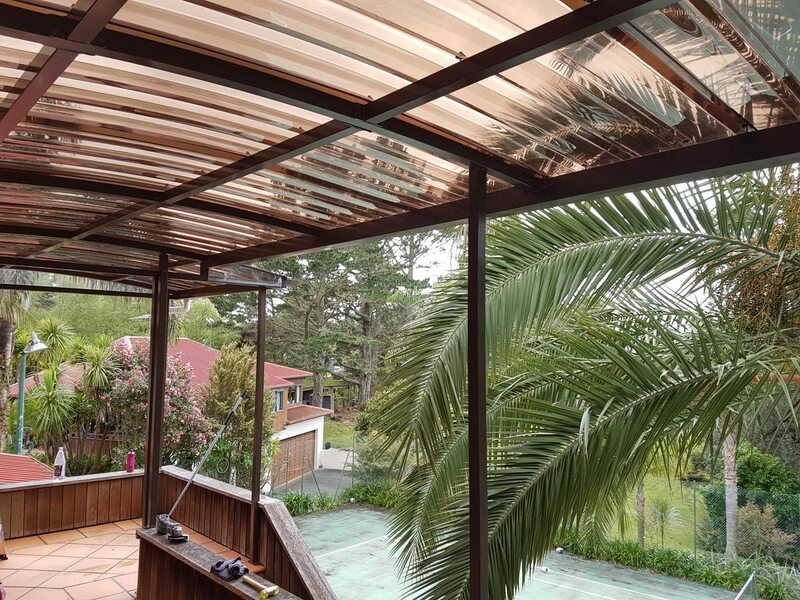 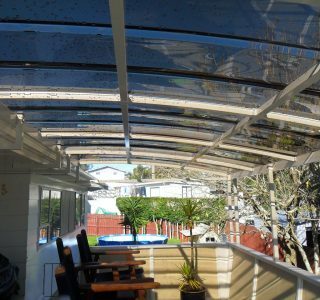 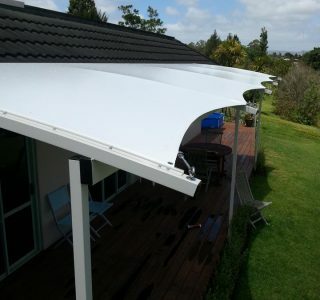 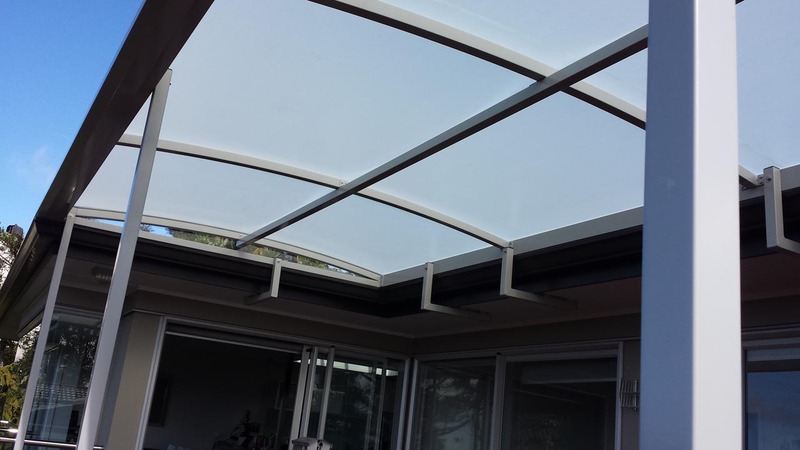 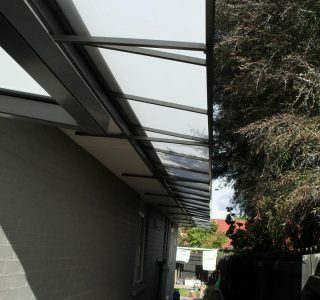 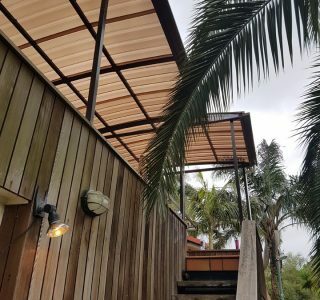 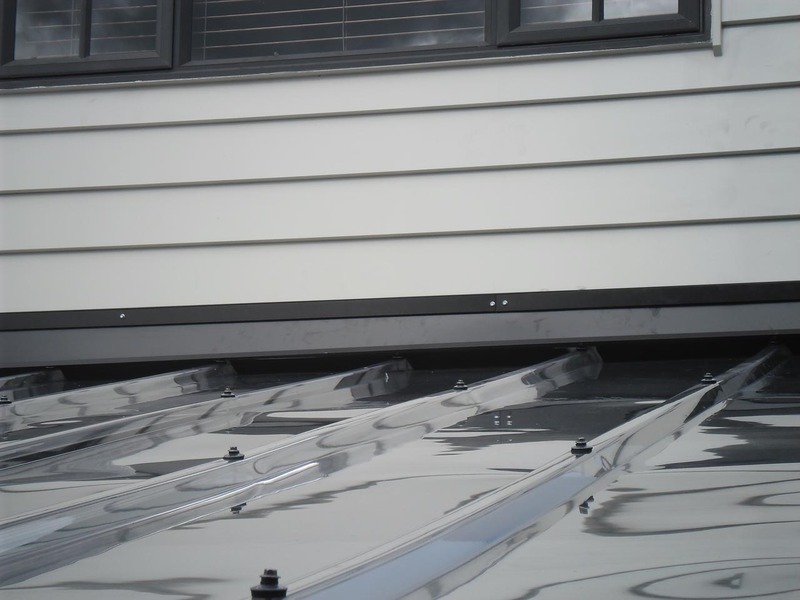 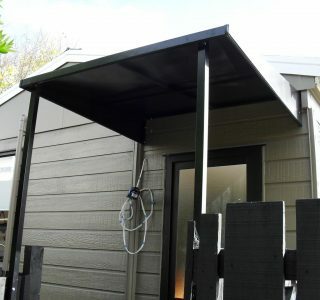 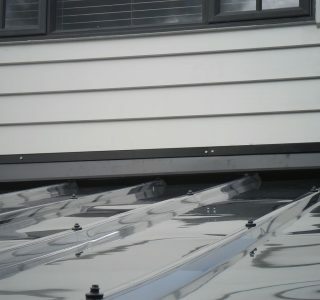 There must be a curve in the roof line to allow for the PVC fabric to wrap and tension around the roof frame. 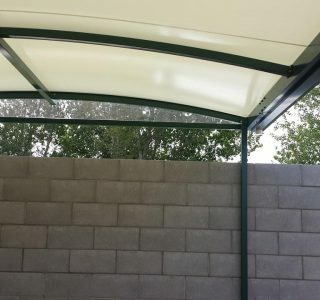 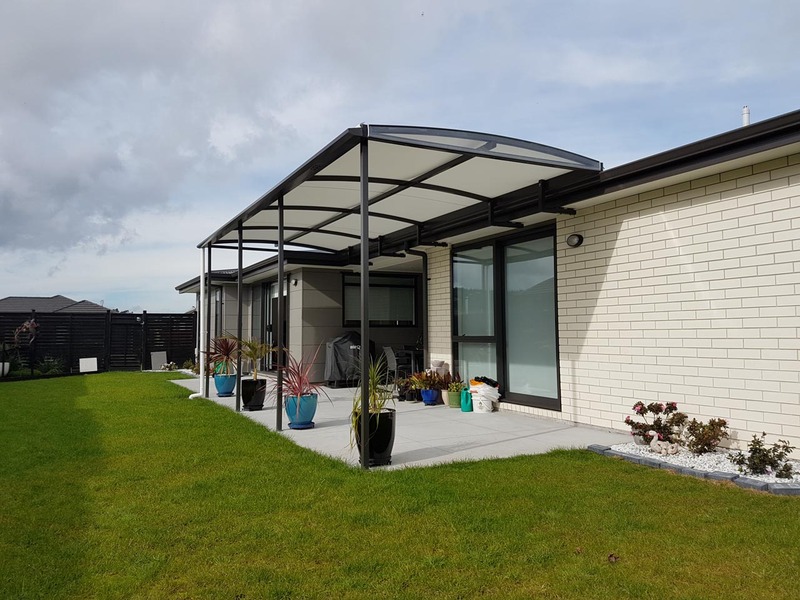 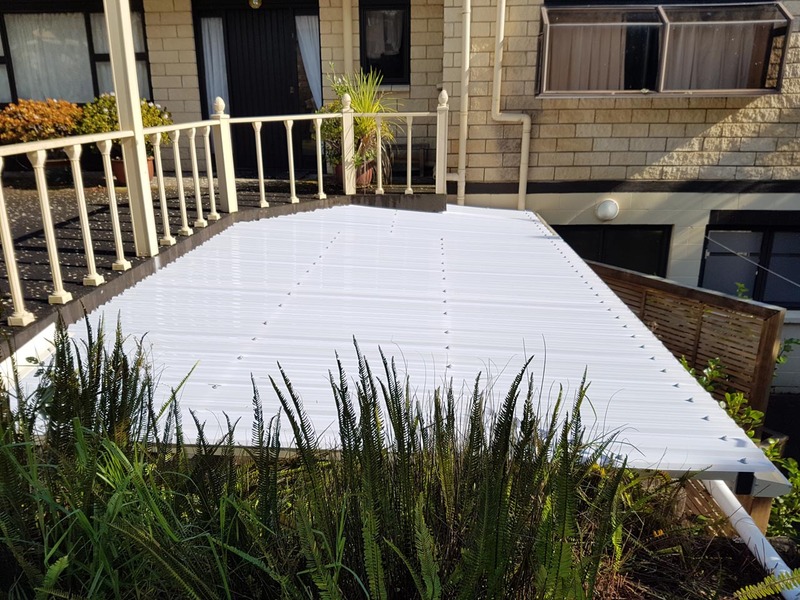 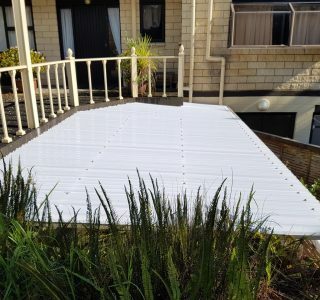 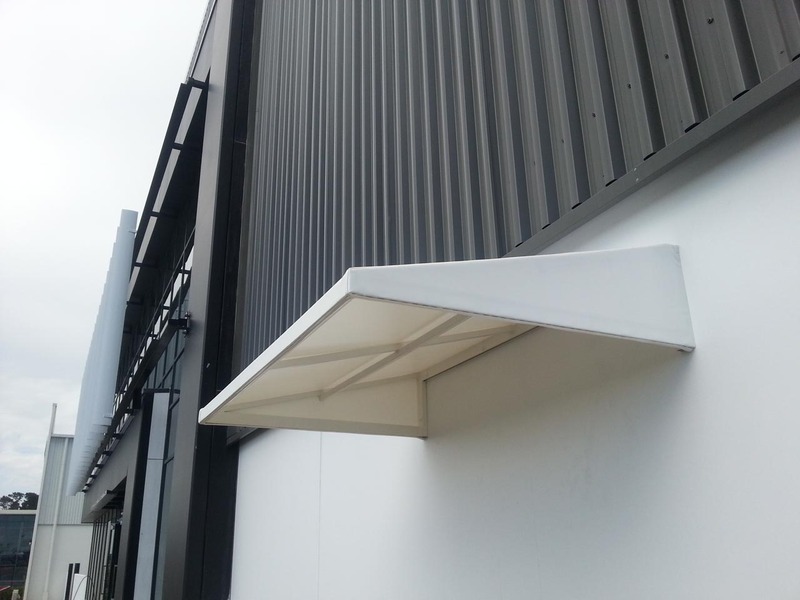 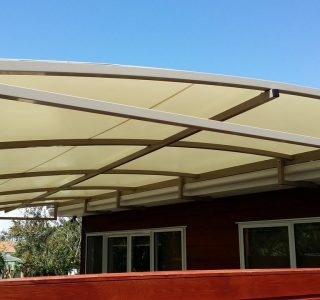 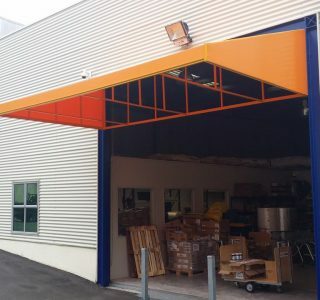 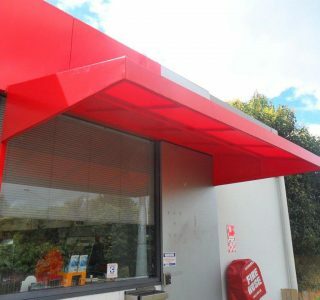 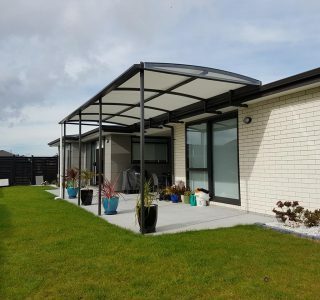 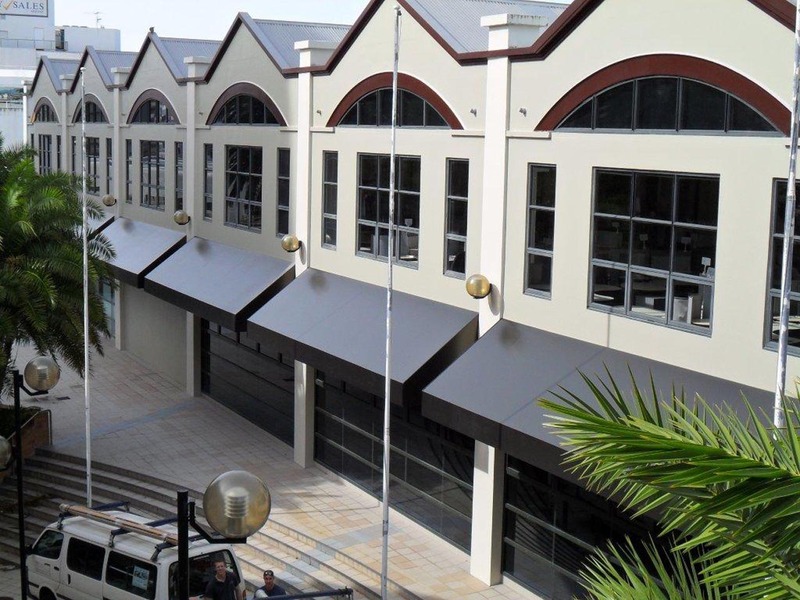 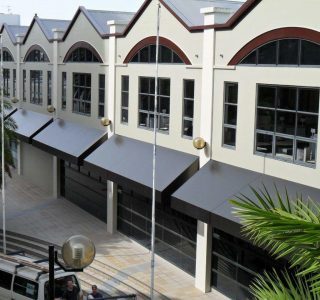 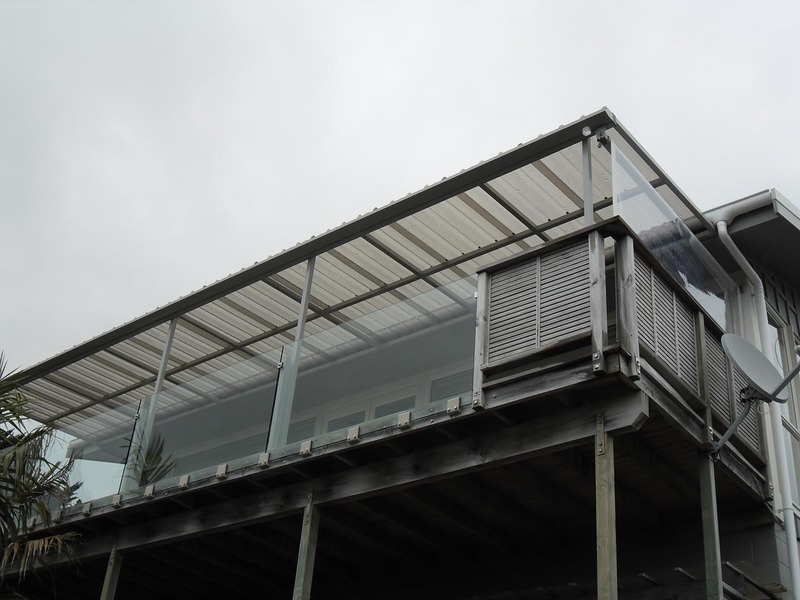 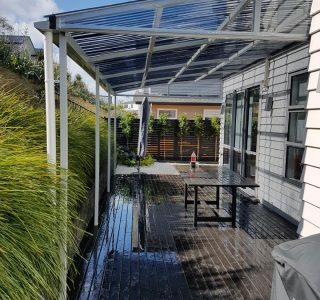 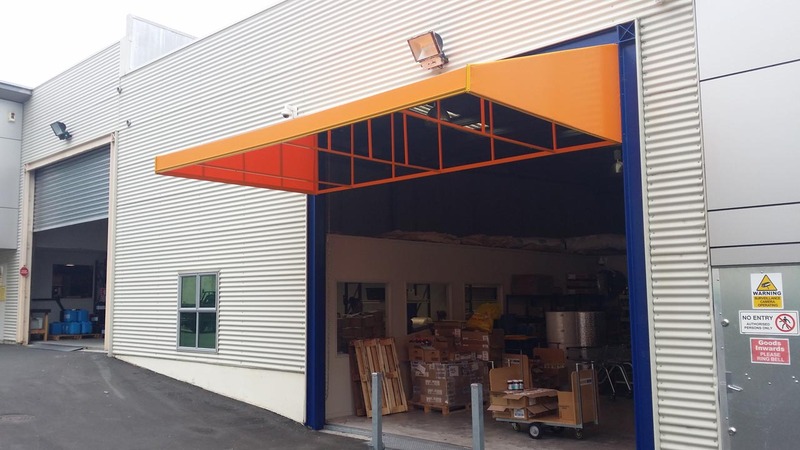 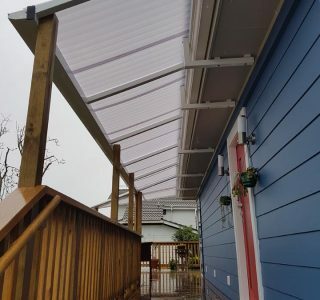 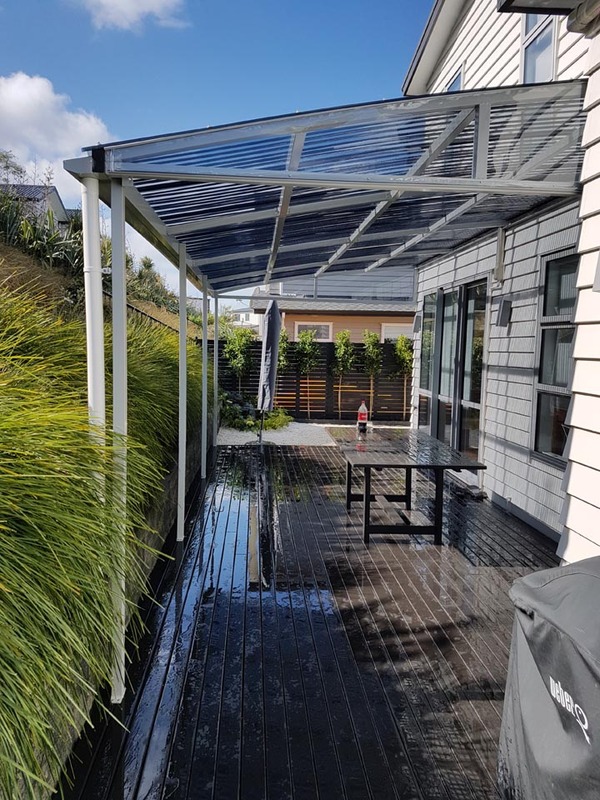 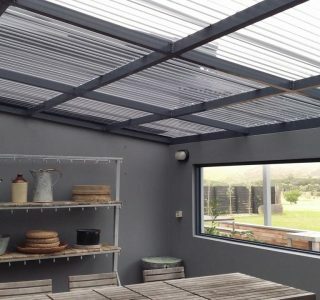 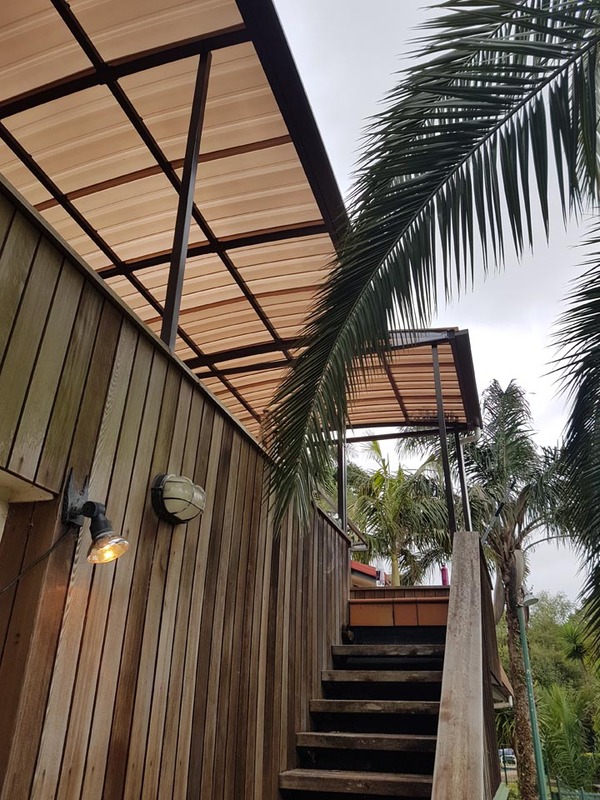 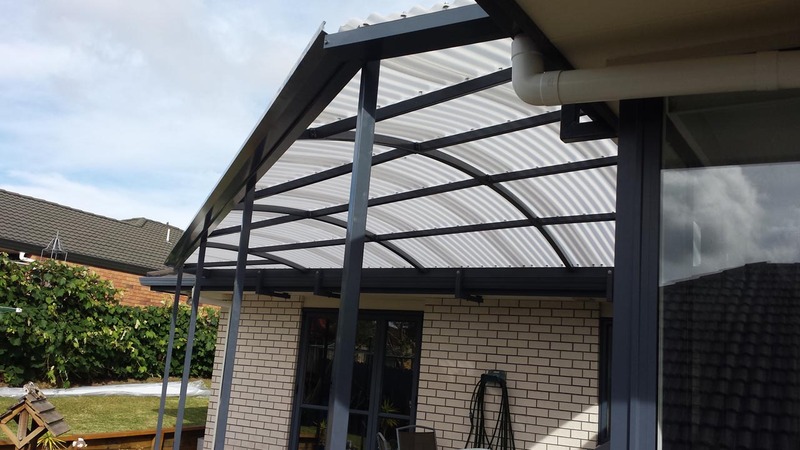 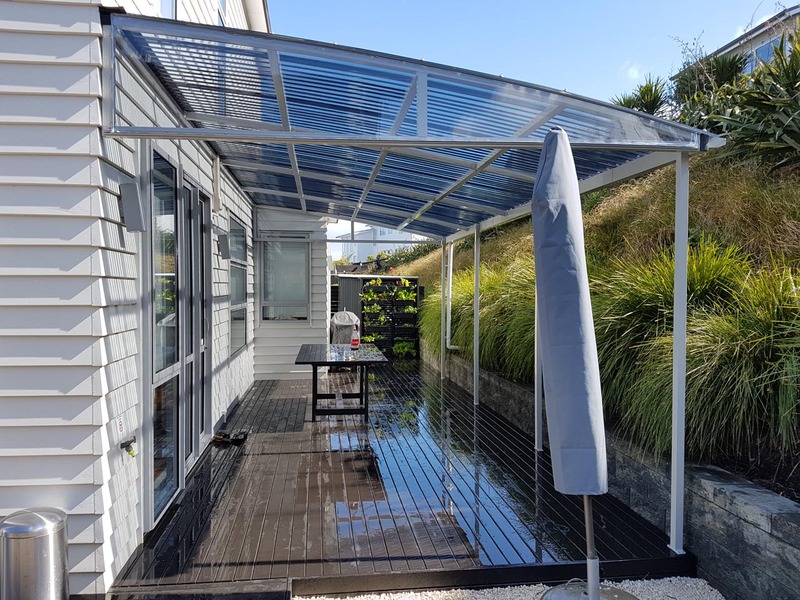 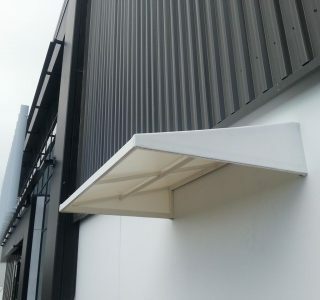 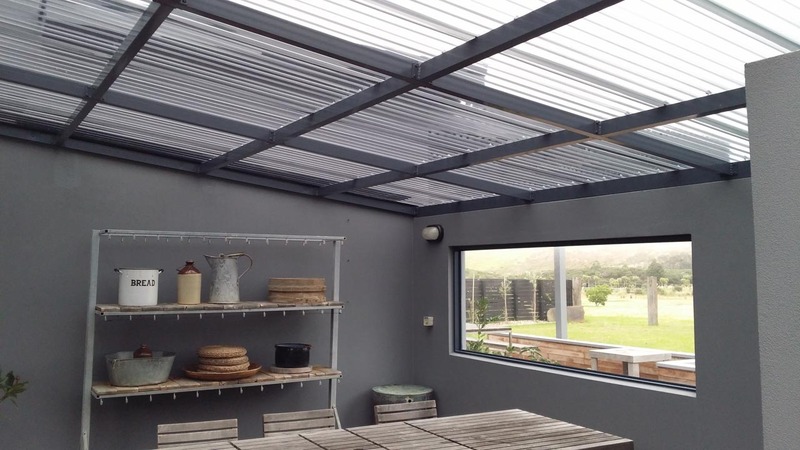 The PVC we use for our tensioned membrane structures is a hard wearing heavy duty structural PVC which is coated with an industrial substance allowing it to self-clean. 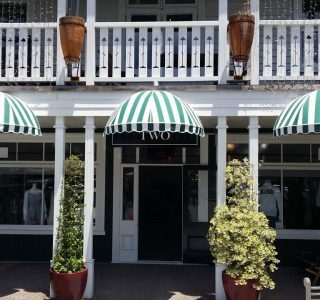 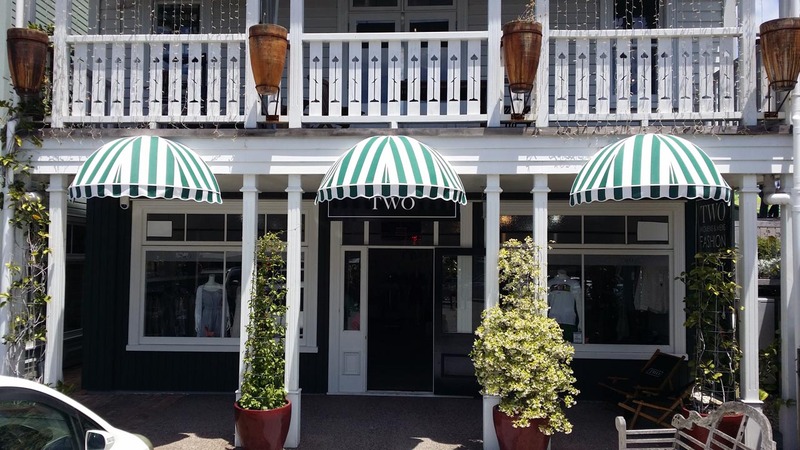 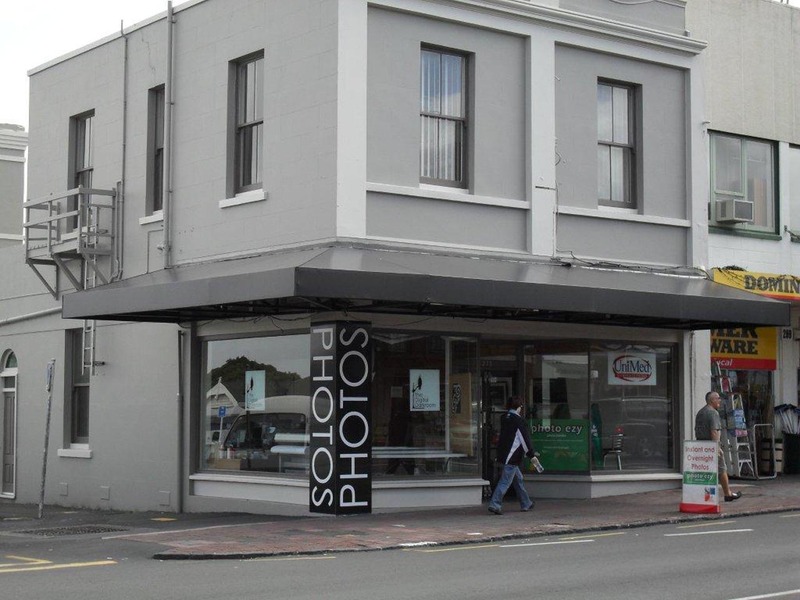 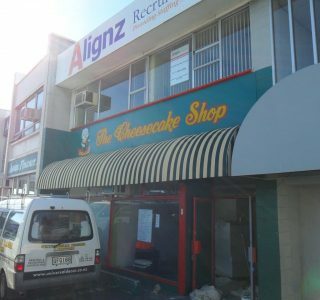 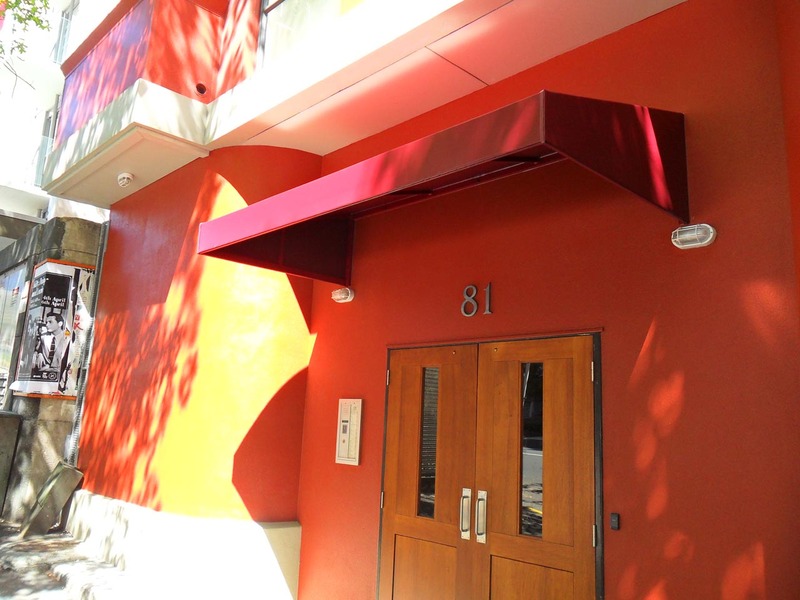 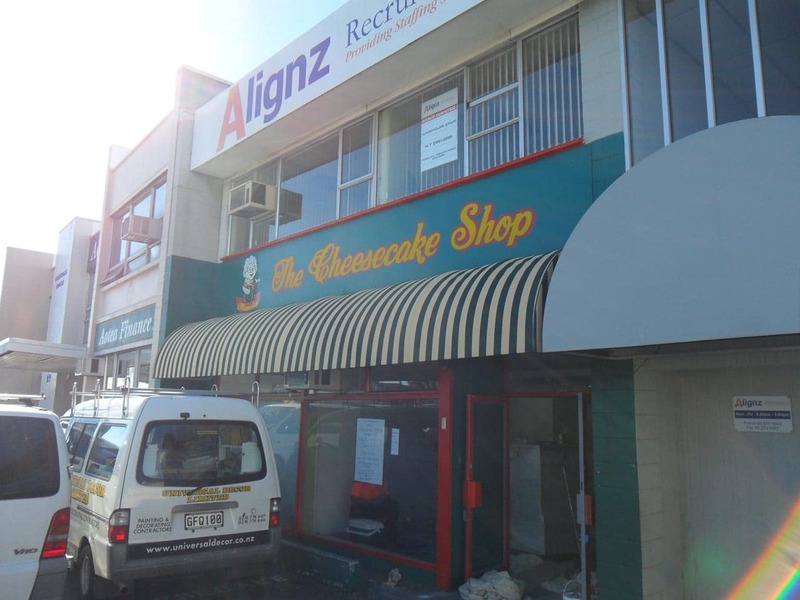 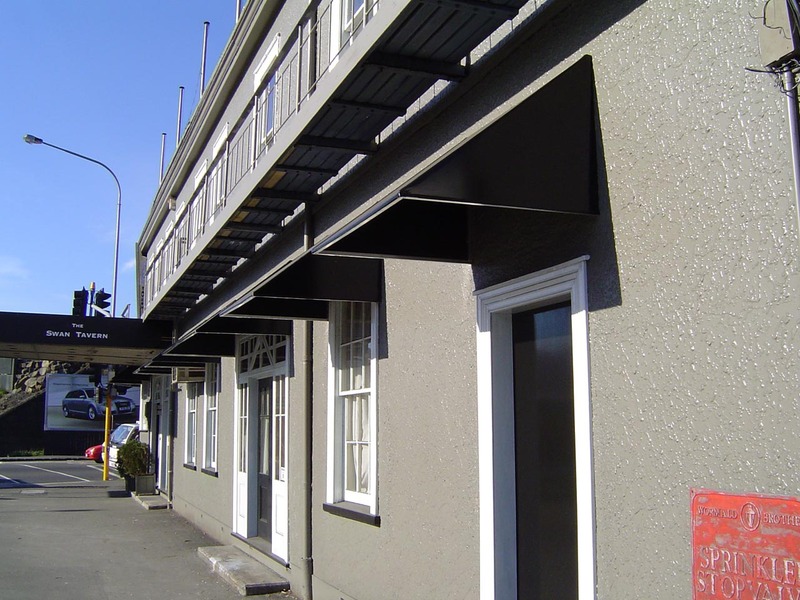 TMS are great for residential and commercial properties. 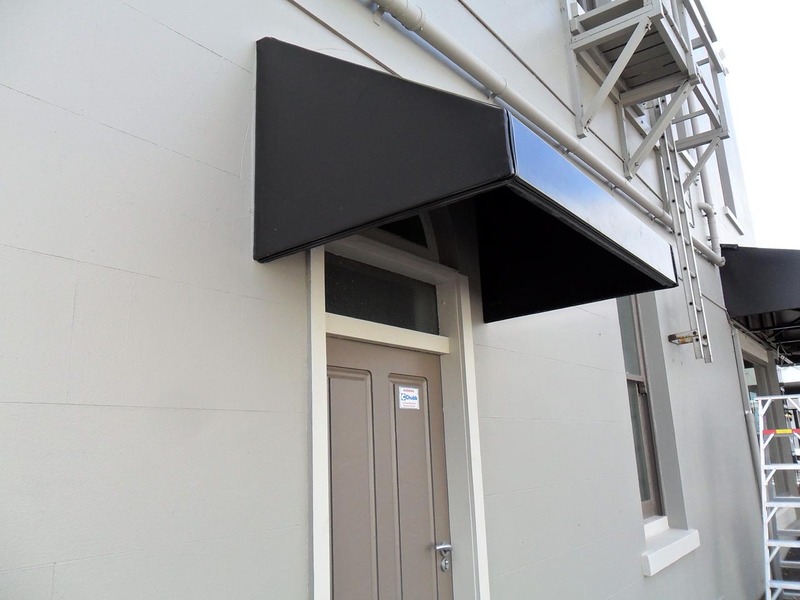 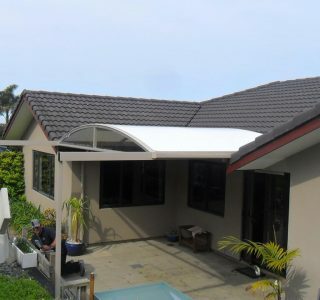 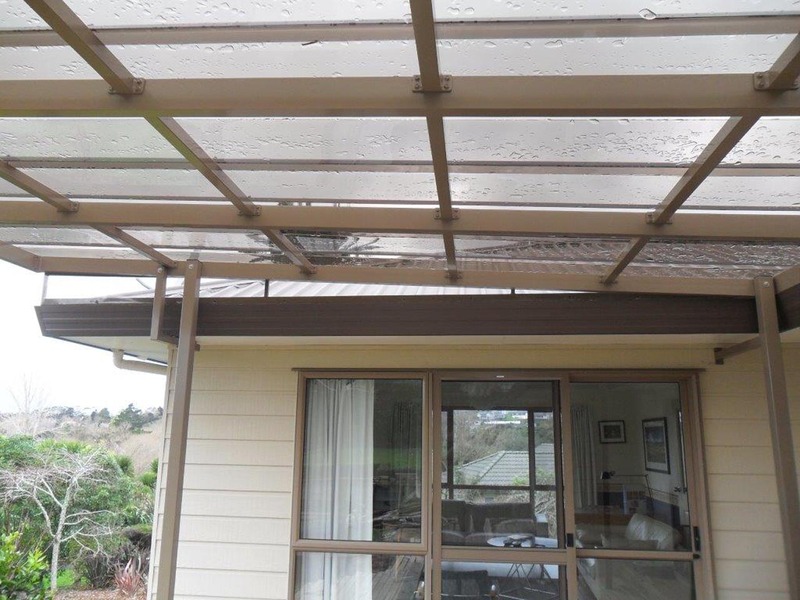 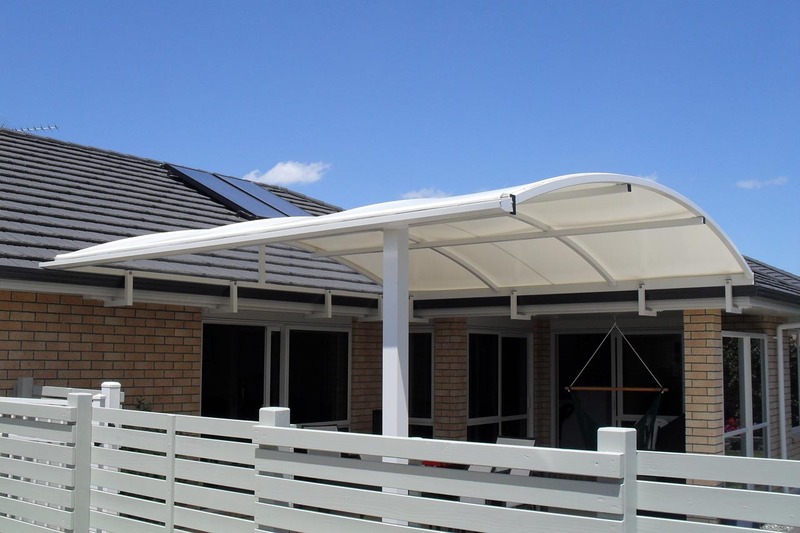 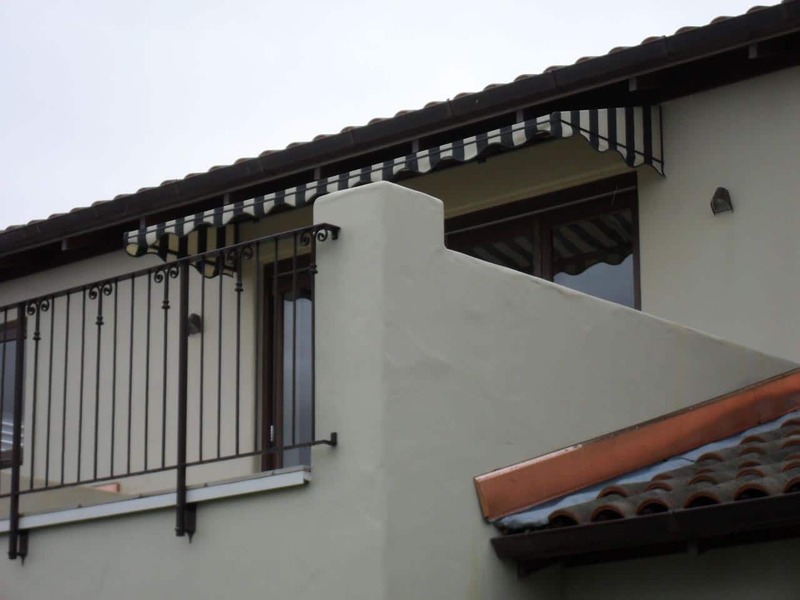 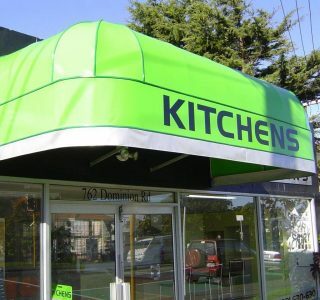 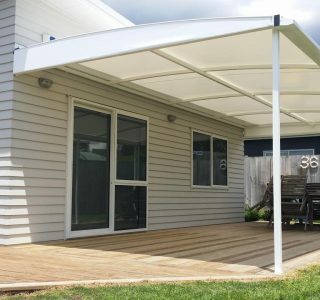 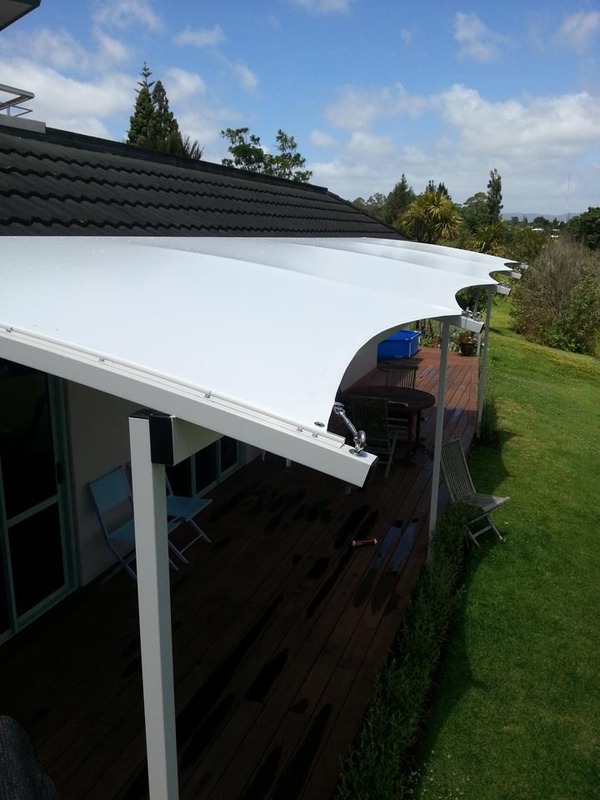 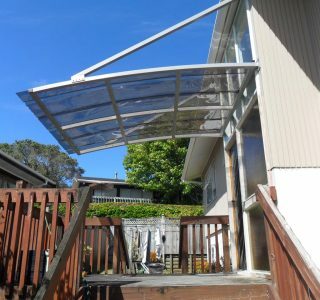 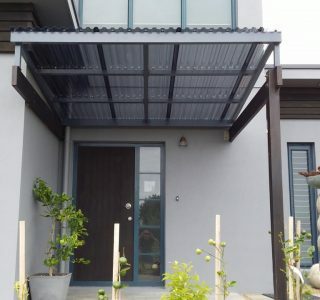 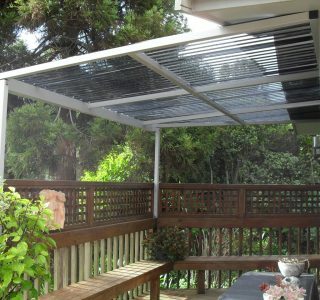 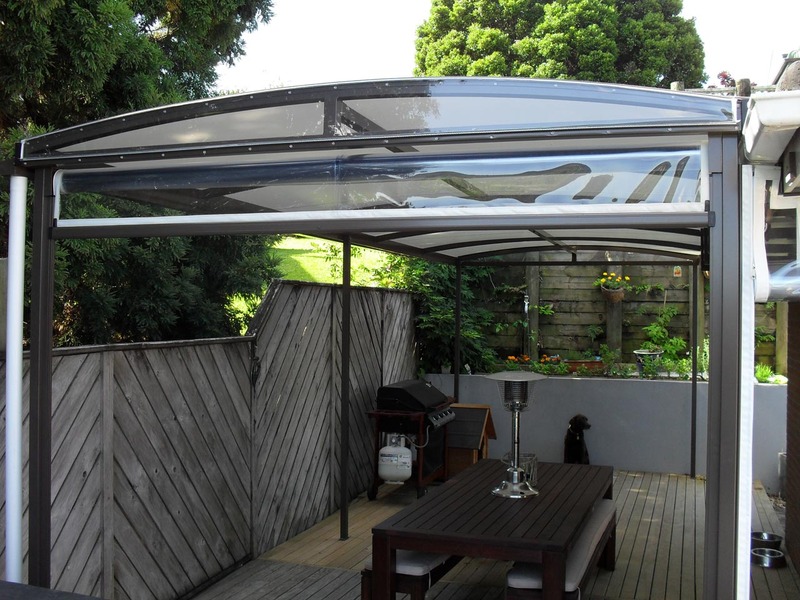 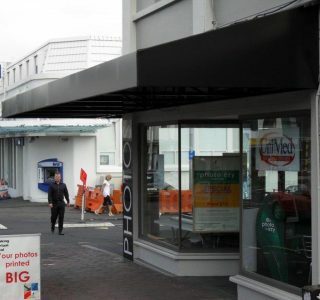 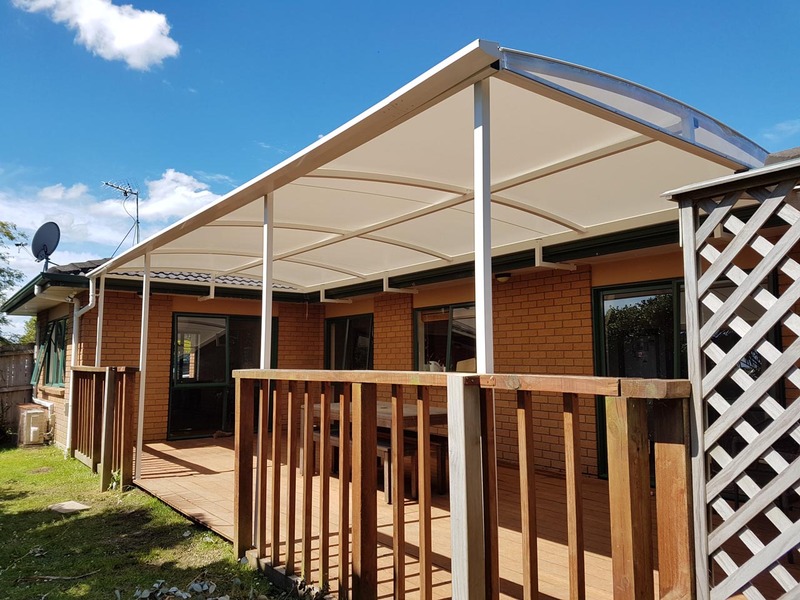 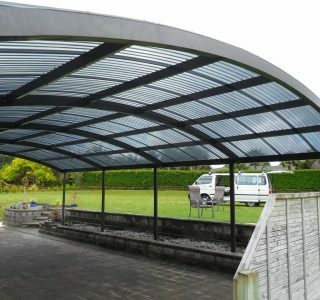 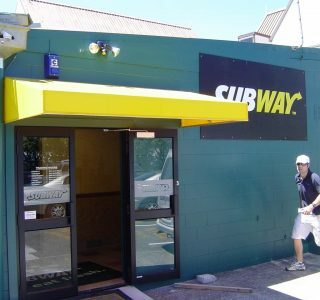 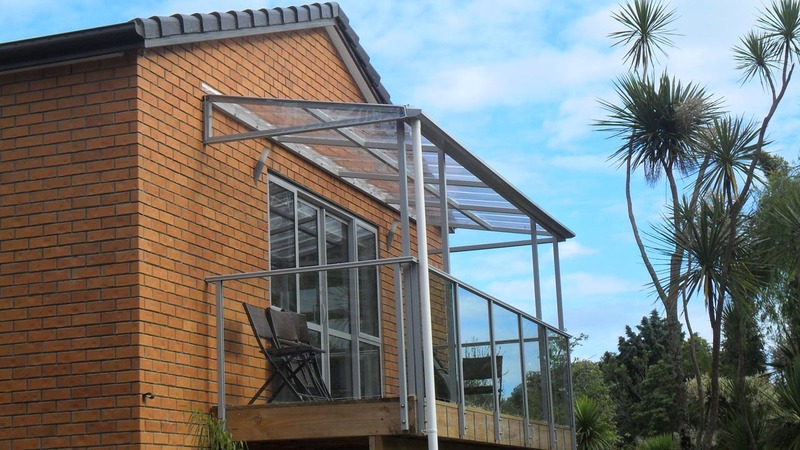 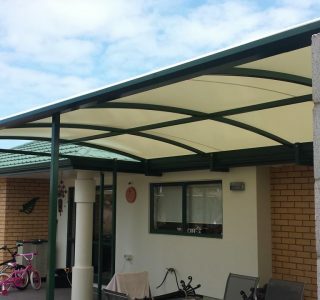 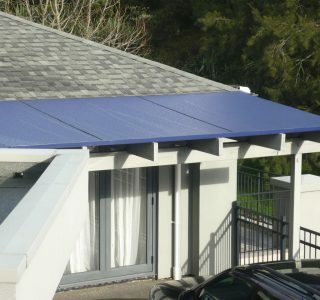 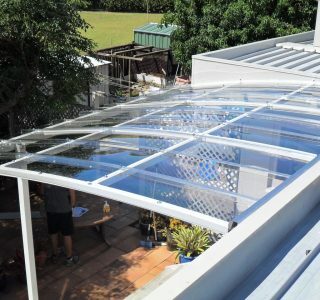 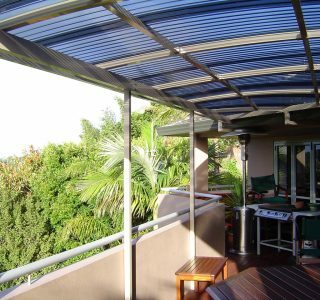 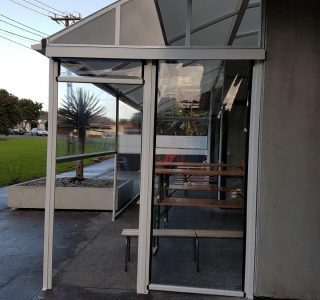 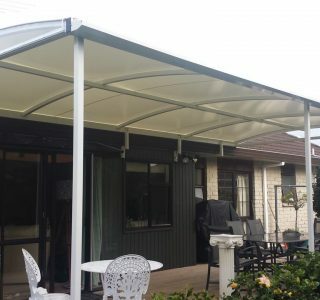 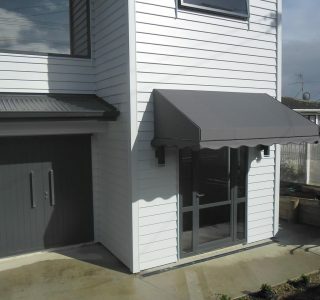 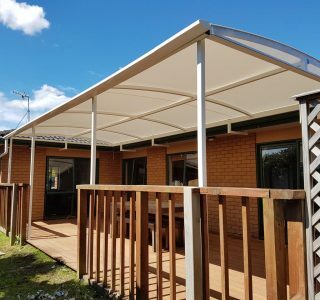 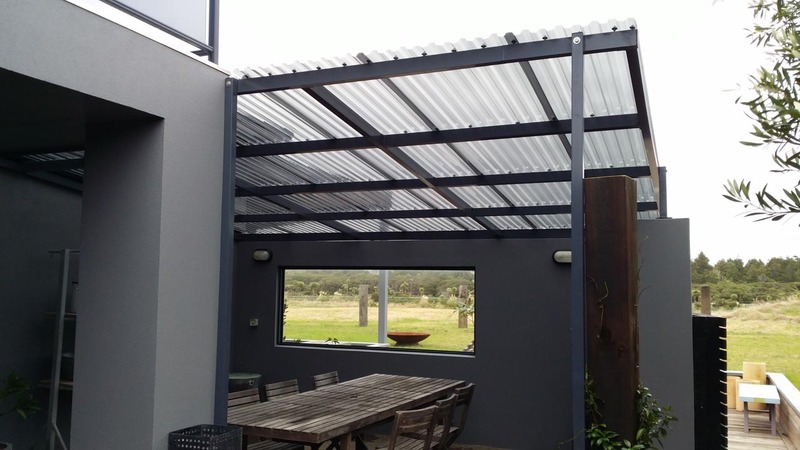 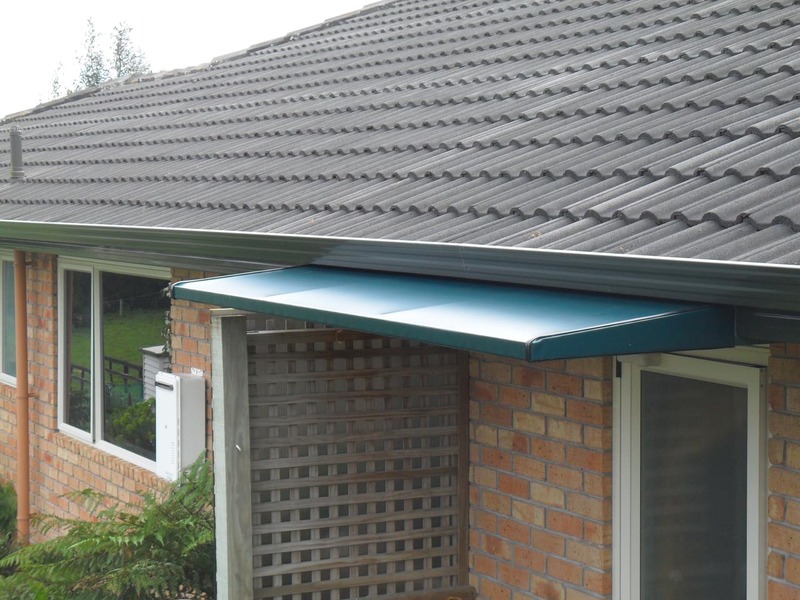 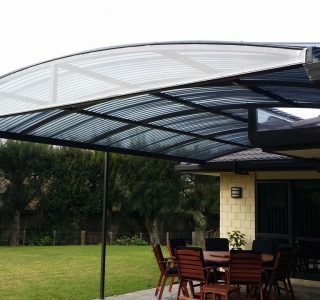 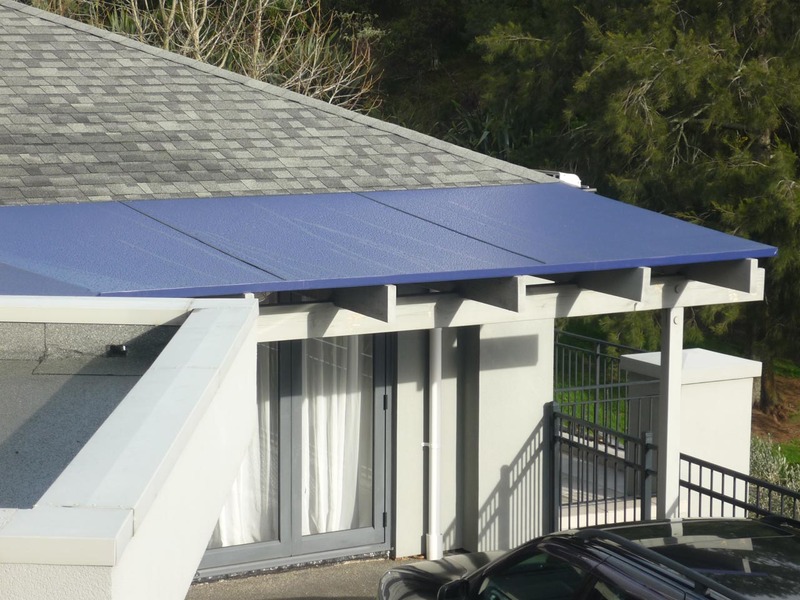 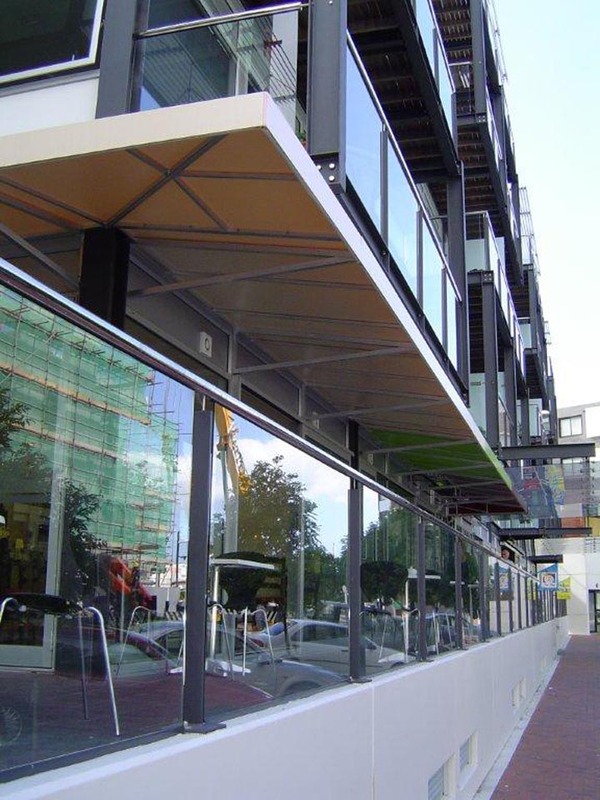 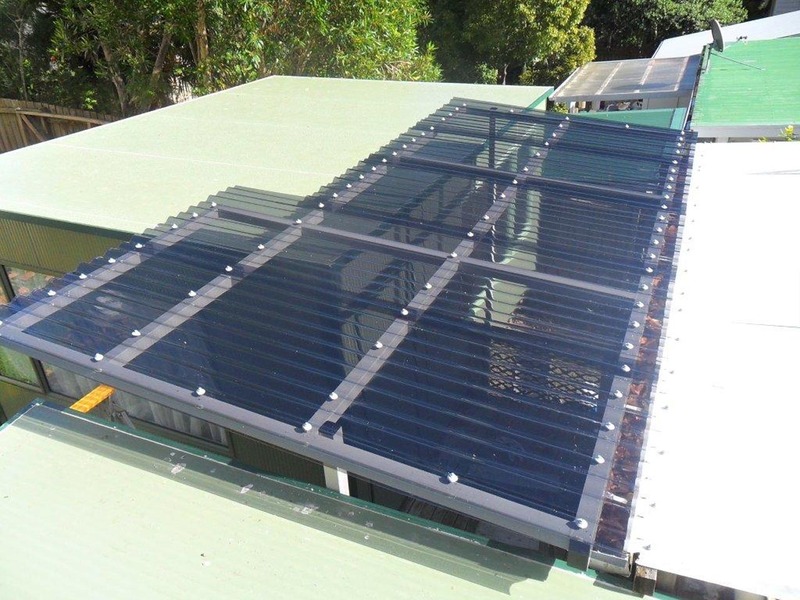 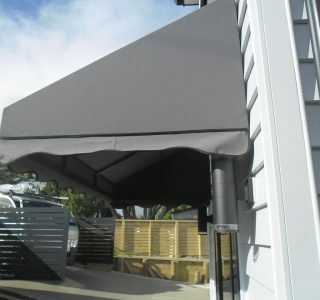 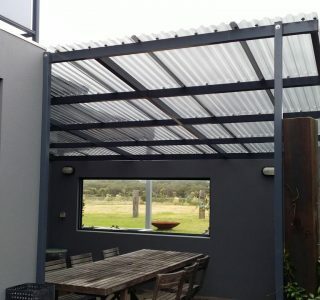 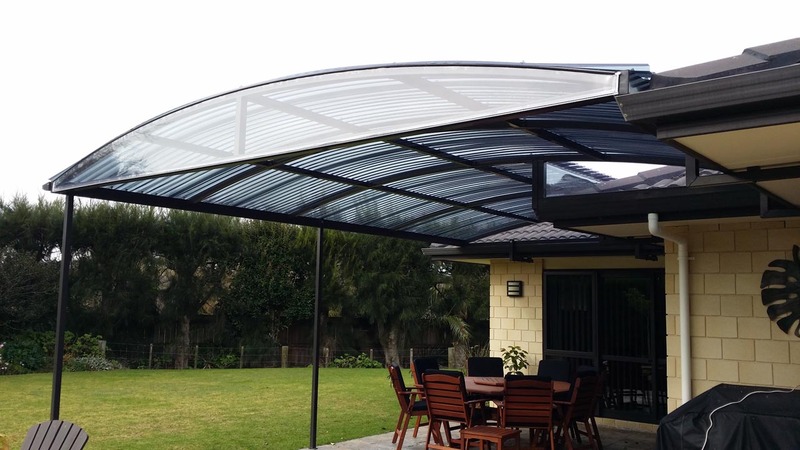 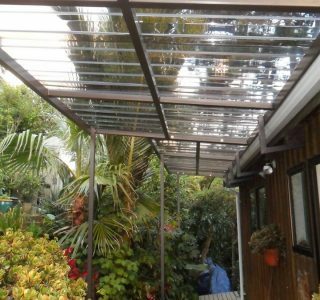 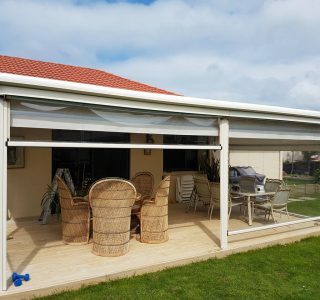 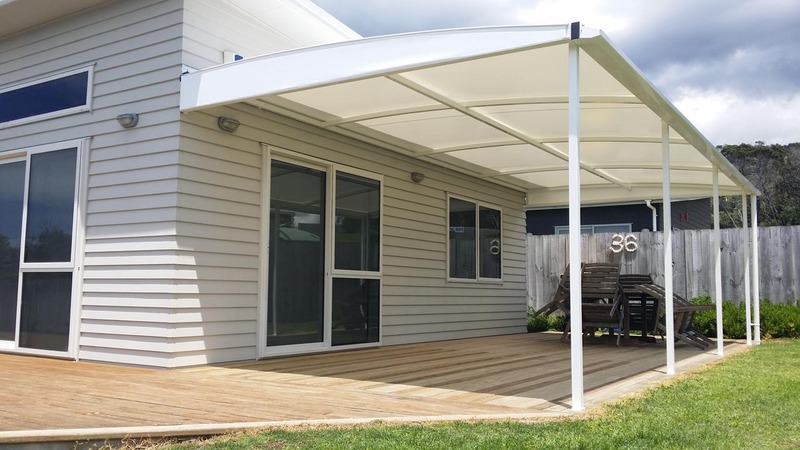 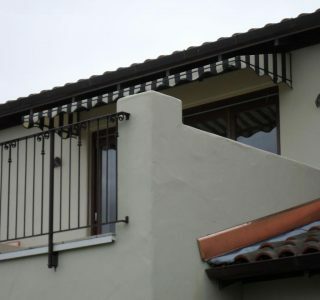 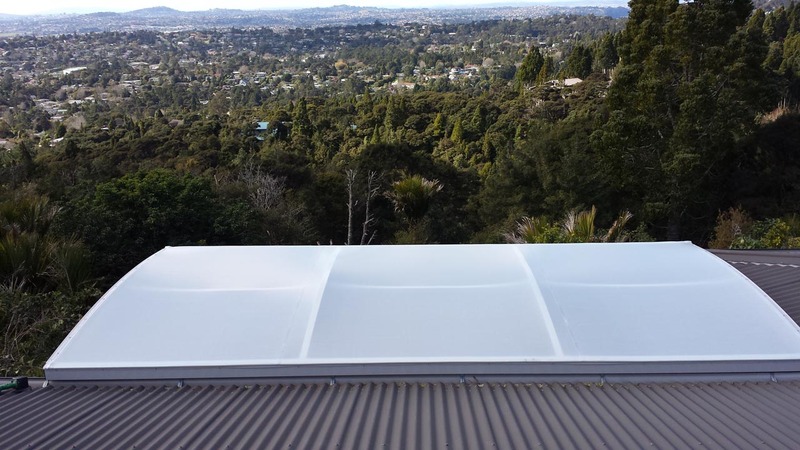 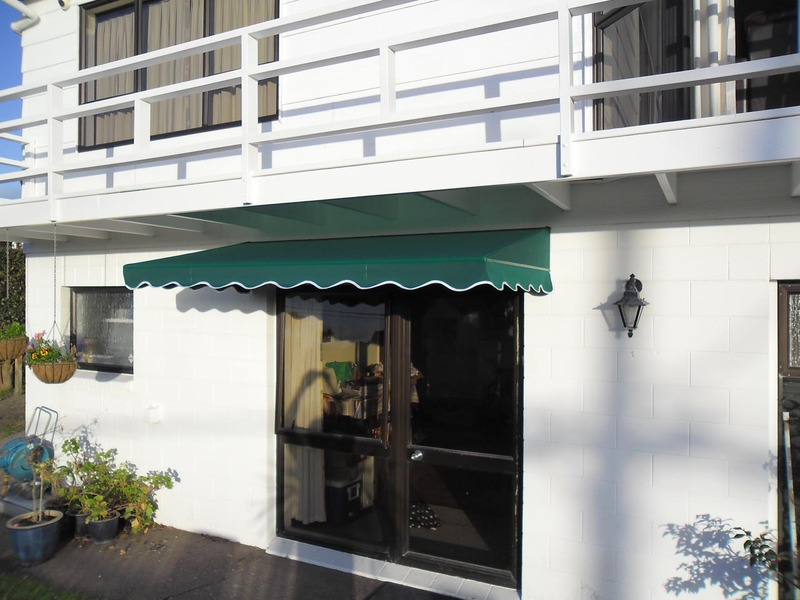 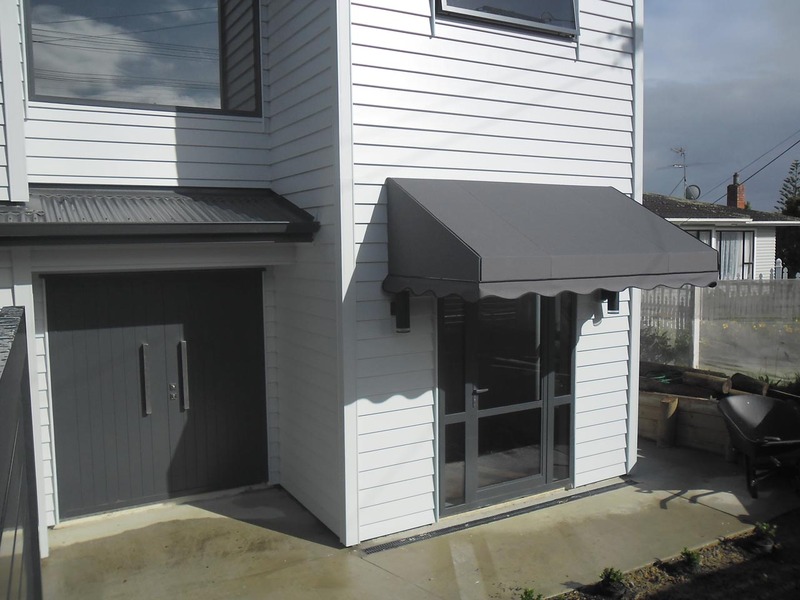 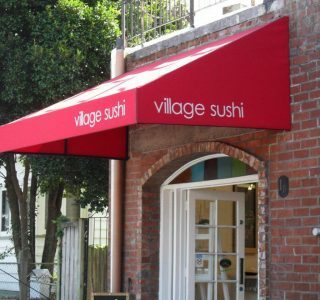 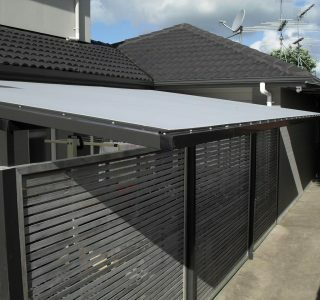 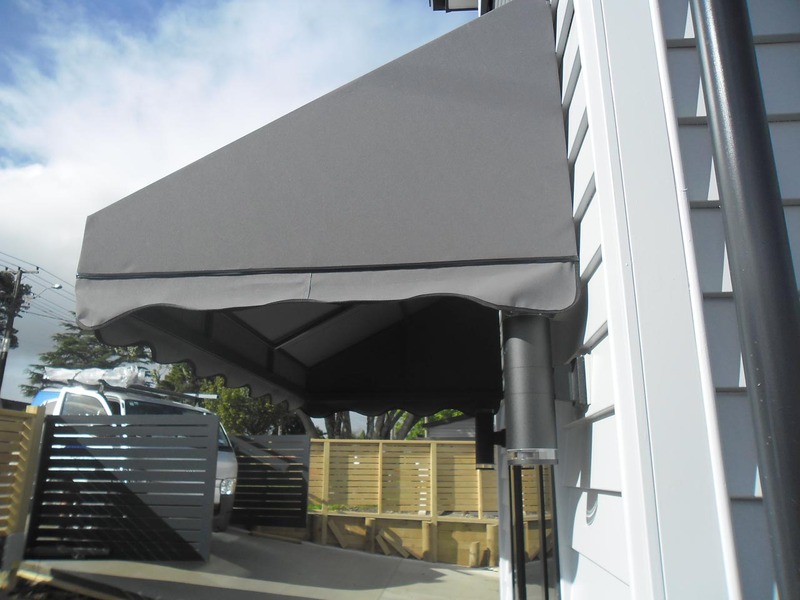 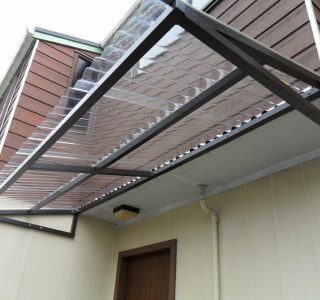 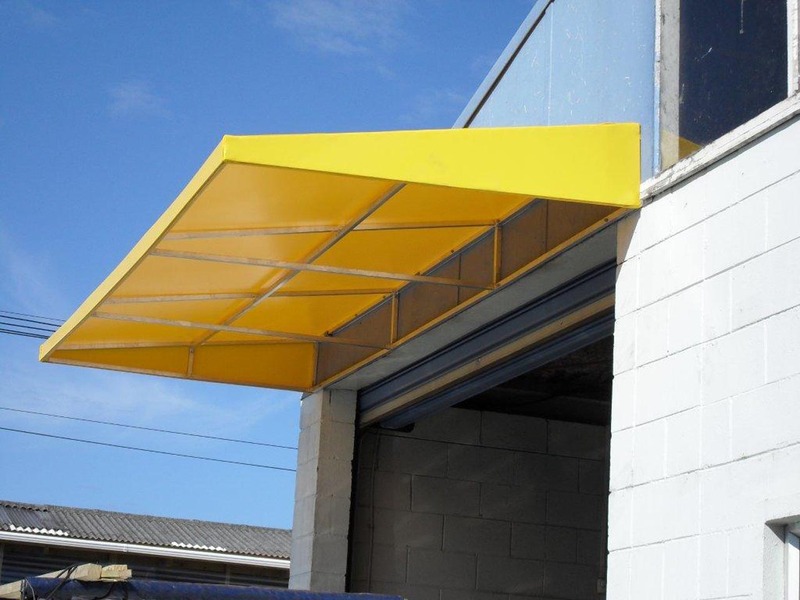 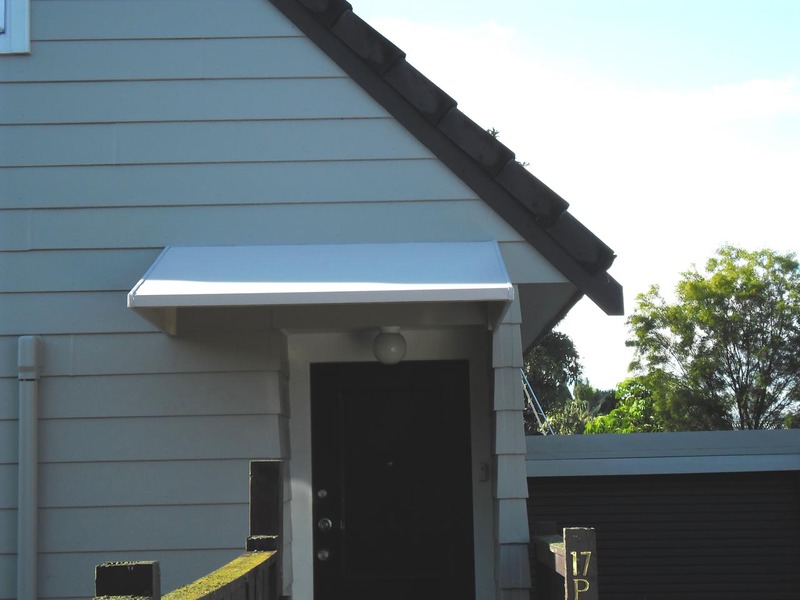 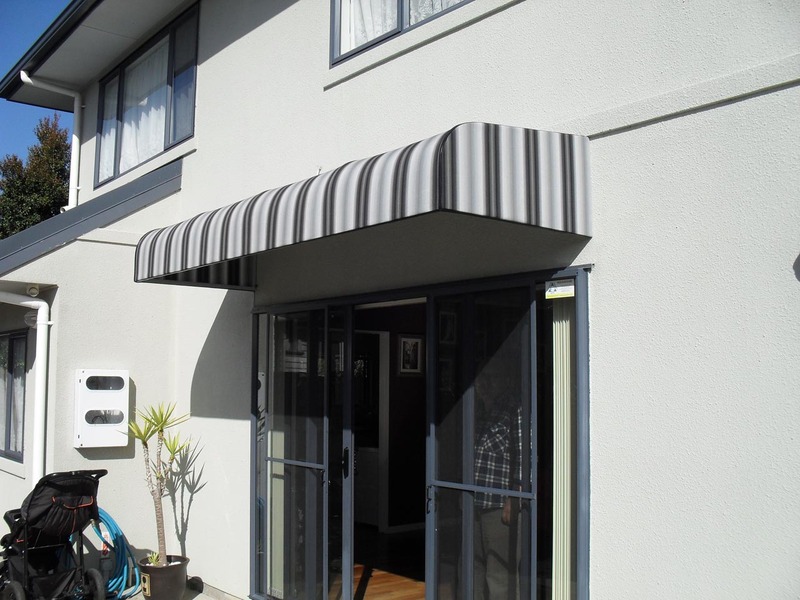 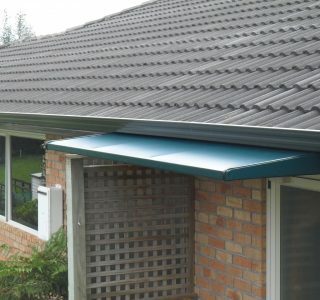 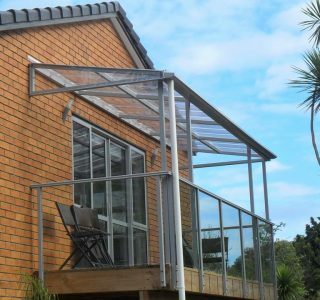 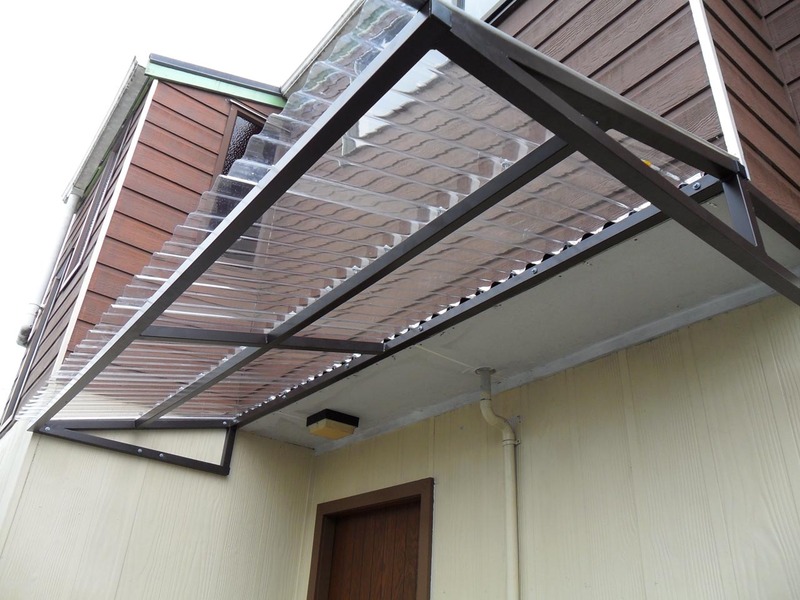 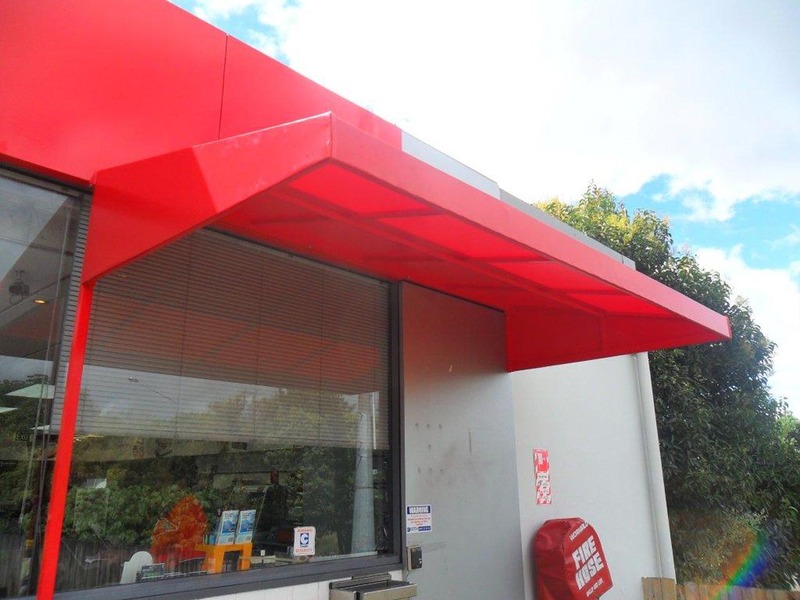 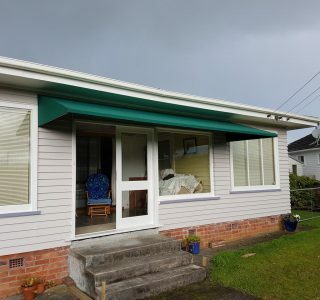 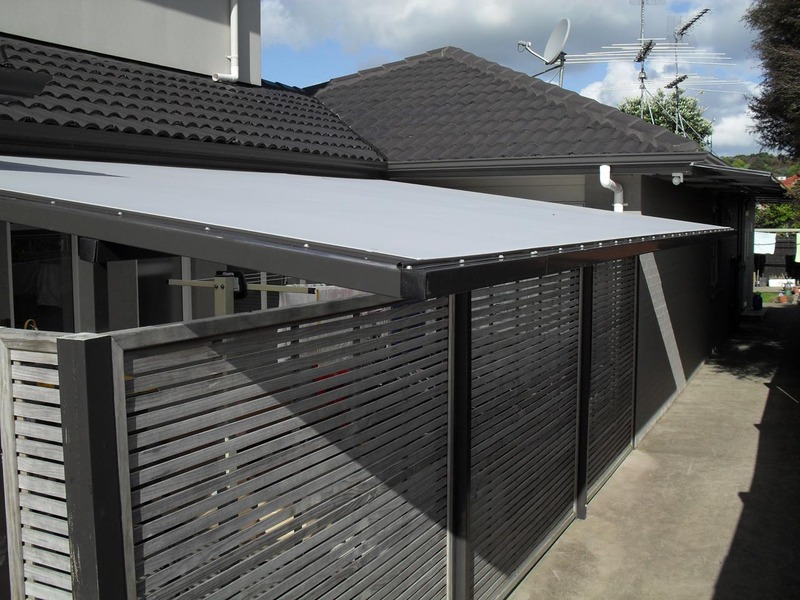 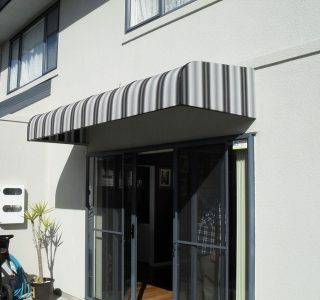 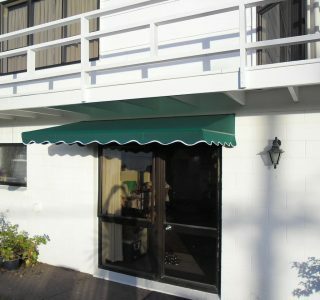 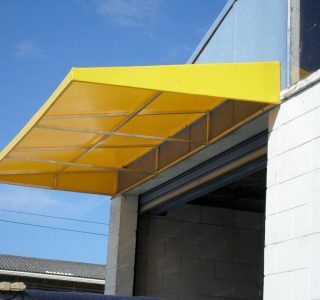 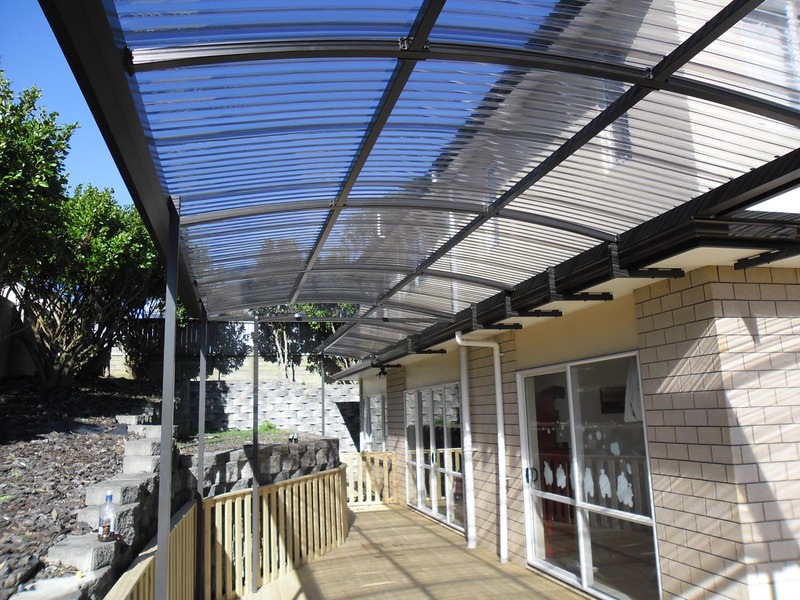 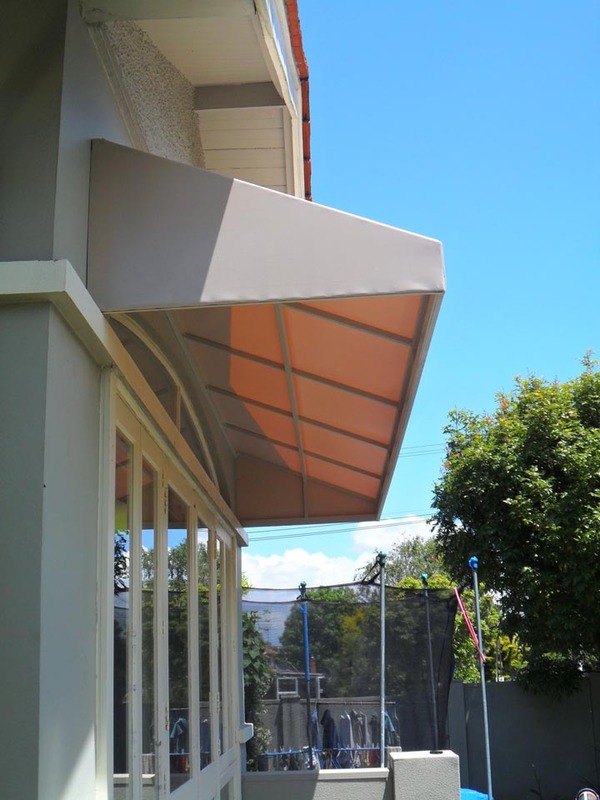 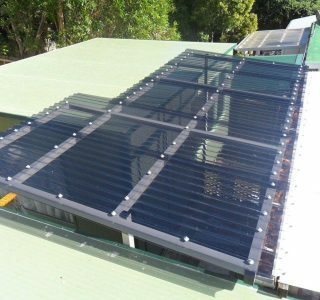 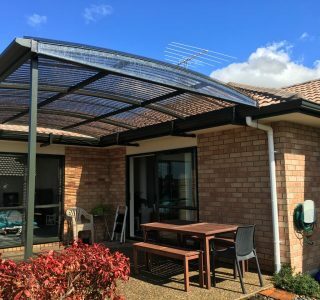 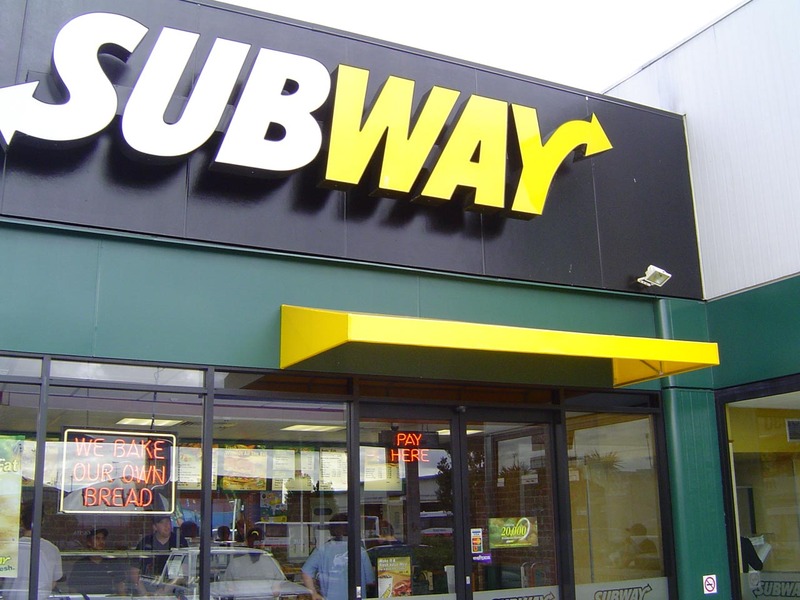 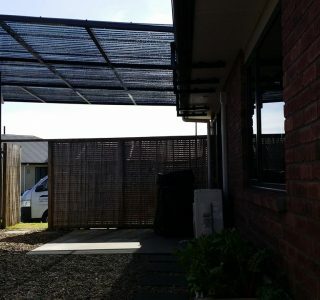 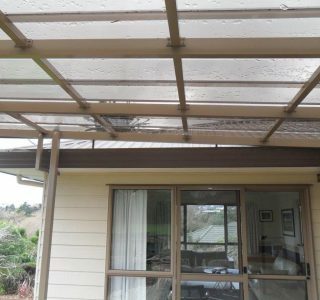 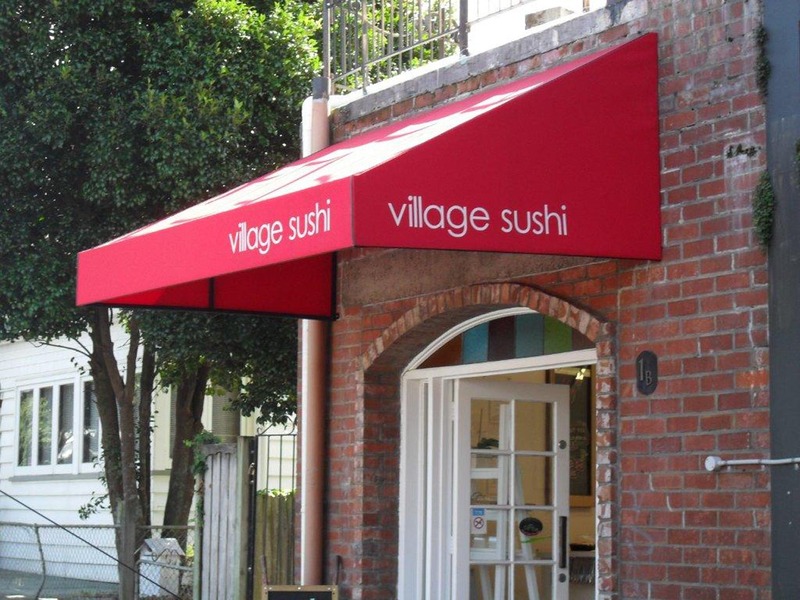 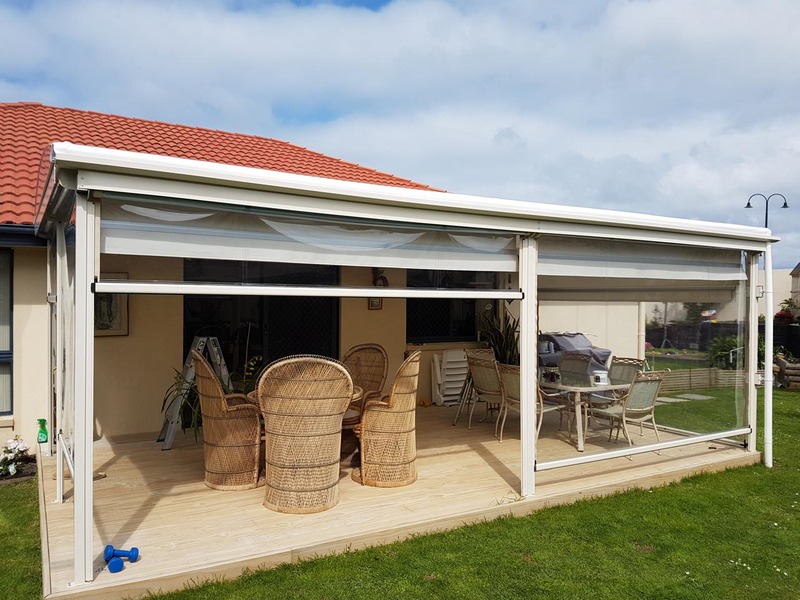 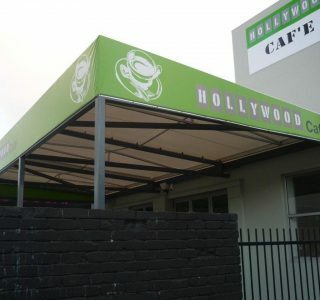 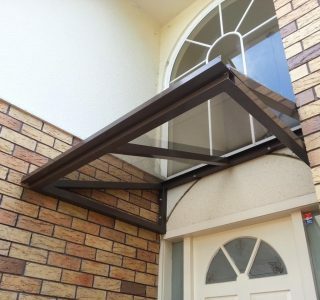 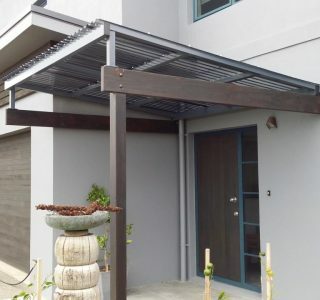 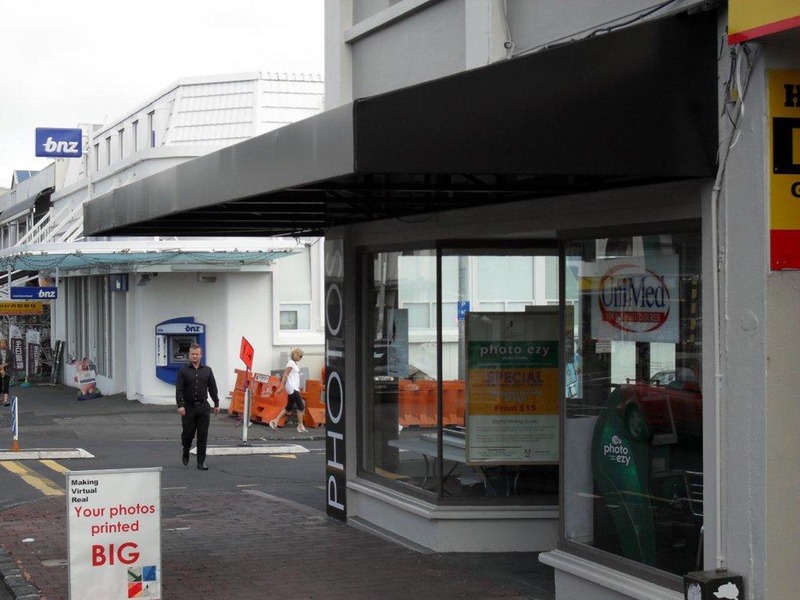 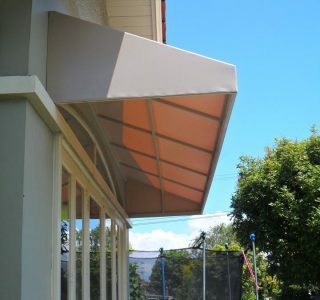 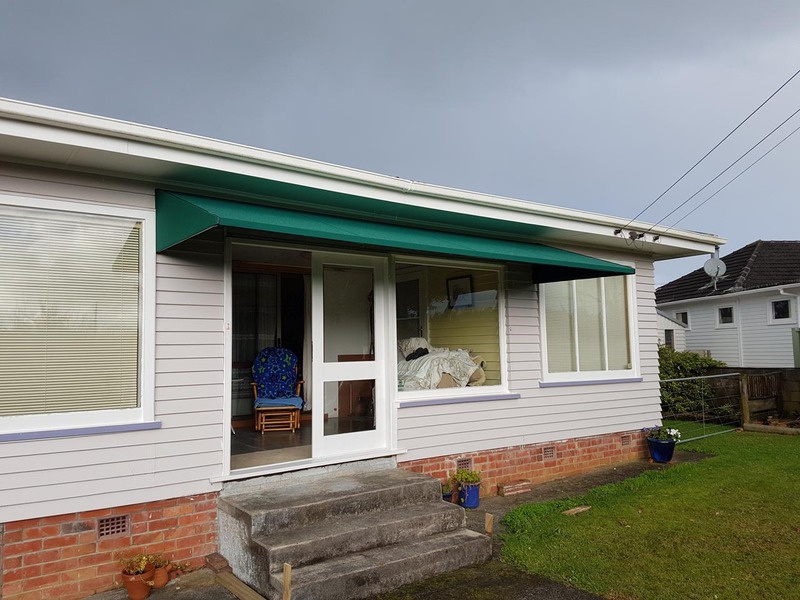 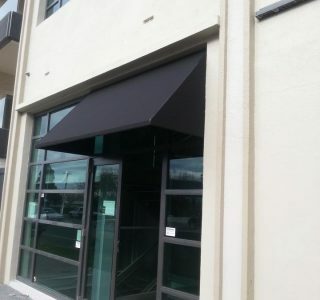 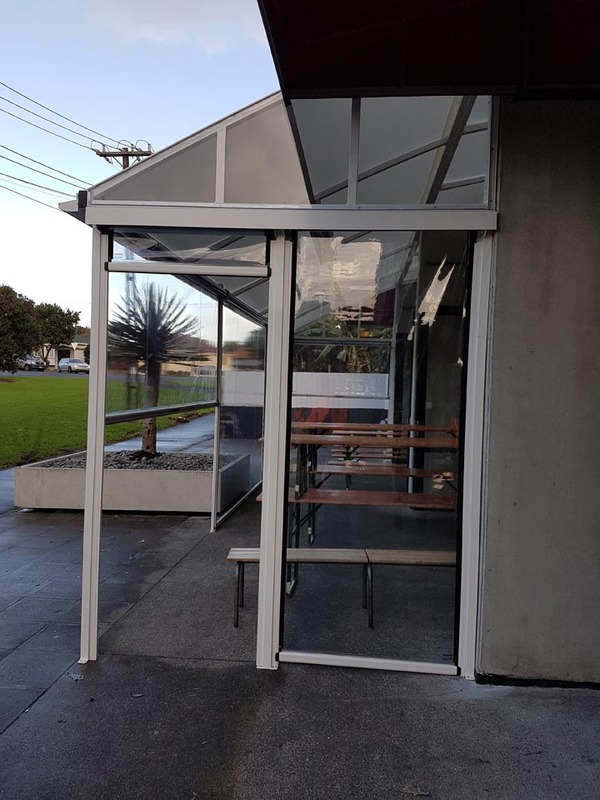 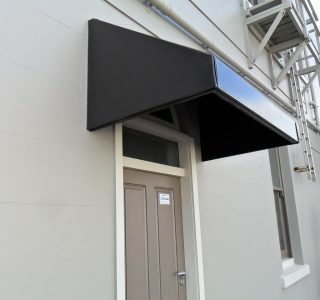 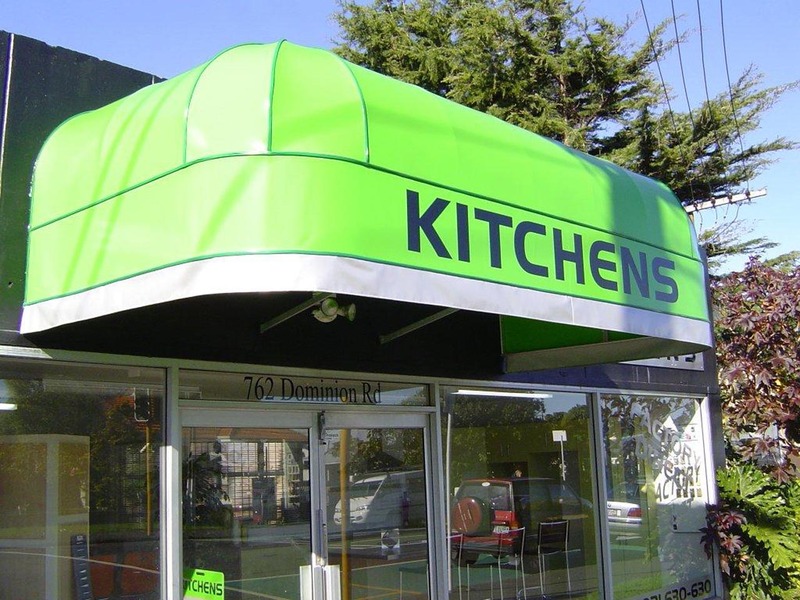 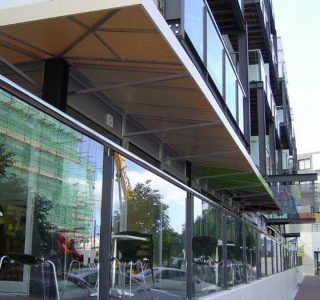 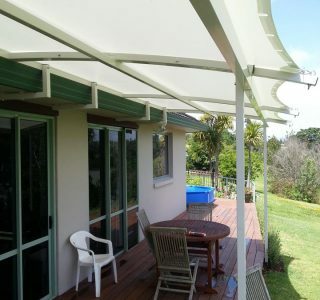 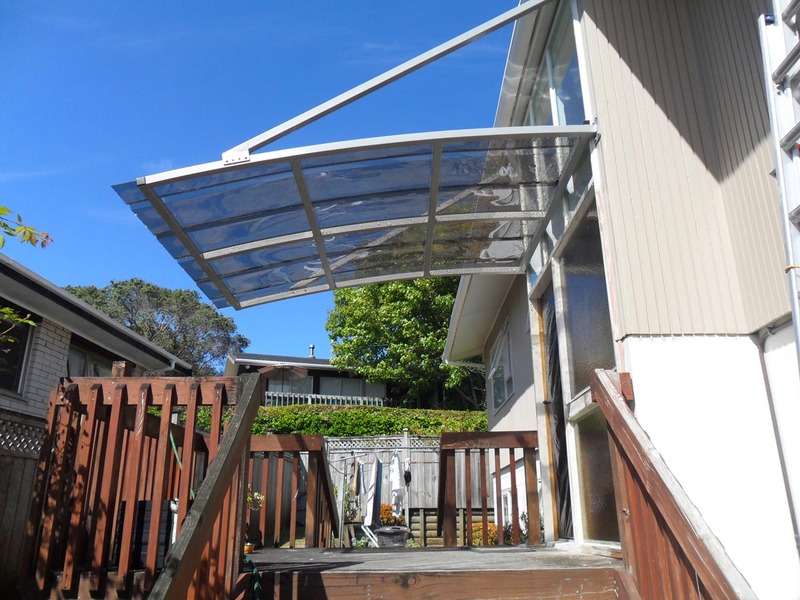 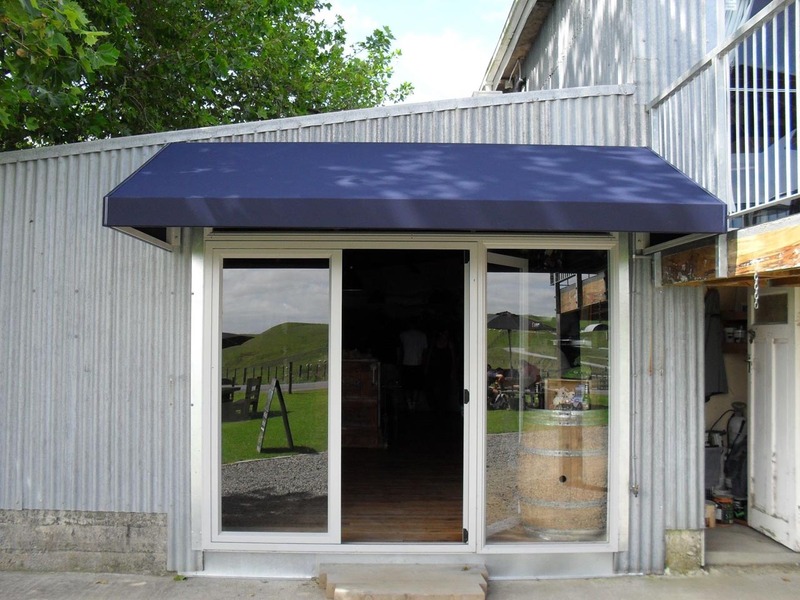 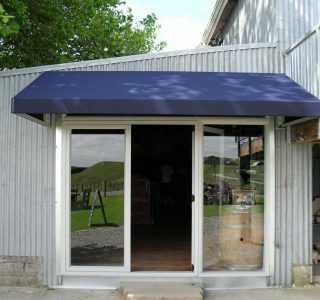 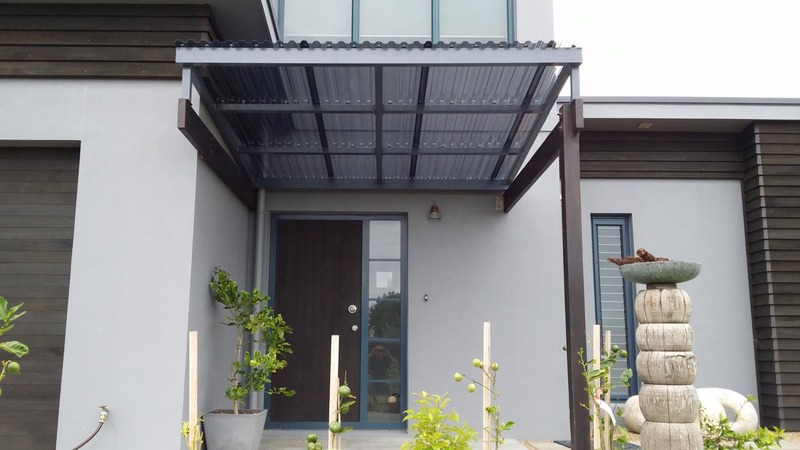 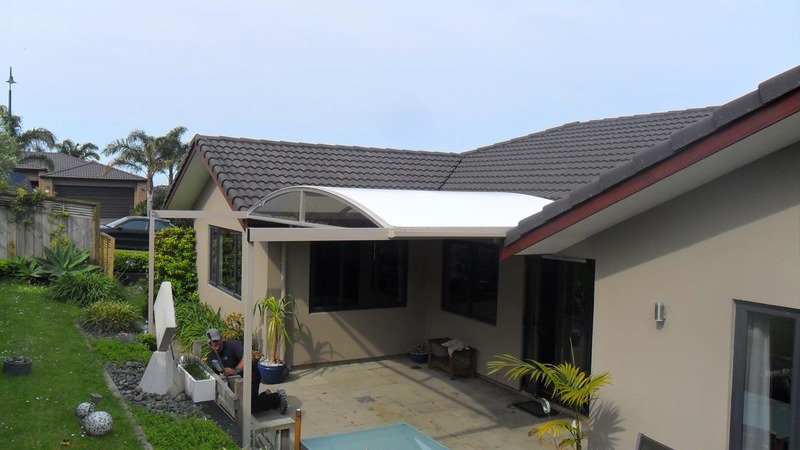 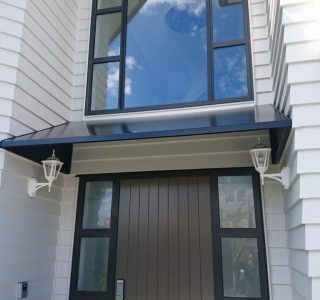 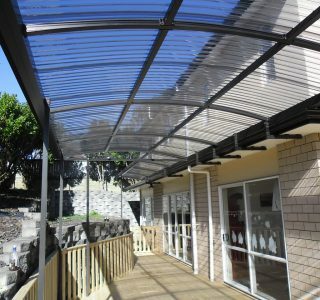 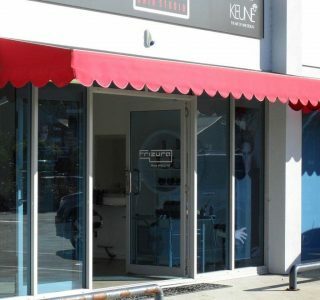 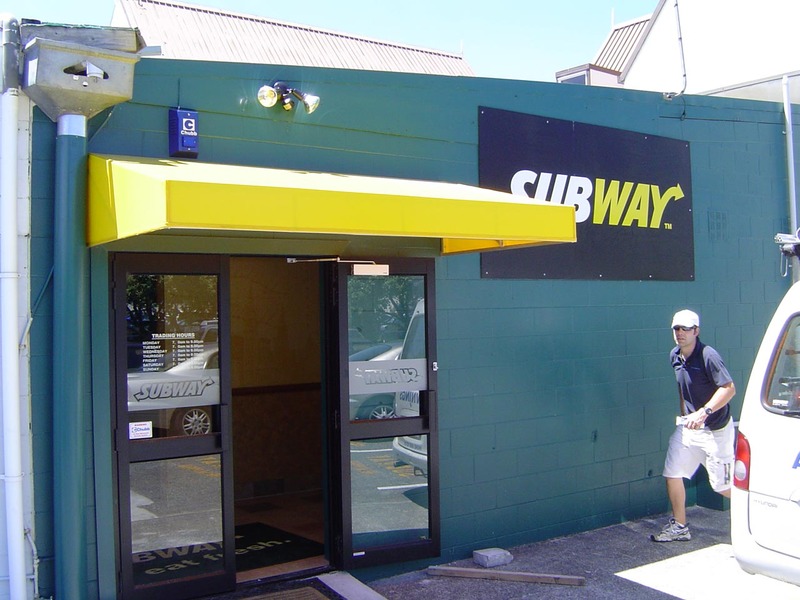 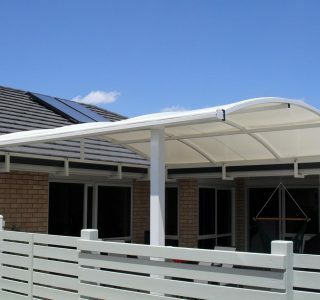 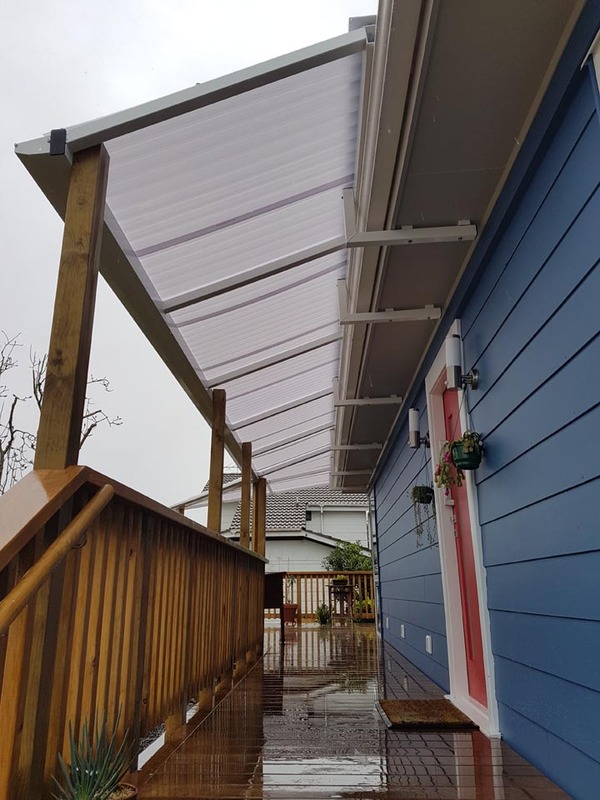 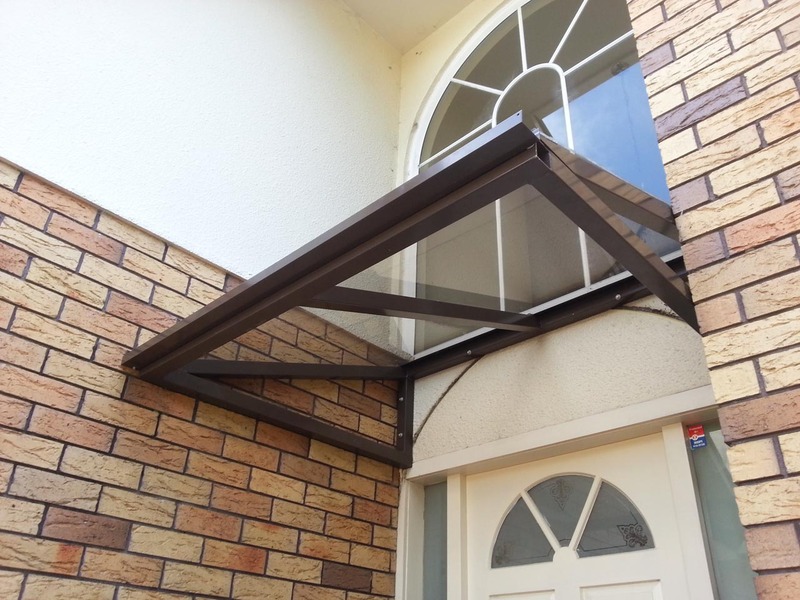 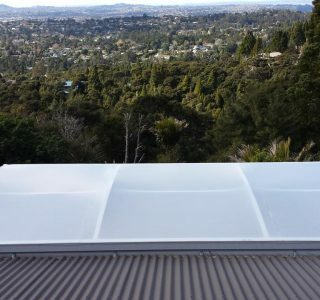 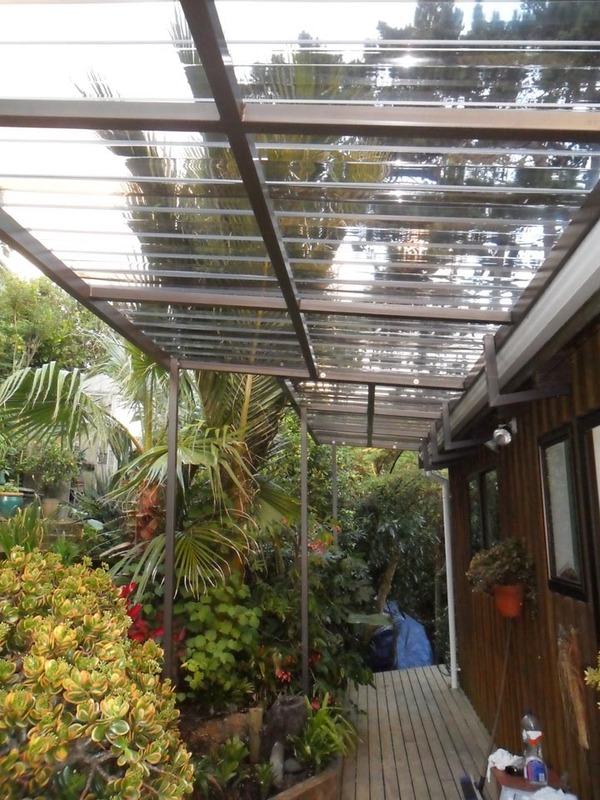 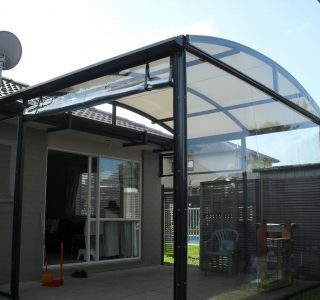 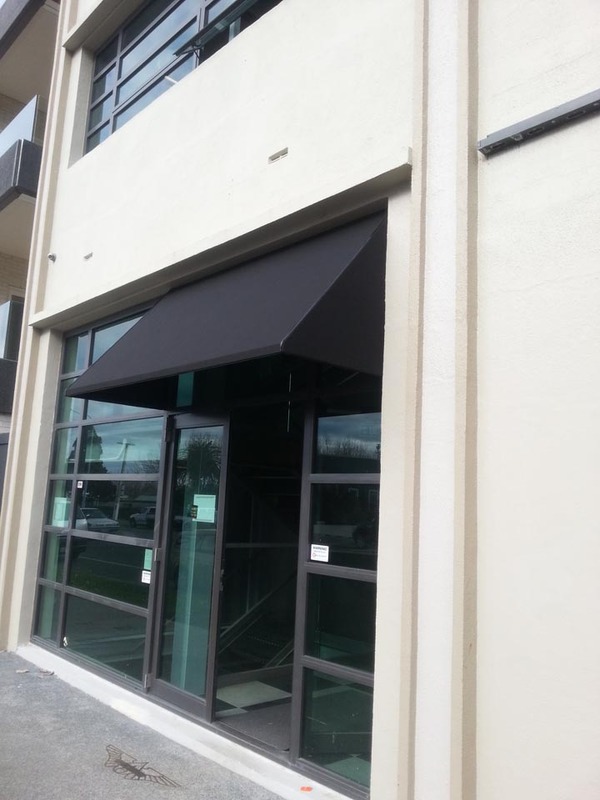 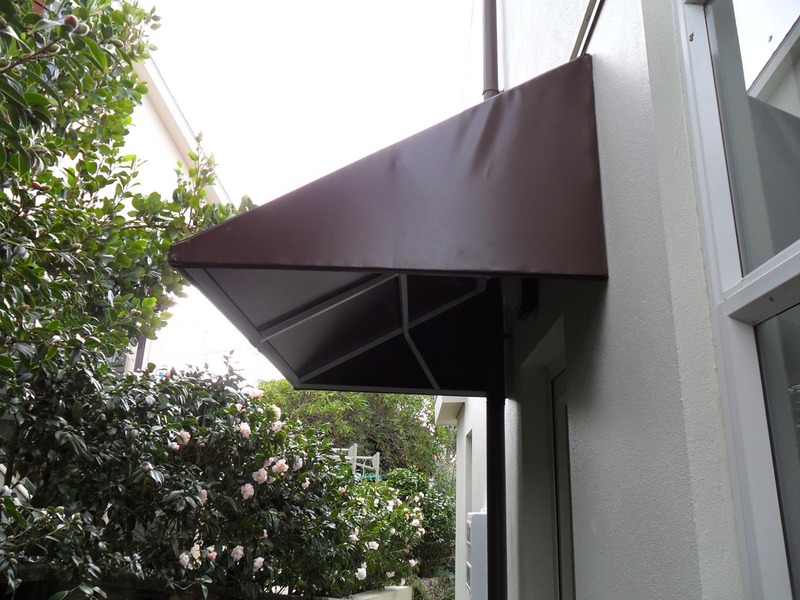 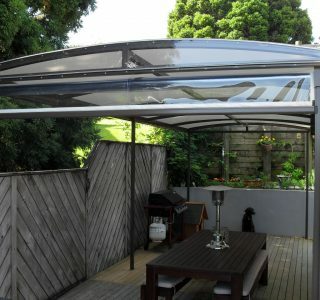 They are low maintenance, allow more coverage and can withstand winds up to 100km. 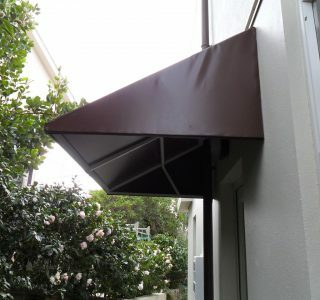 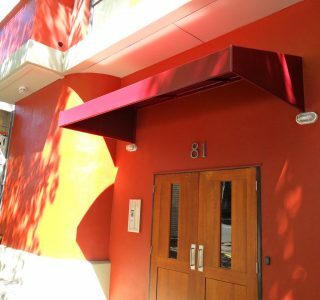 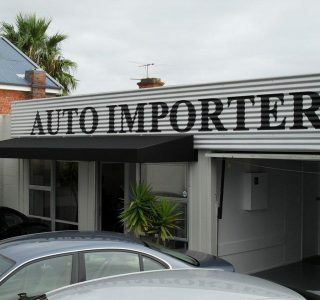 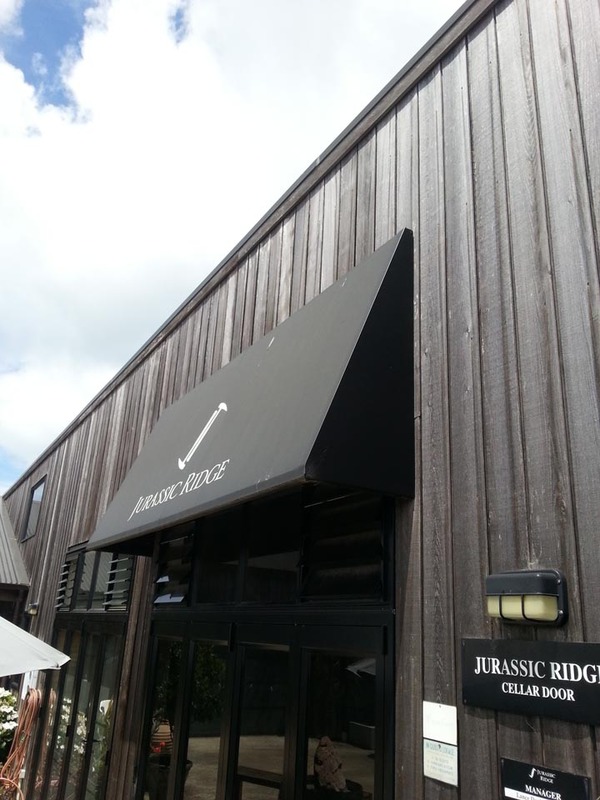 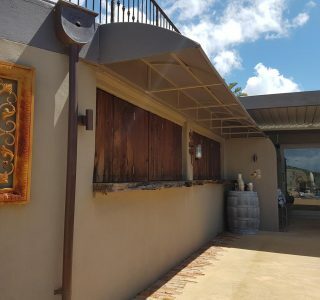 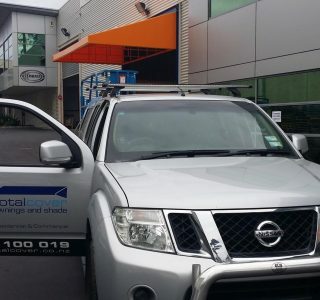 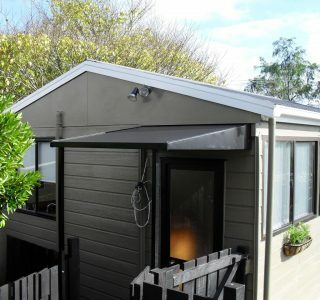 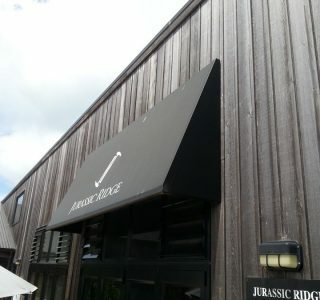 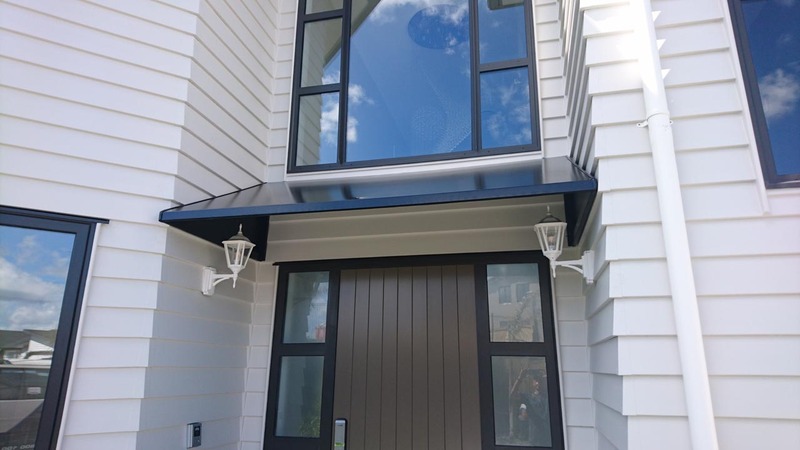 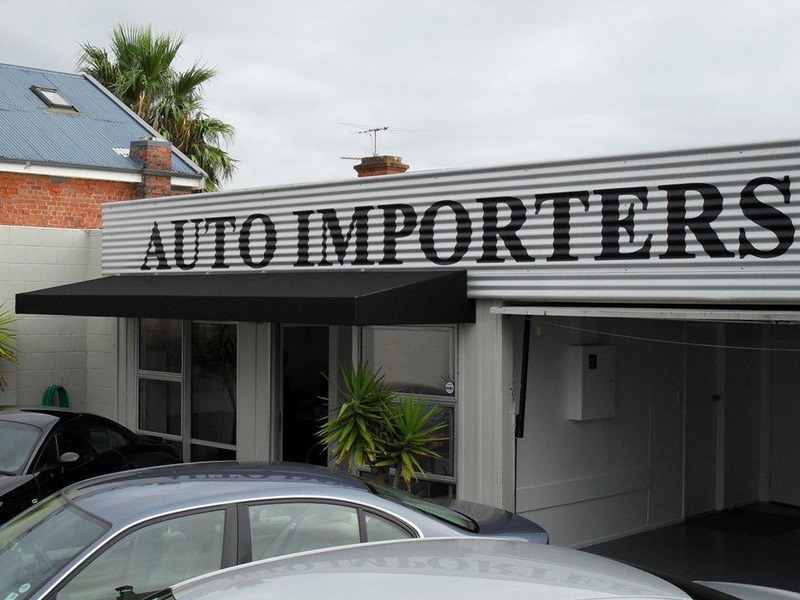 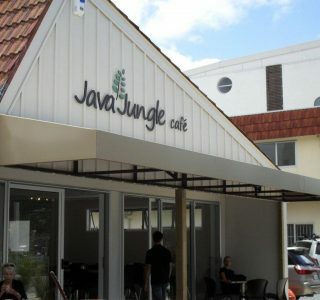 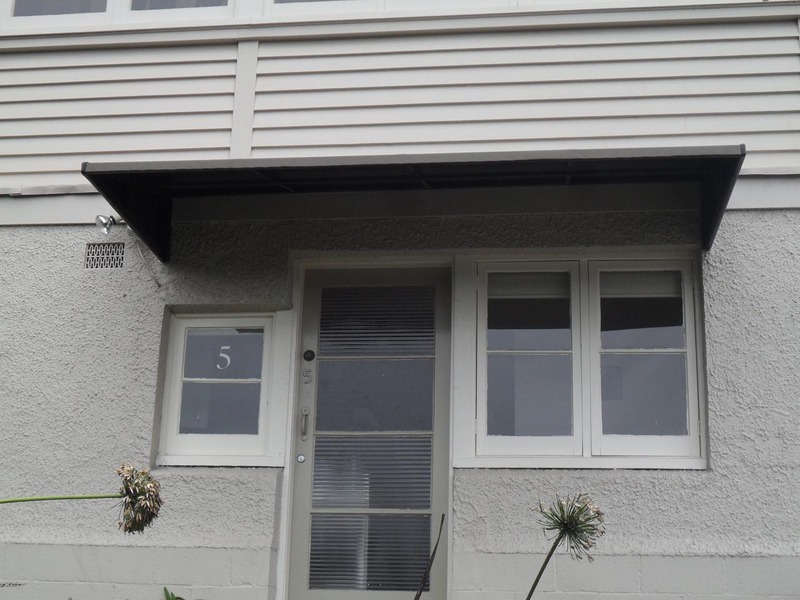 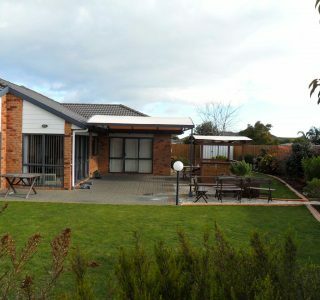 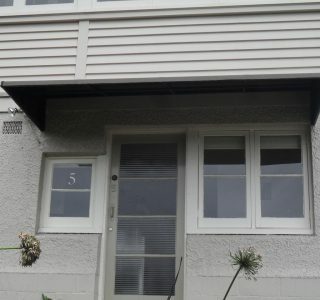 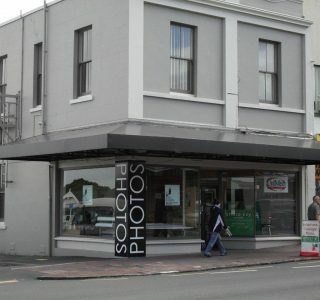 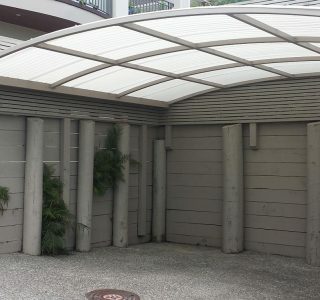 They are a permanent feature to your property. 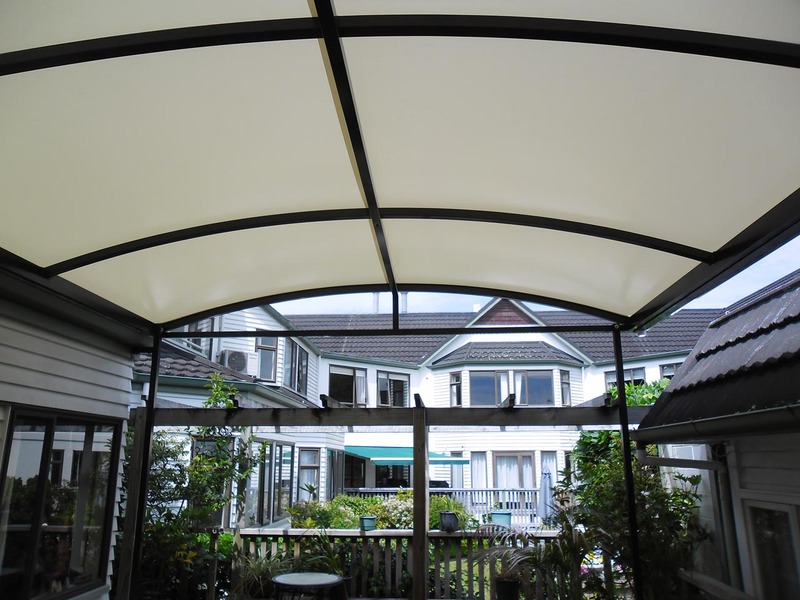 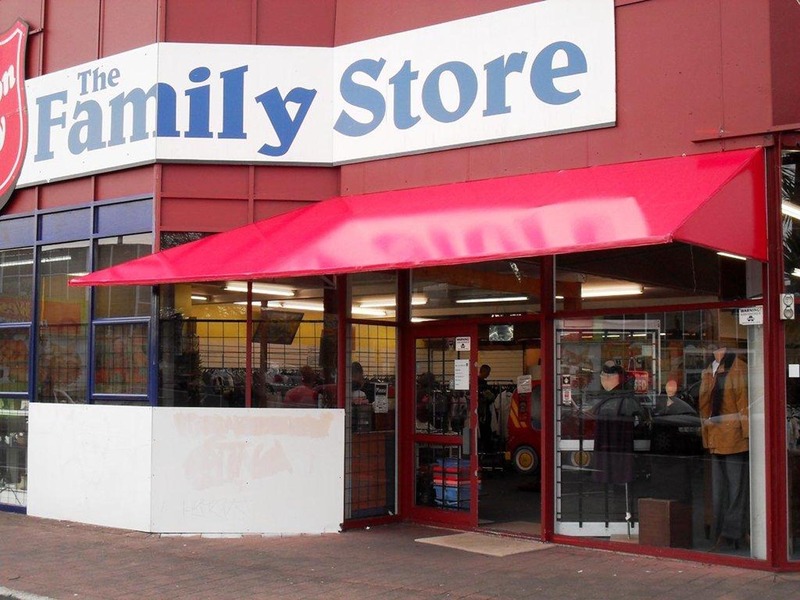 The PVC can come in a range of colours and transparencies. 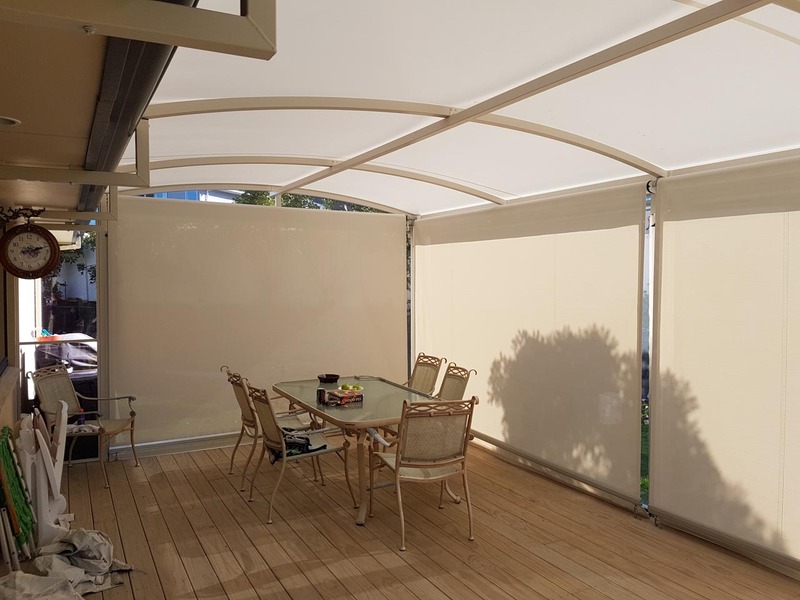 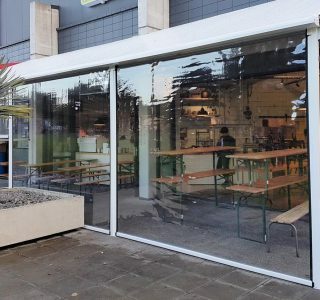 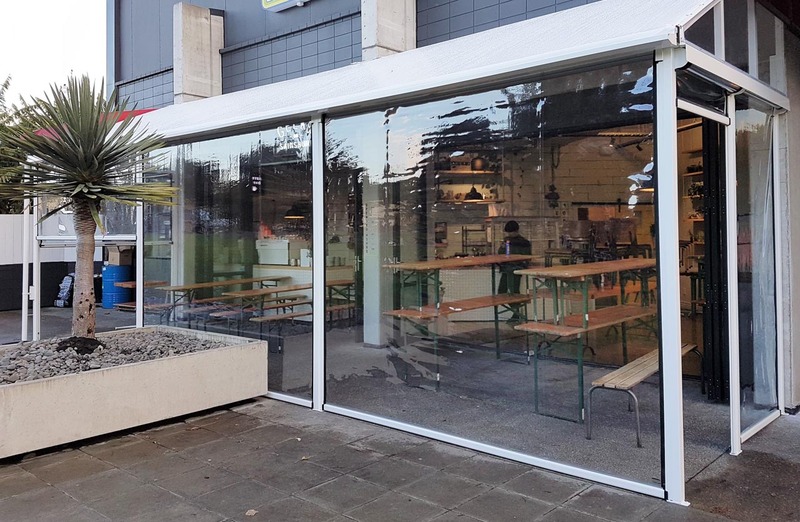 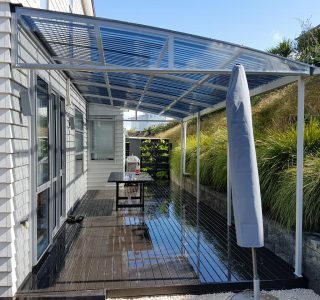 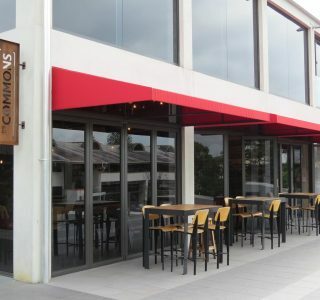 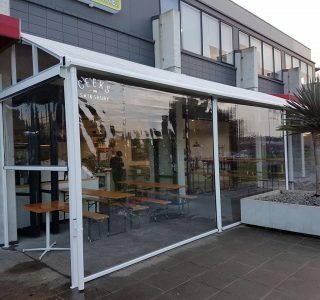 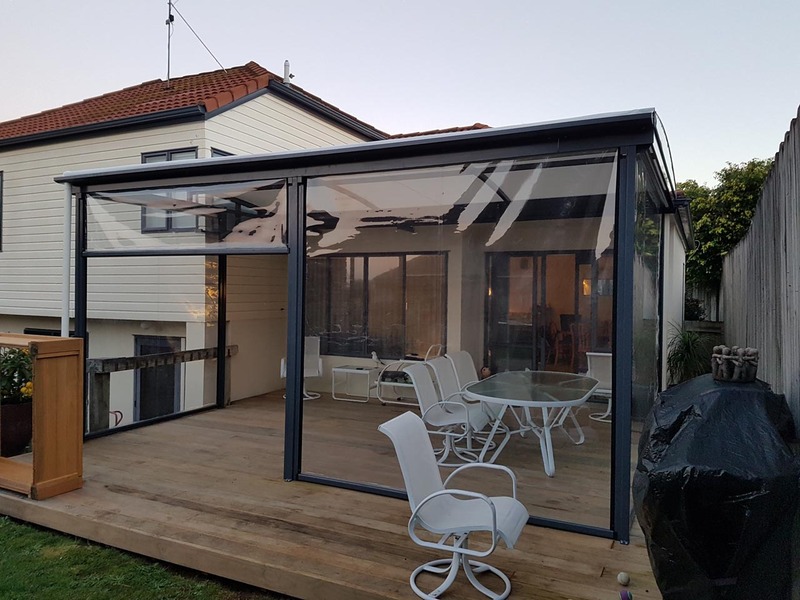 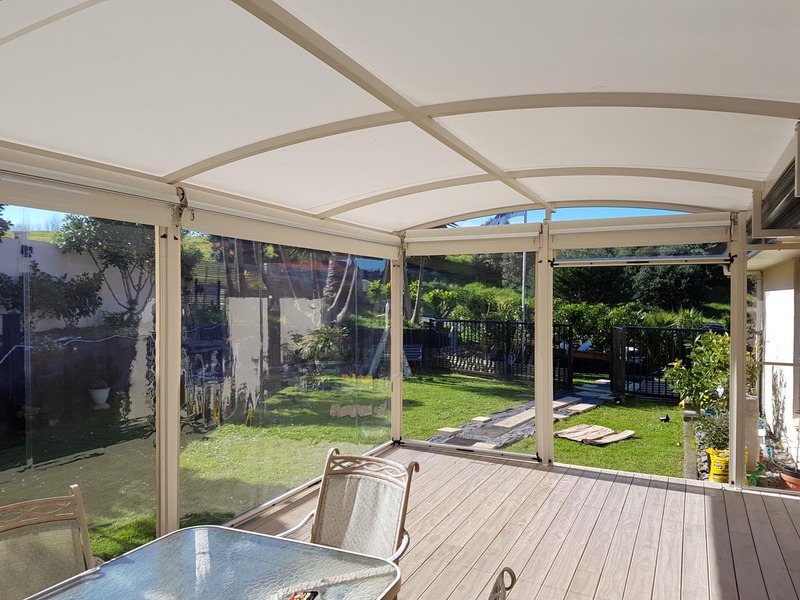 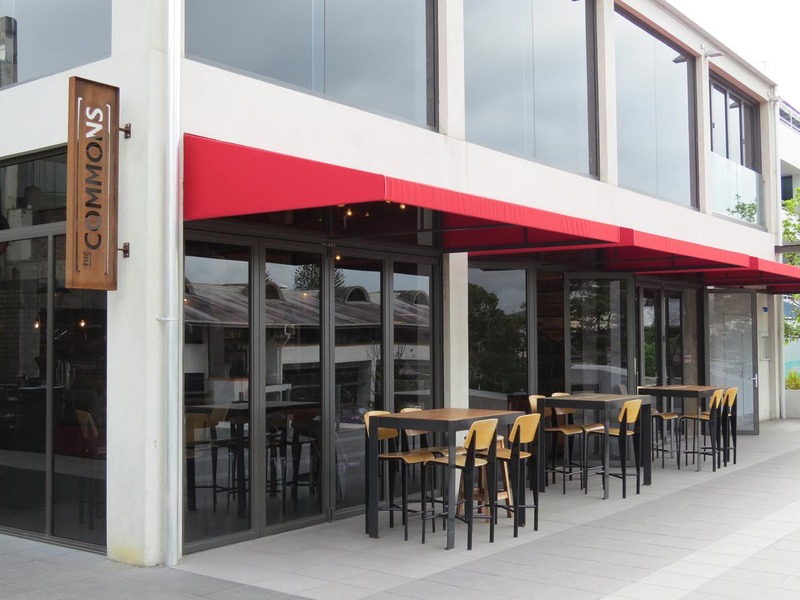 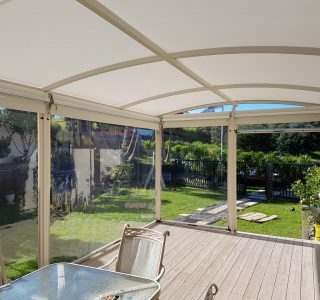 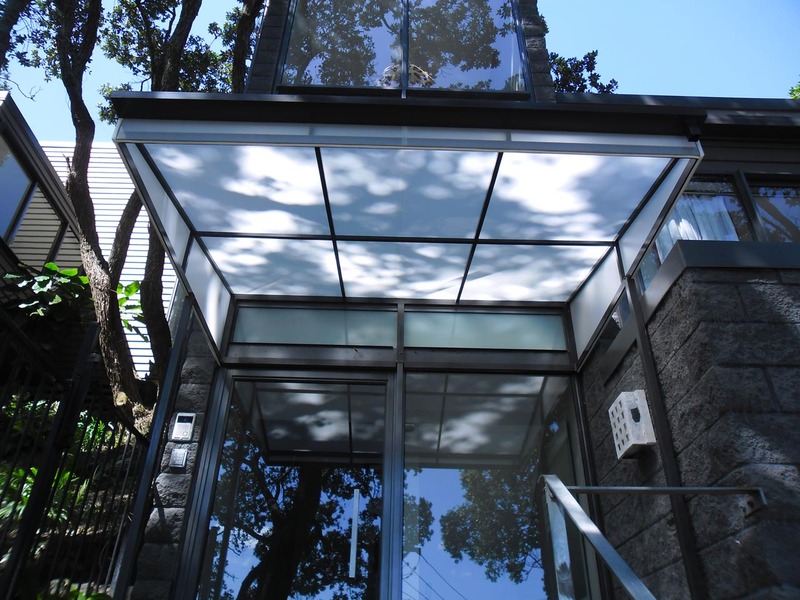 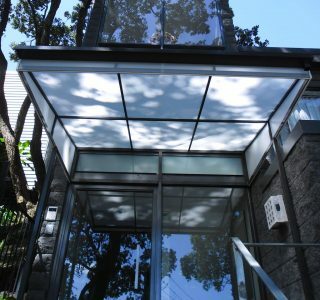 Our most popular is a semi-transparent white fabric which reflects 87% of light but still allows some light in so that the area underneath the structure feels light and open. 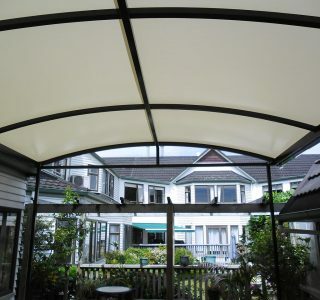 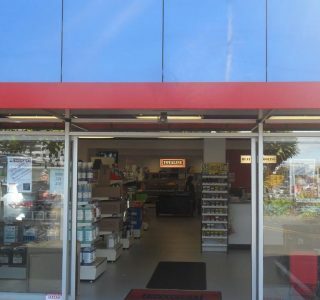 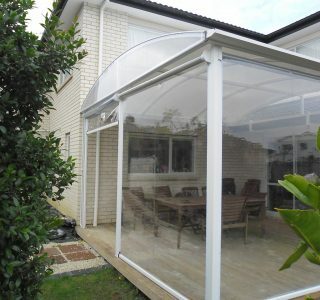 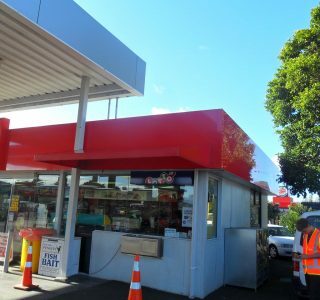 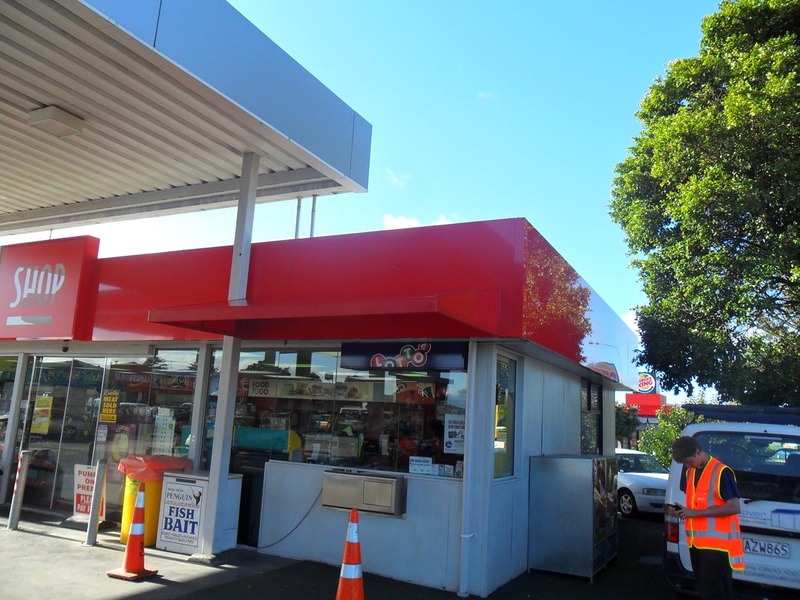 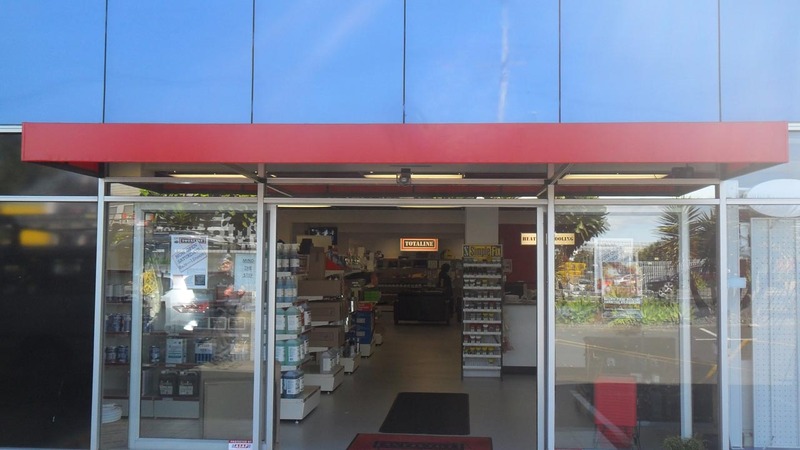 However, we also do offer FULL block out PVC if you wish to block out all light. 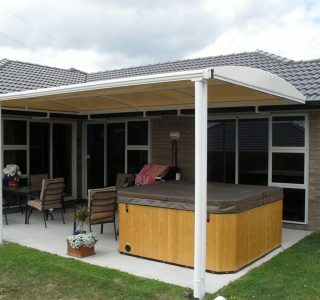 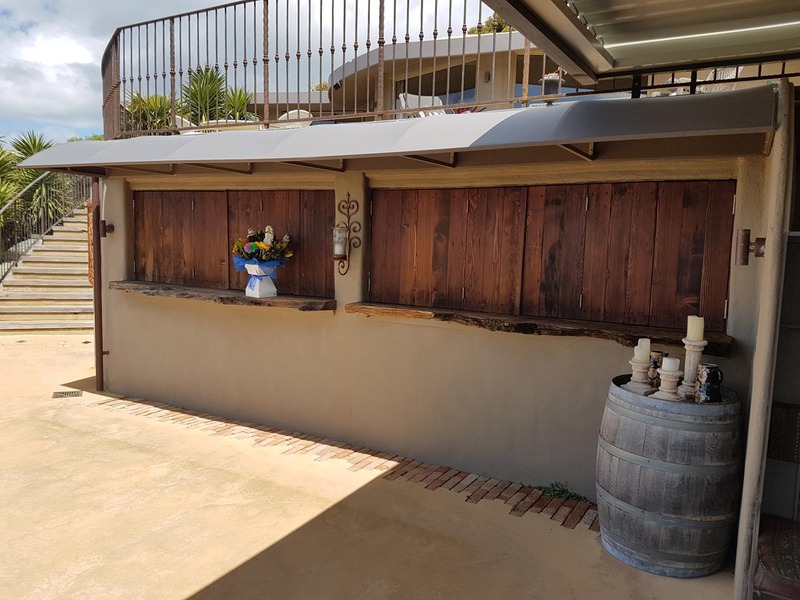 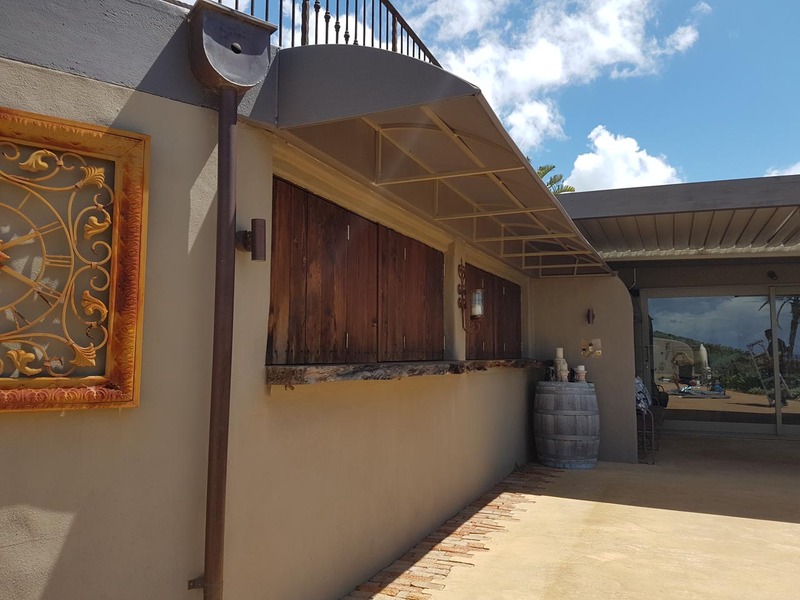 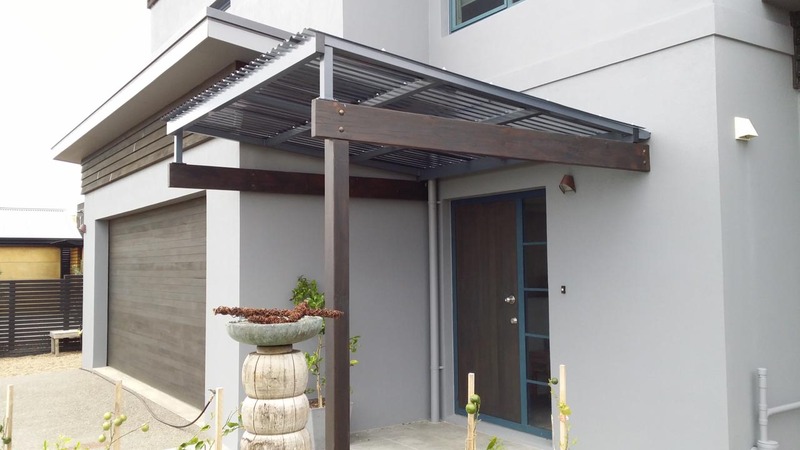 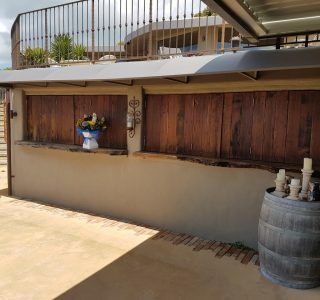 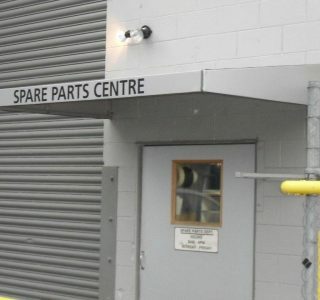 A TMS is a great addition to decked areas or to be used as Carports. 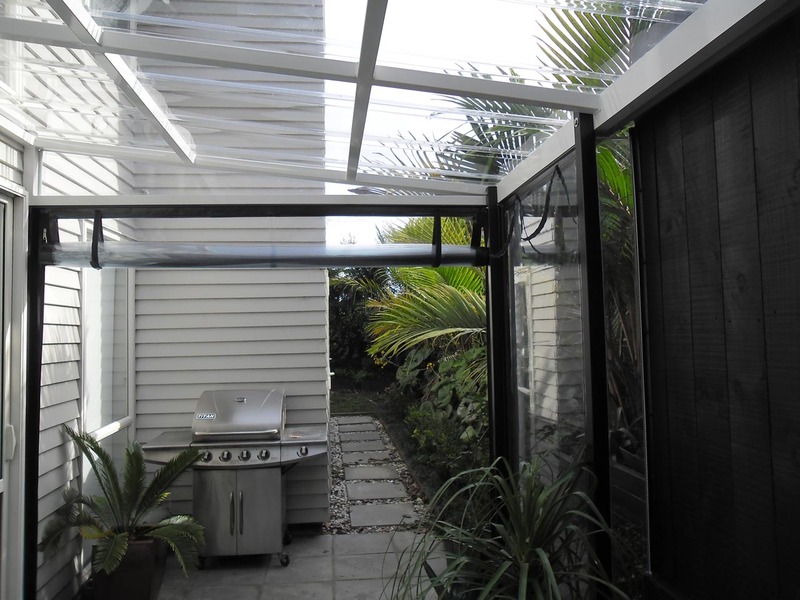 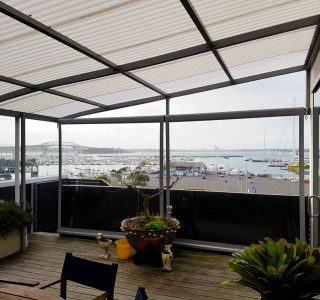 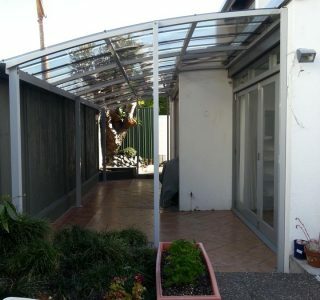 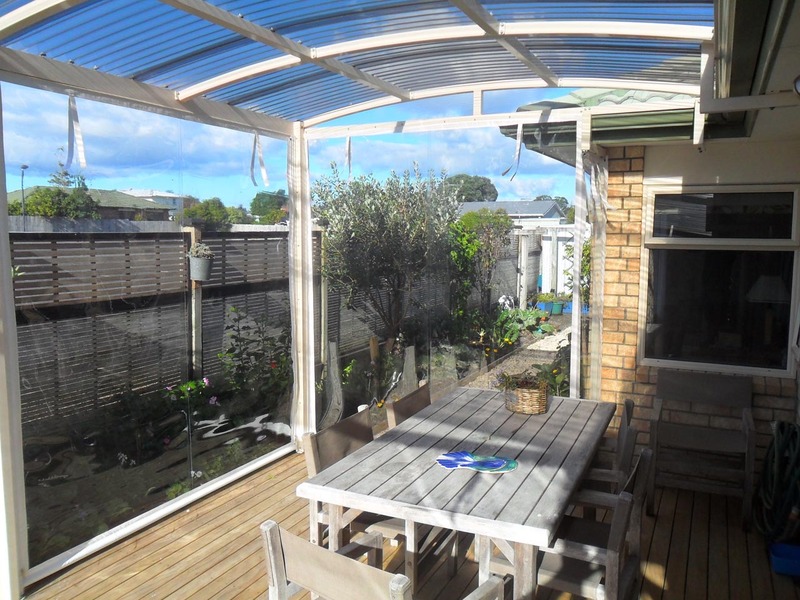 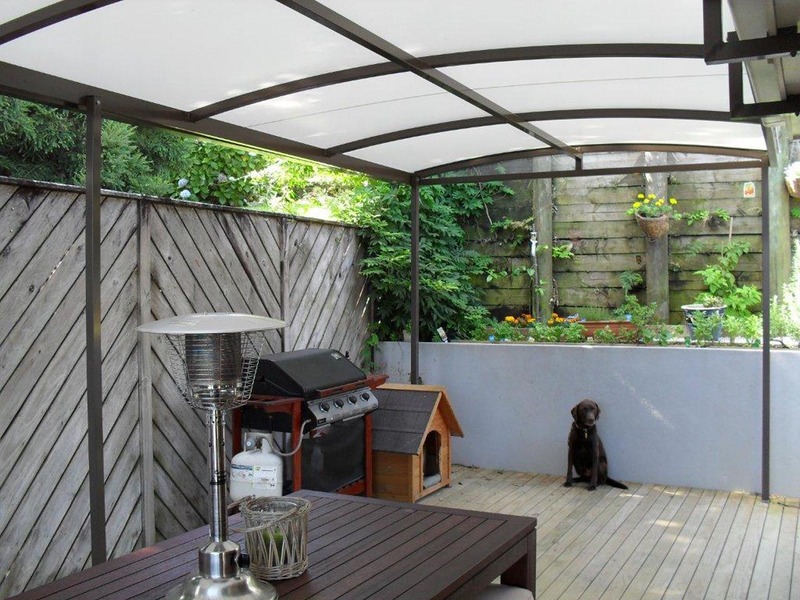 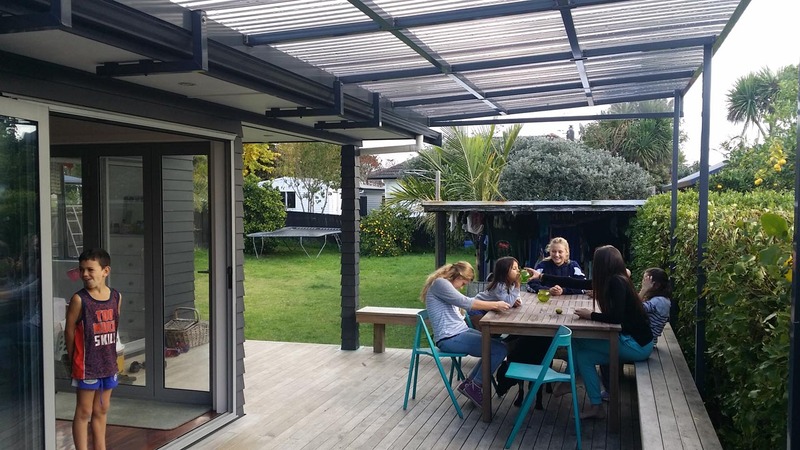 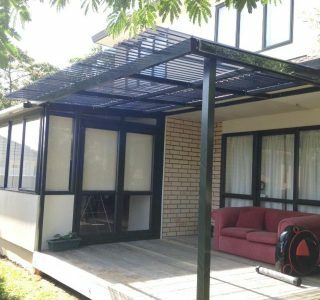 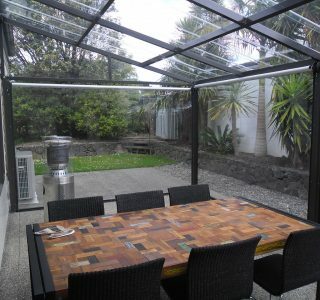 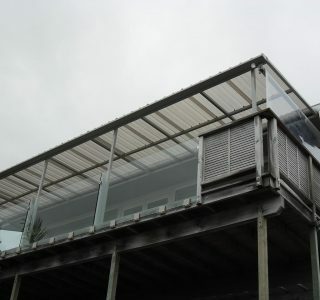 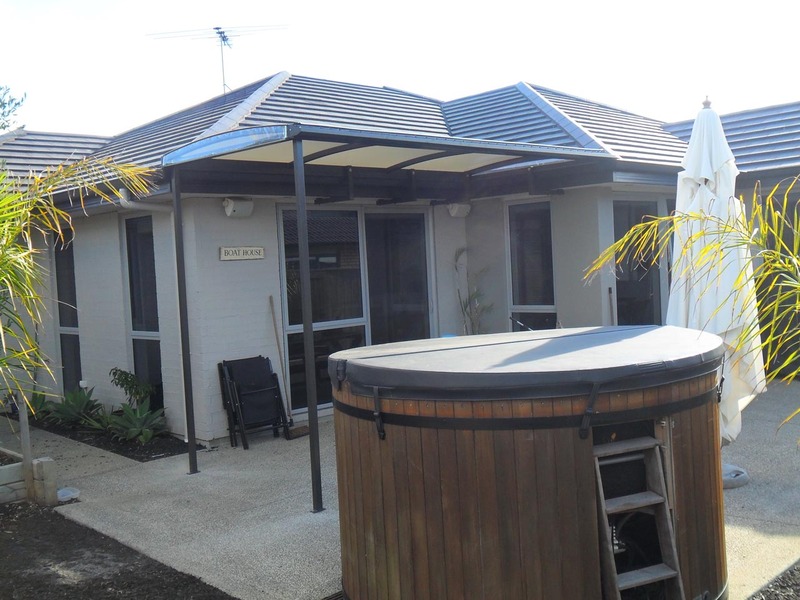 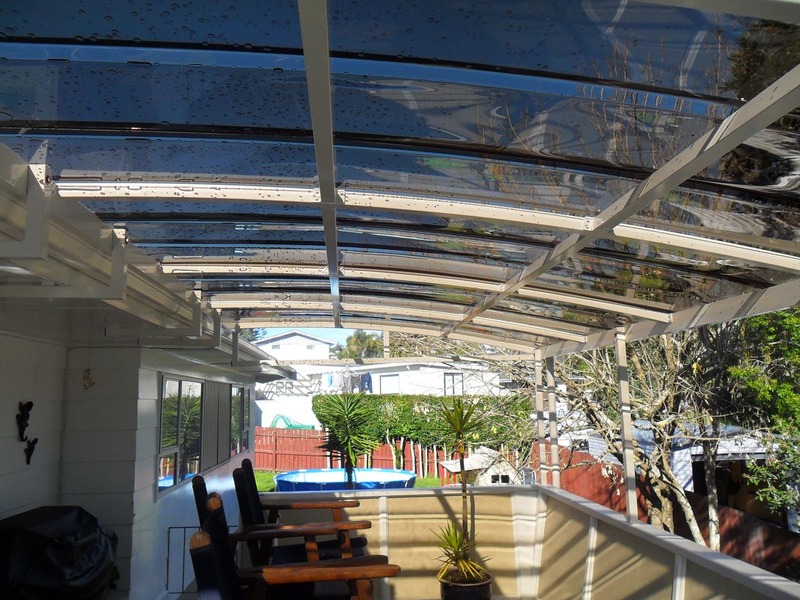 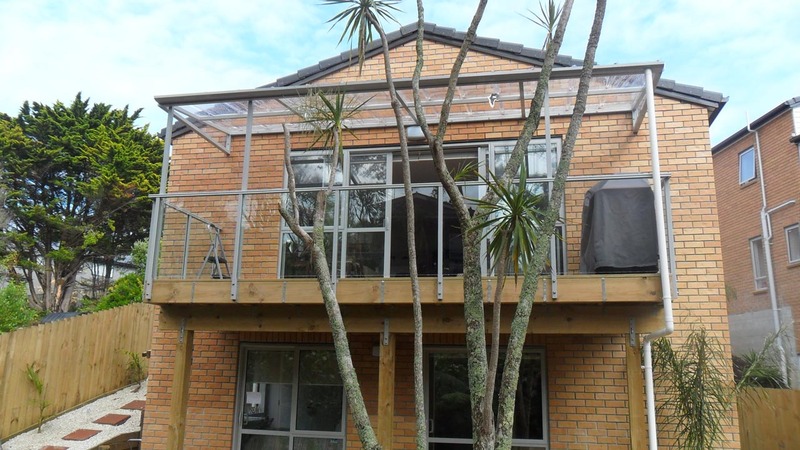 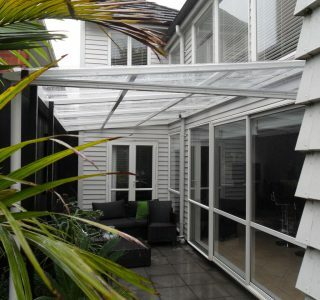 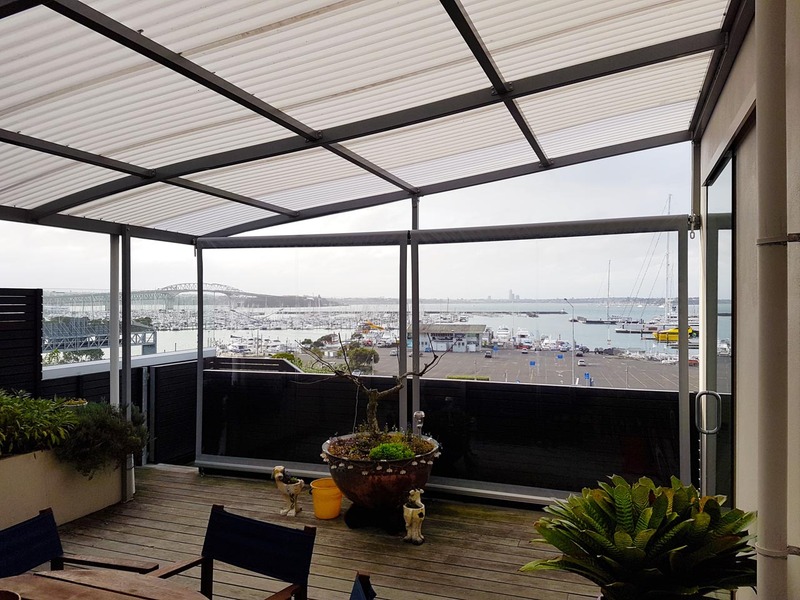 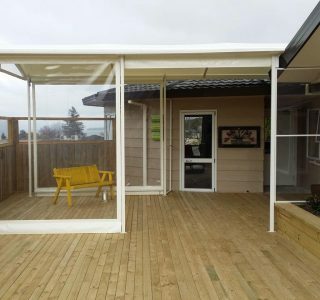 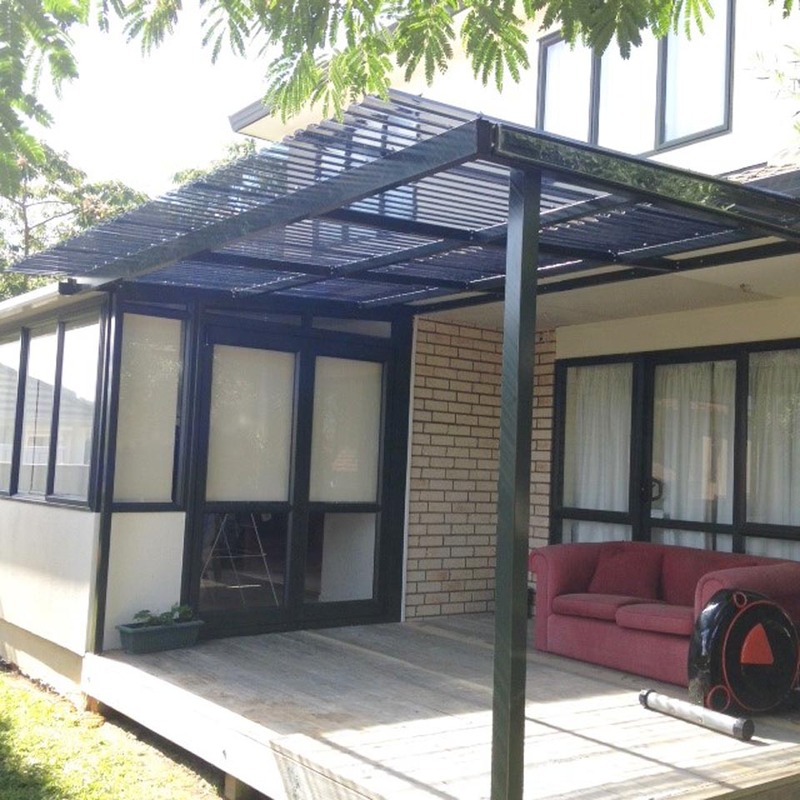 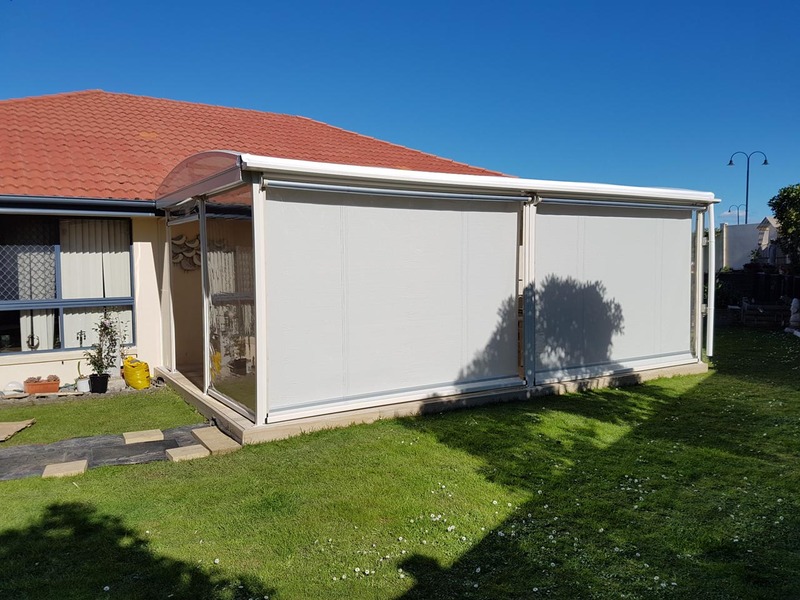 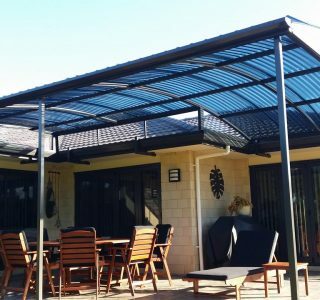 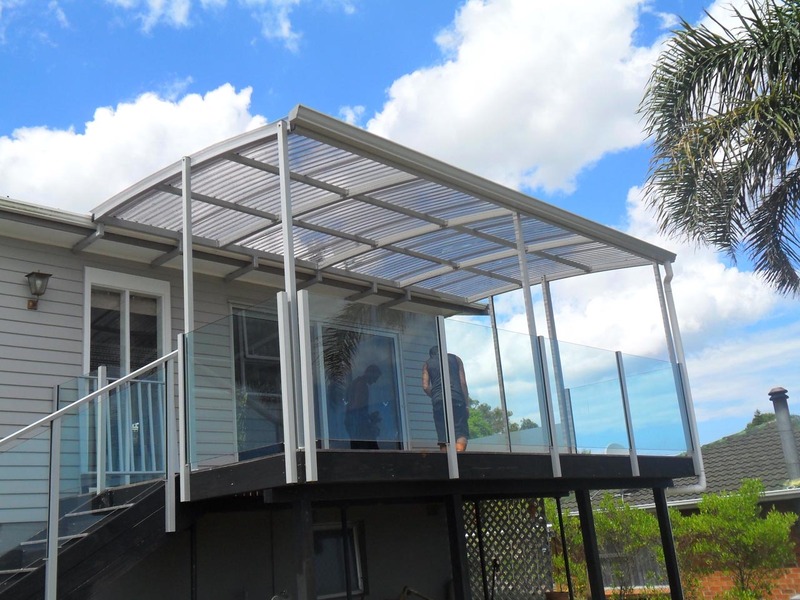 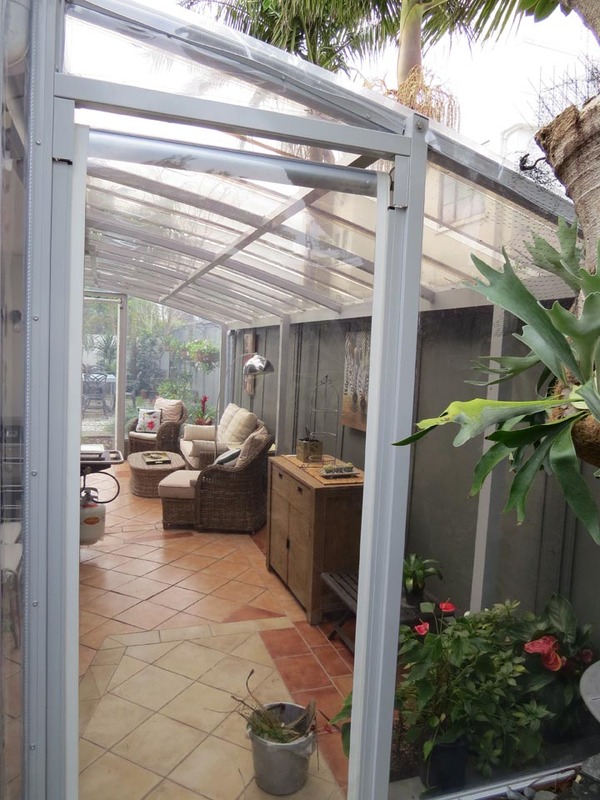 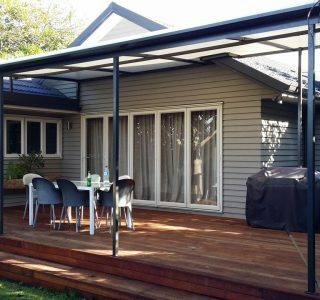 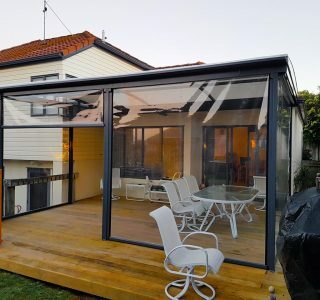 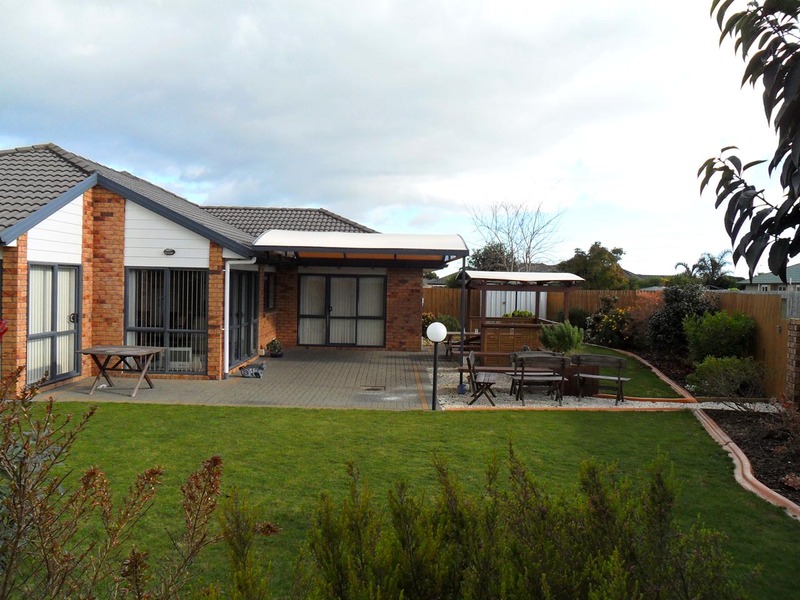 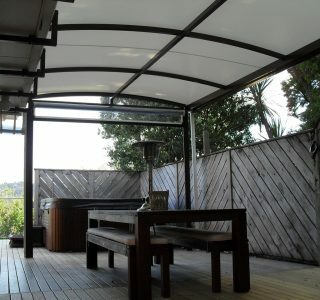 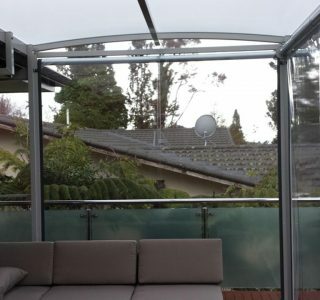 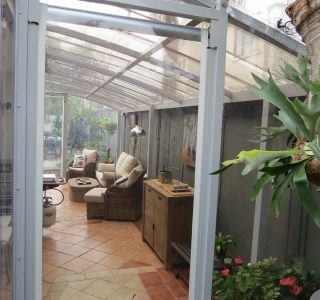 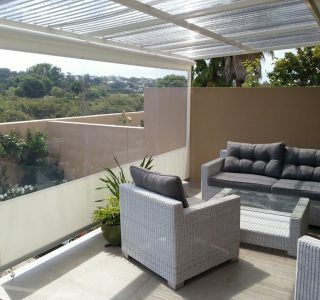 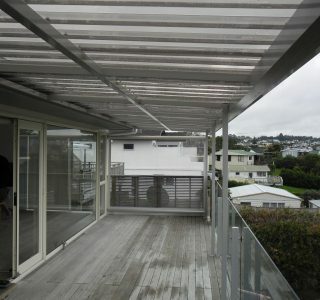 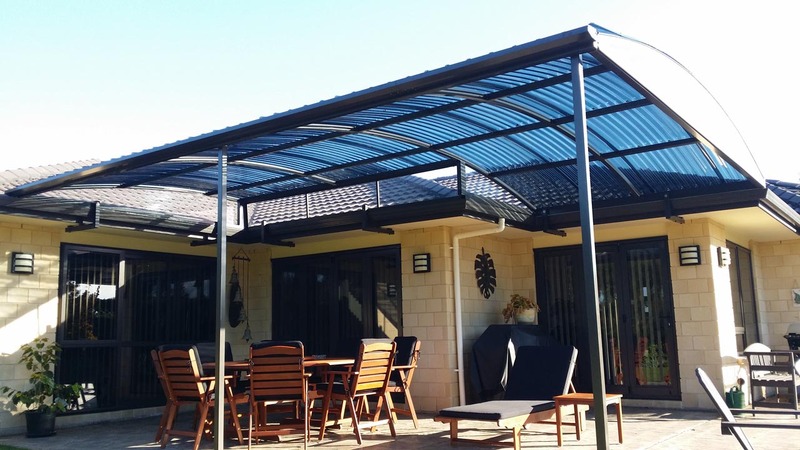 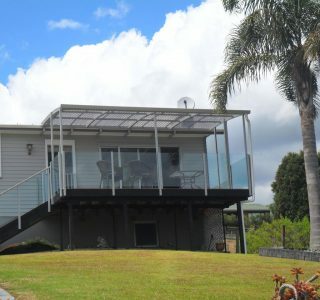 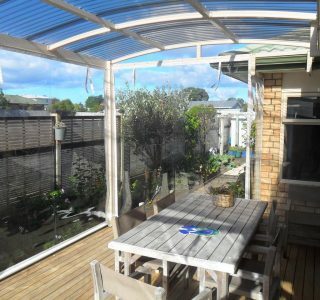 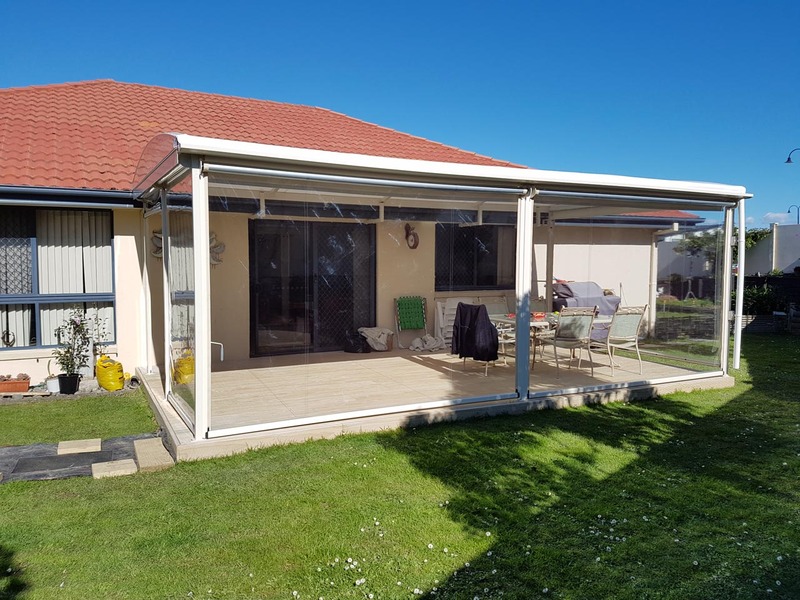 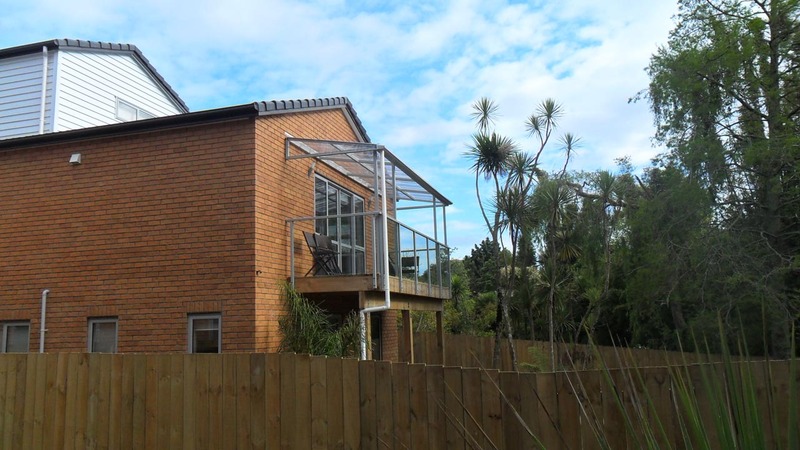 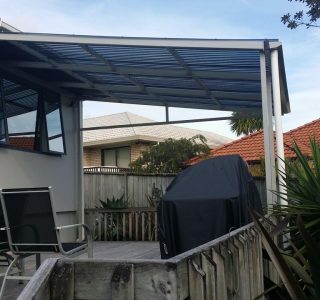 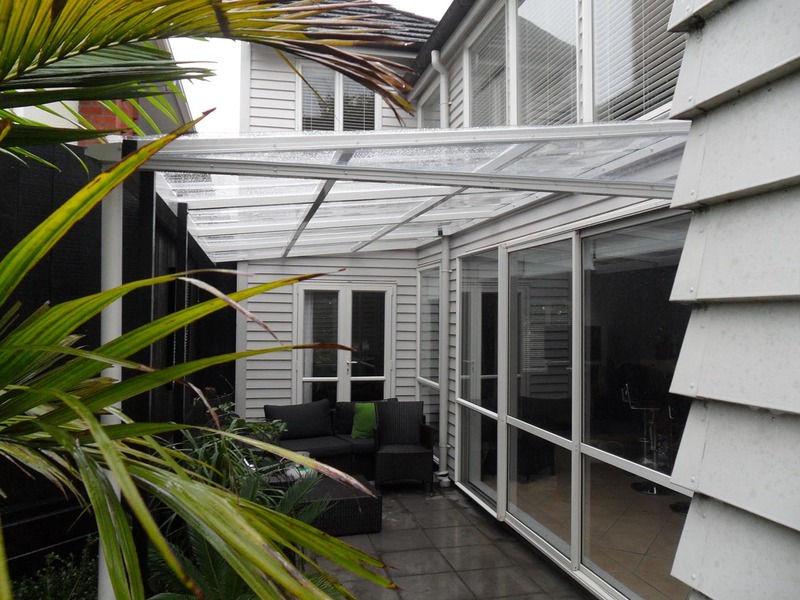 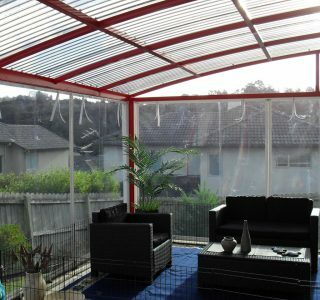 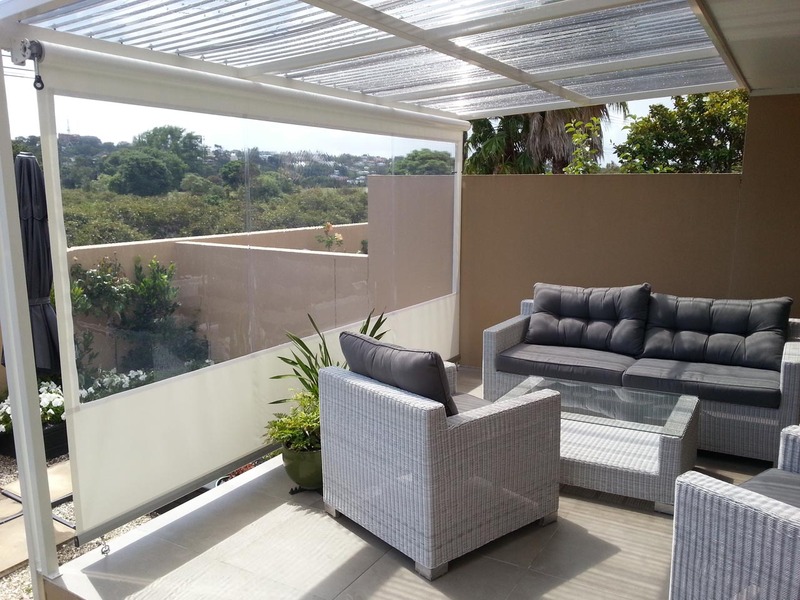 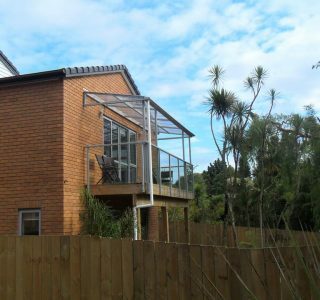 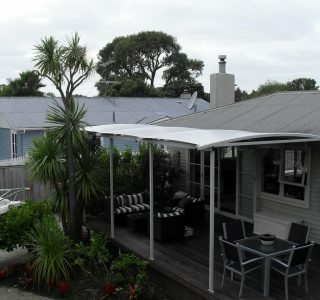 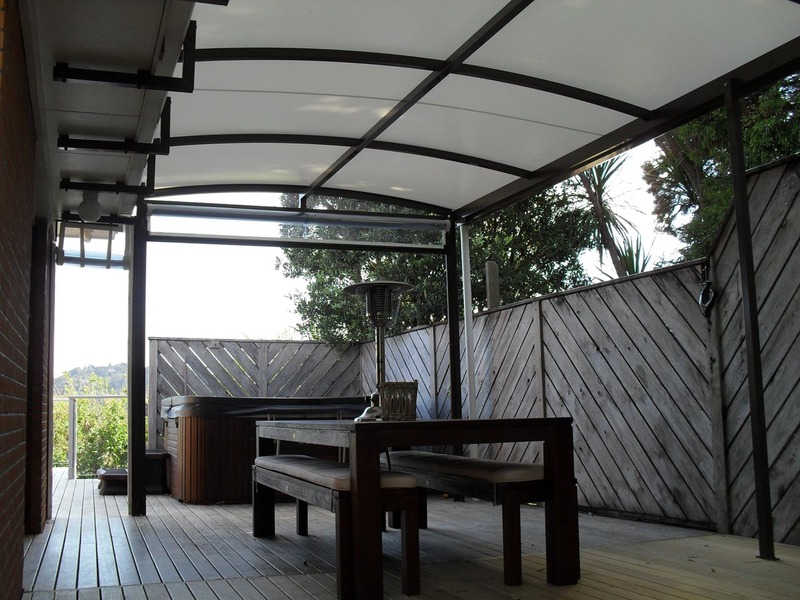 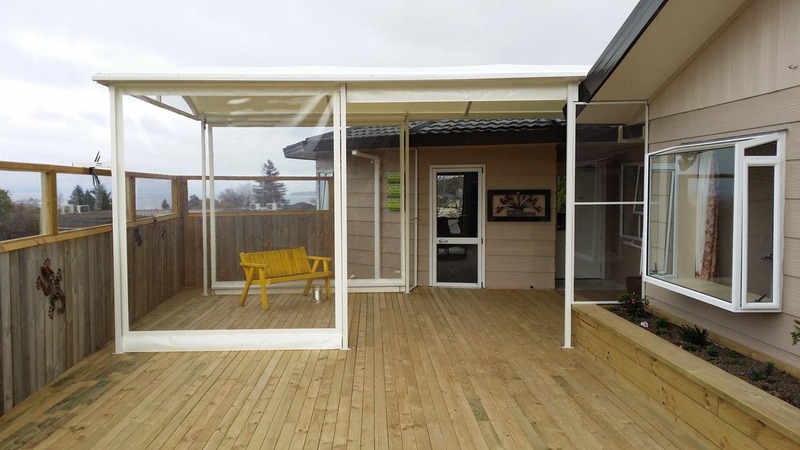 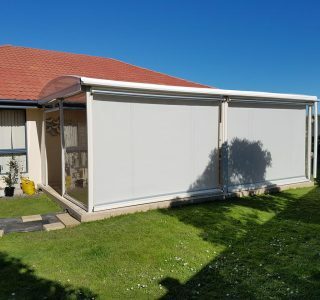 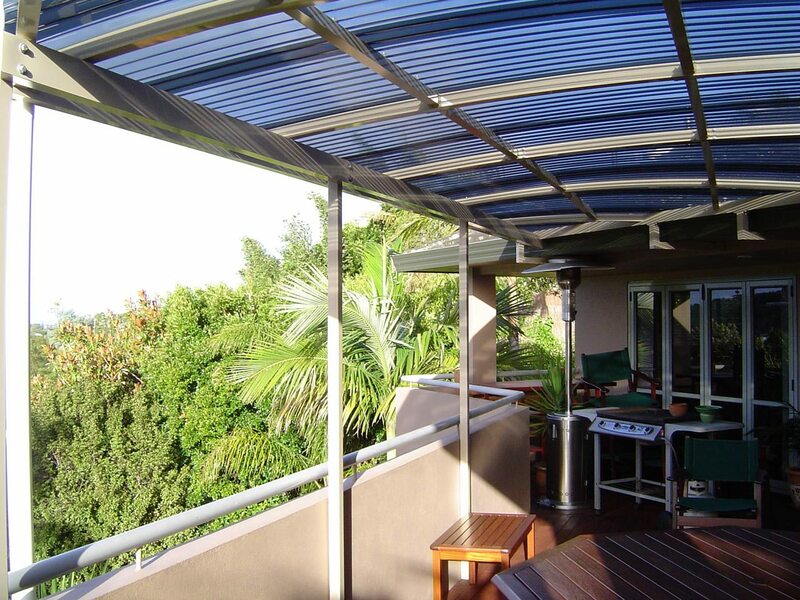 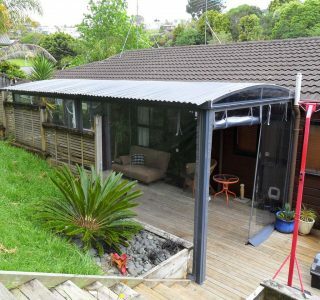 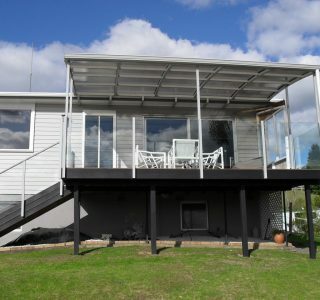 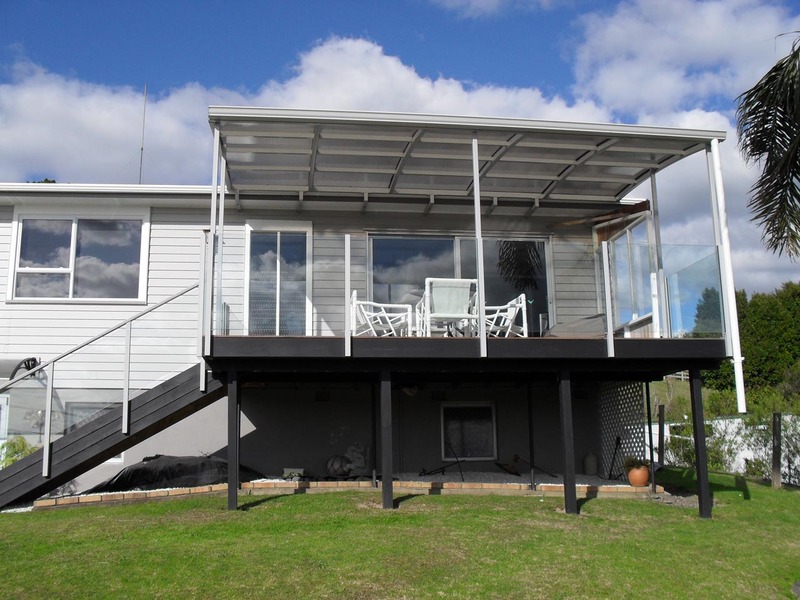 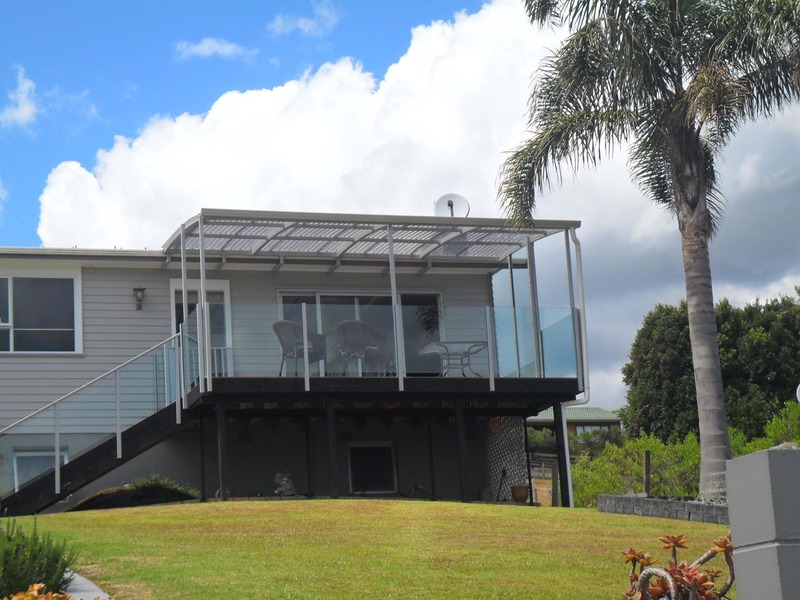 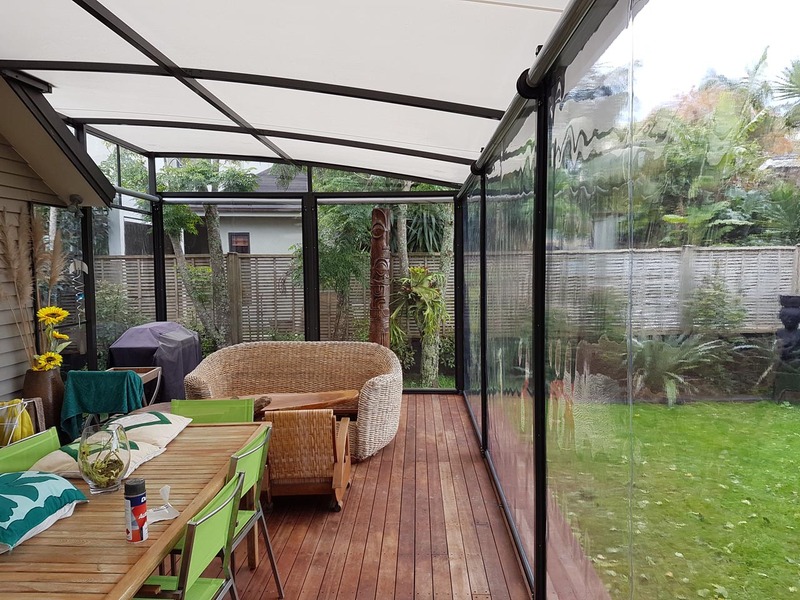 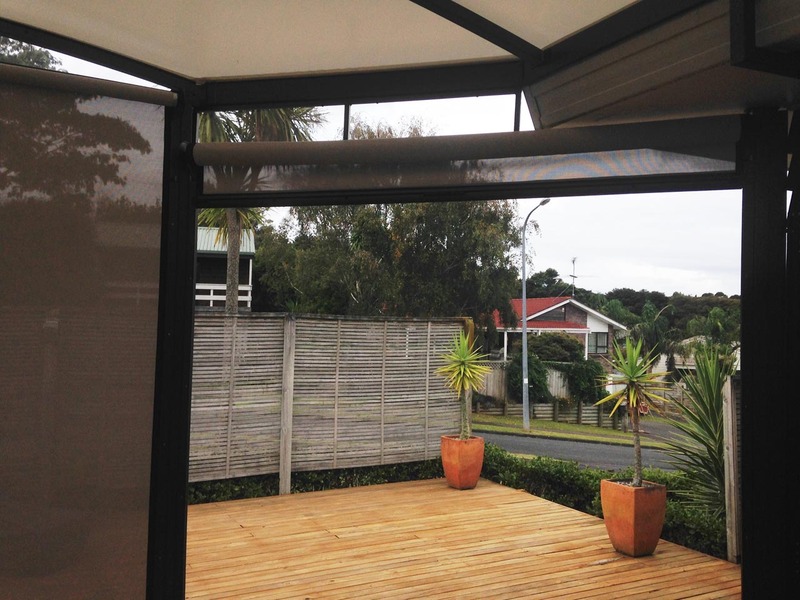 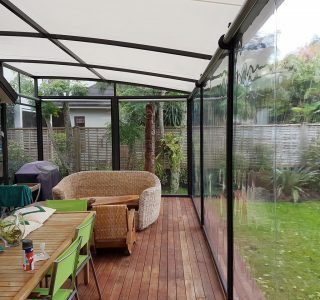 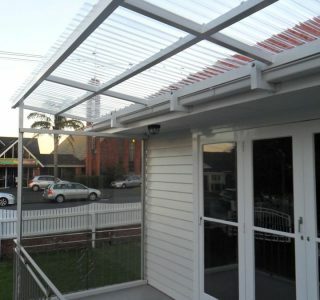 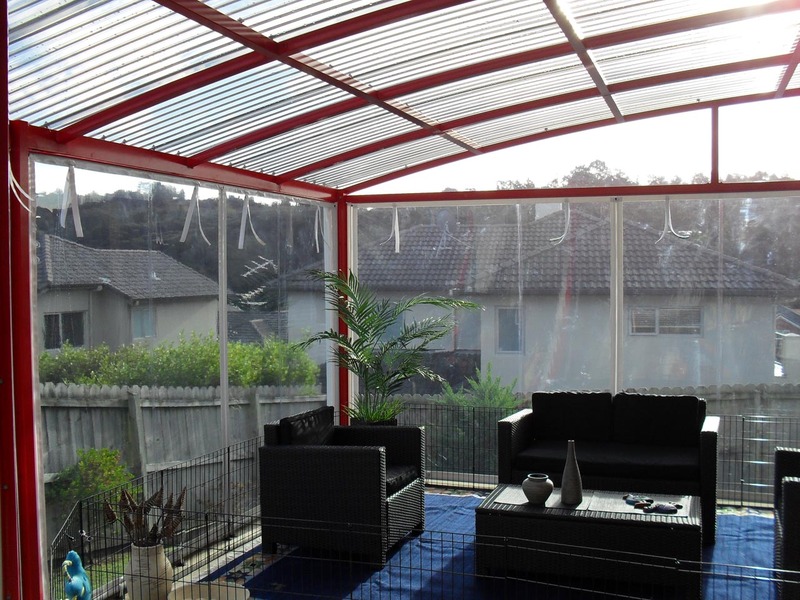 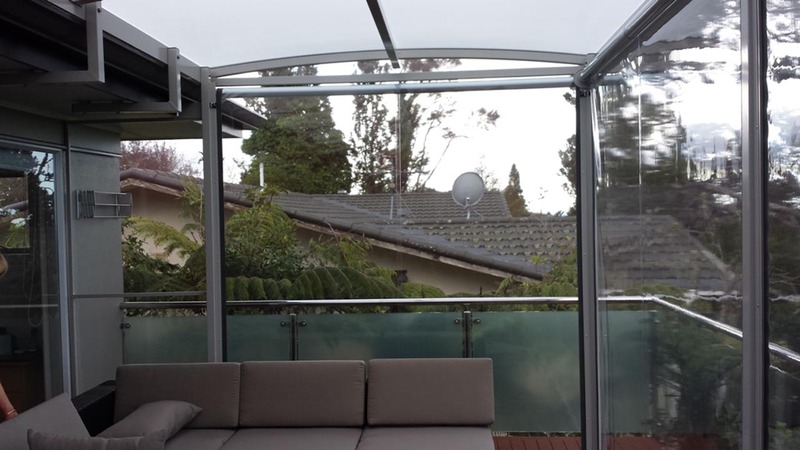 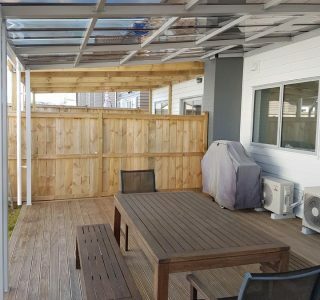 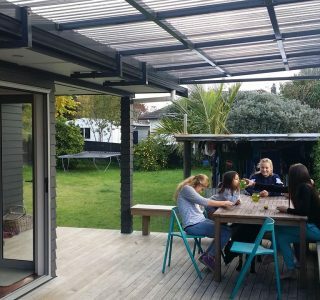 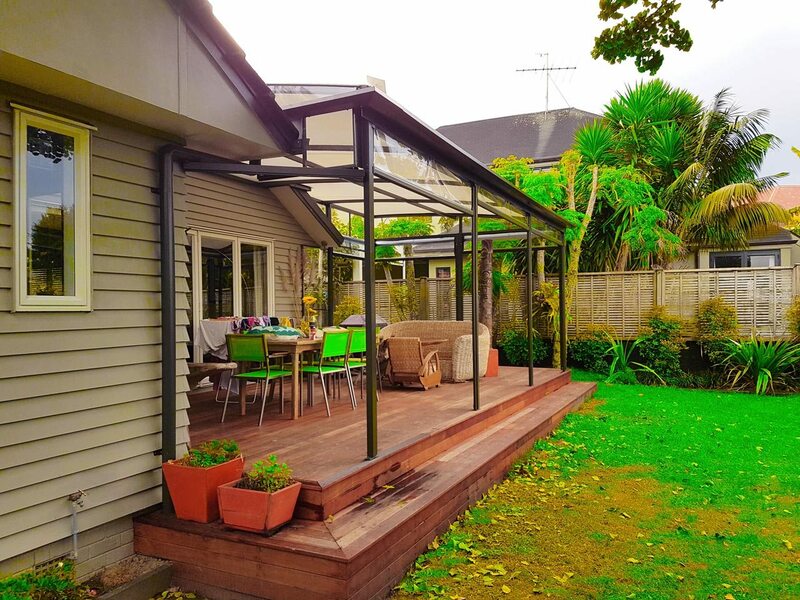 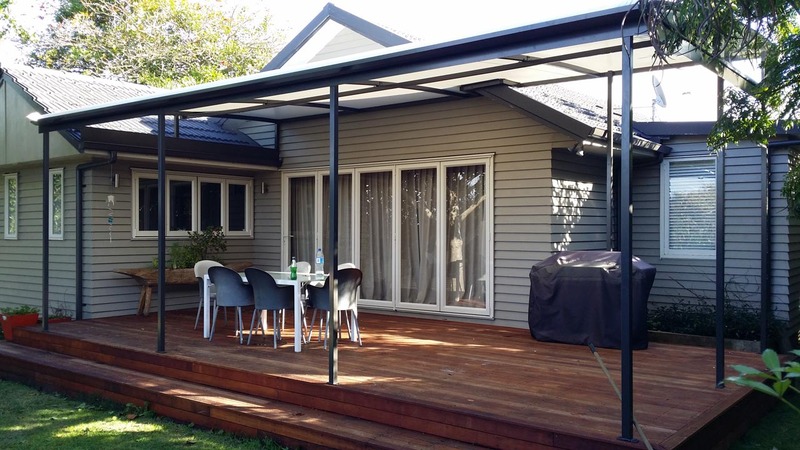 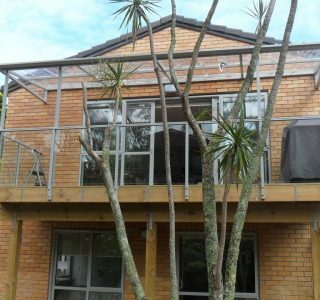 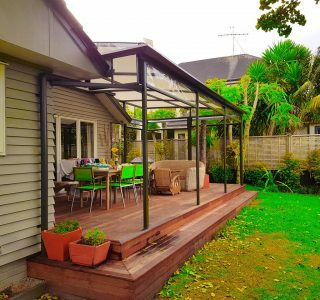 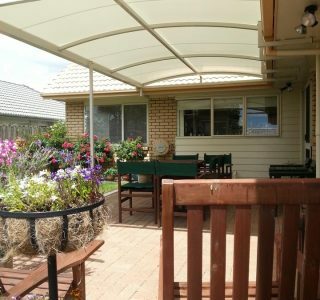 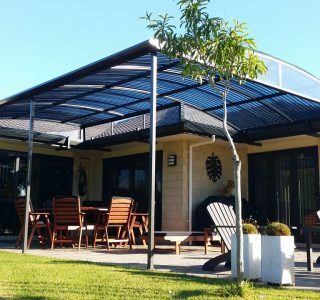 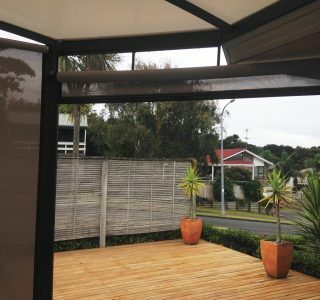 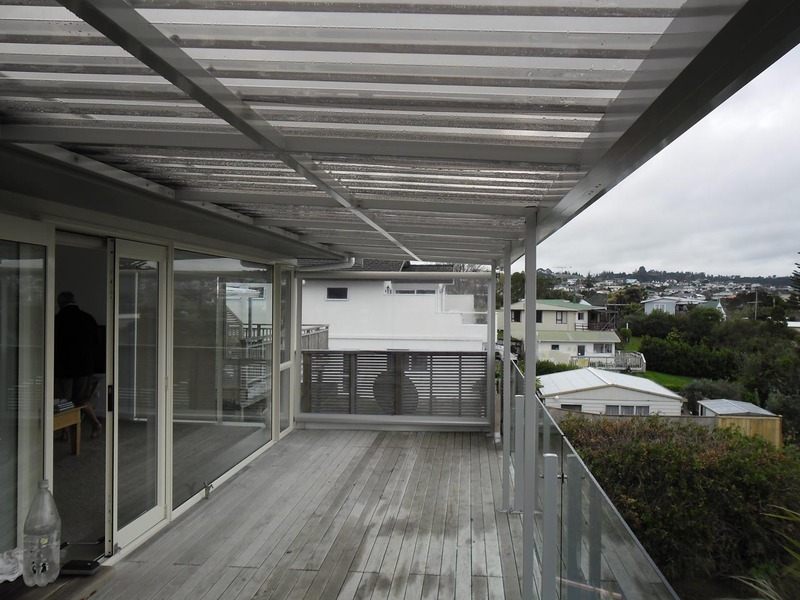 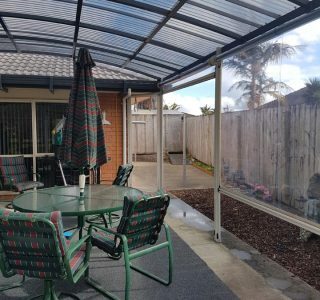 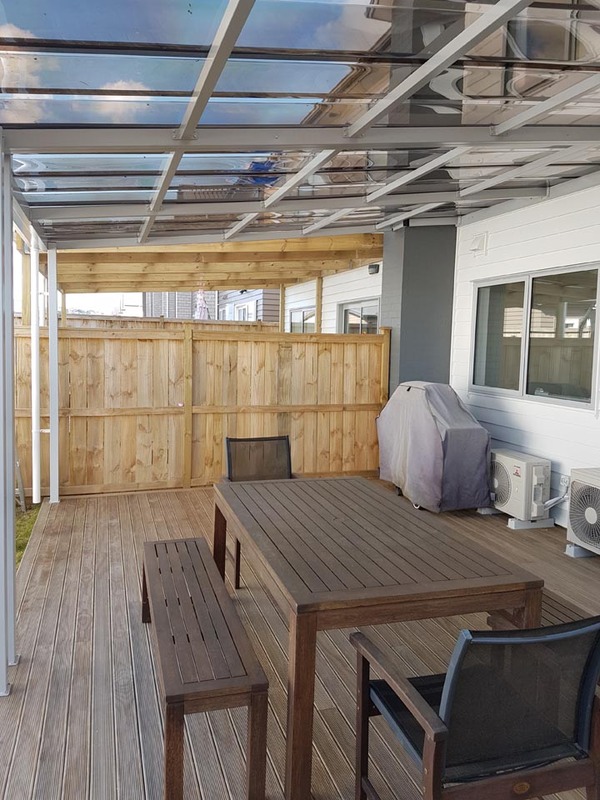 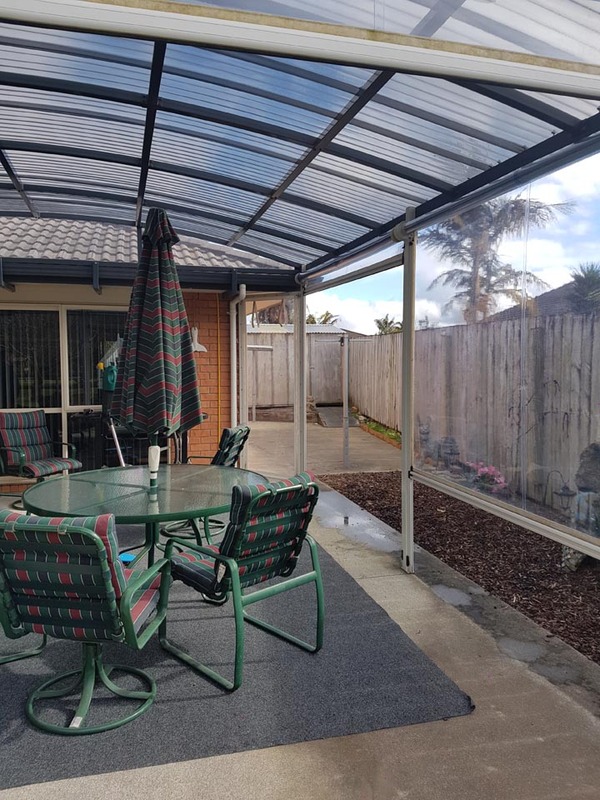 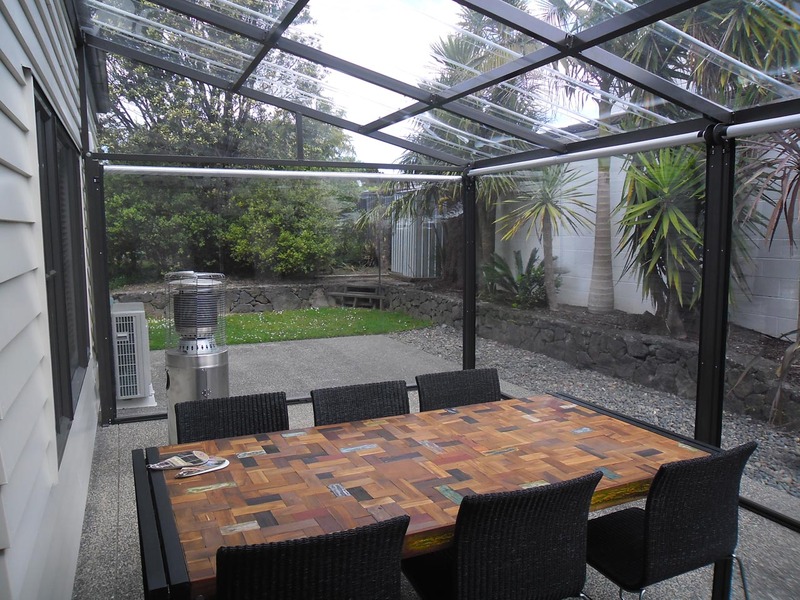 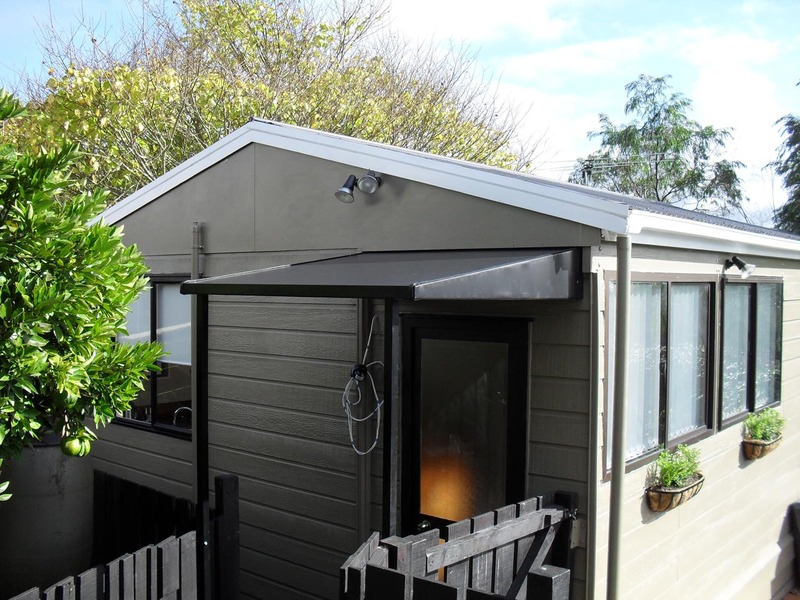 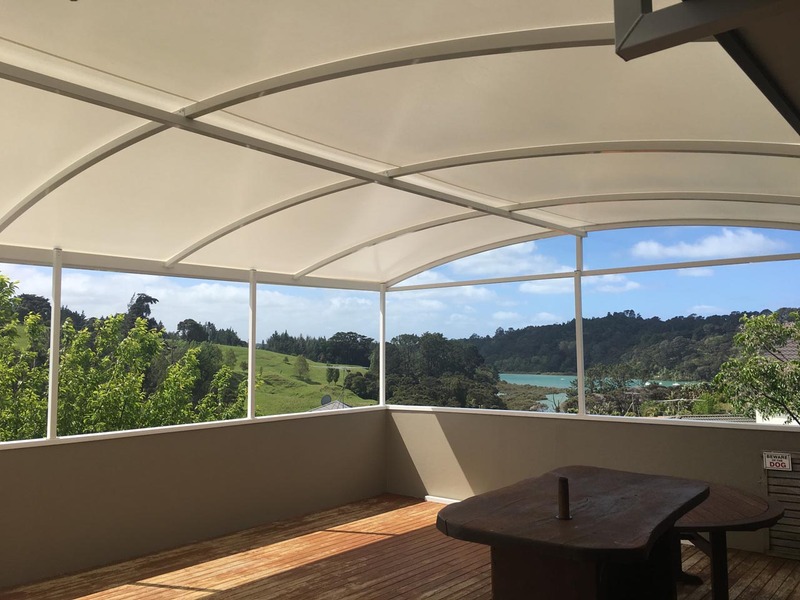 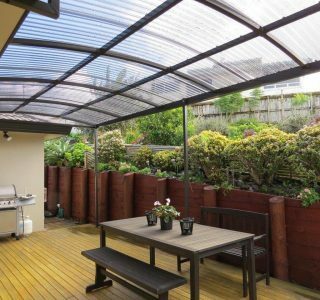 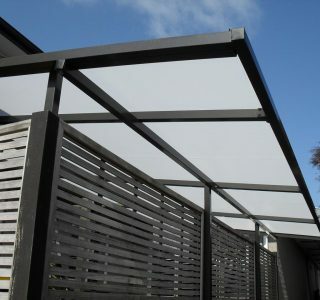 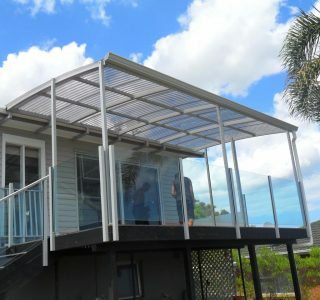 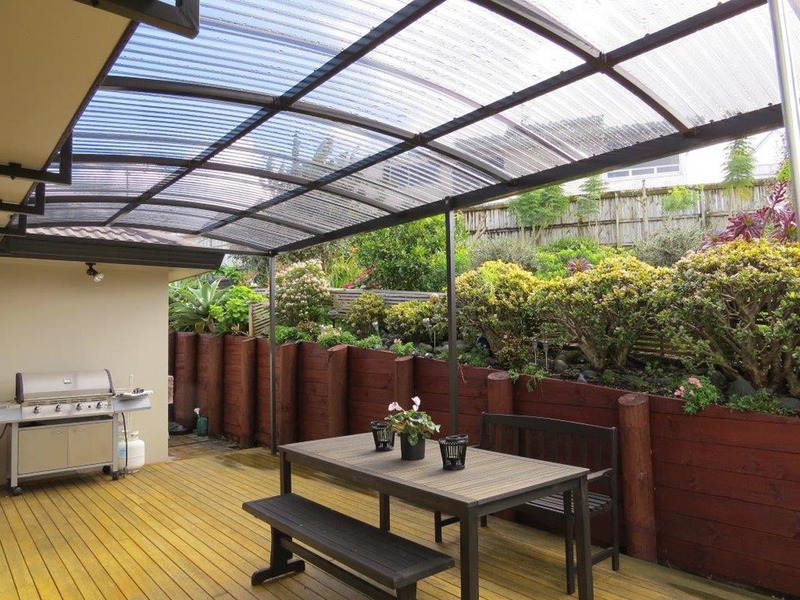 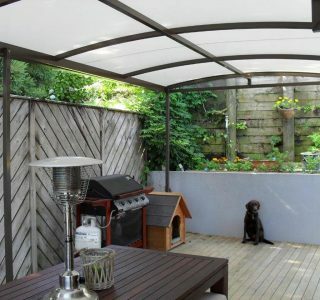 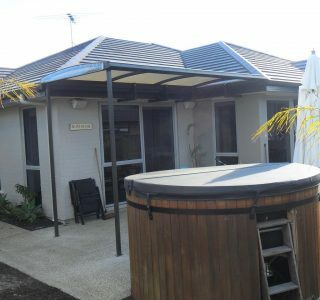 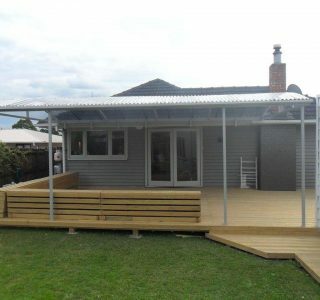 If desired an outdoor room can be created with the use of our selection of screens to completely enclose the area. 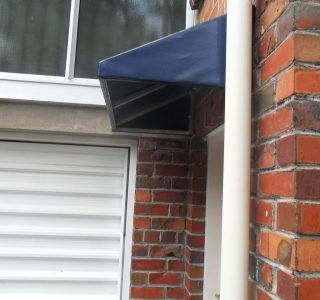 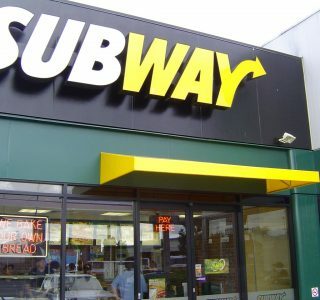 Covering Heavy duty structural PVC with self-cleaning properties. 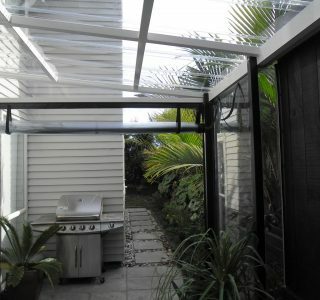 Block out option available. 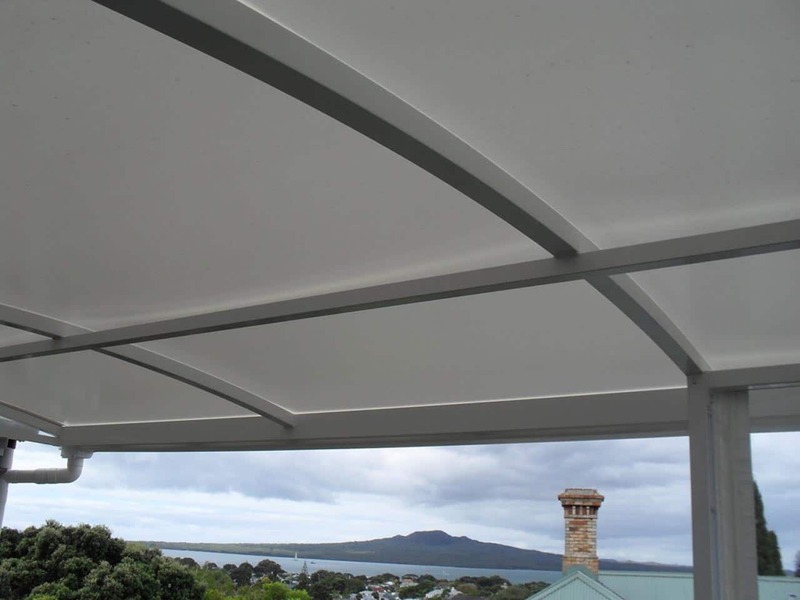 Sizing Fully customised to meet your requirements or a standardised system is available. 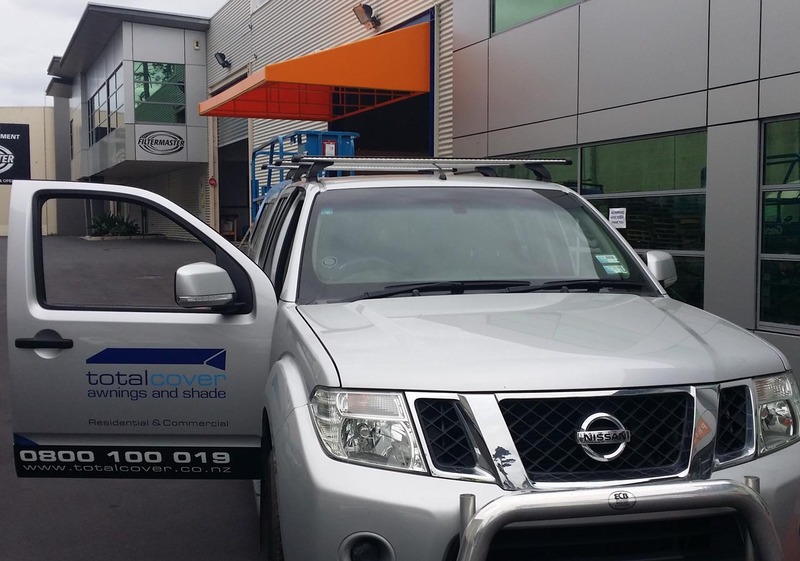 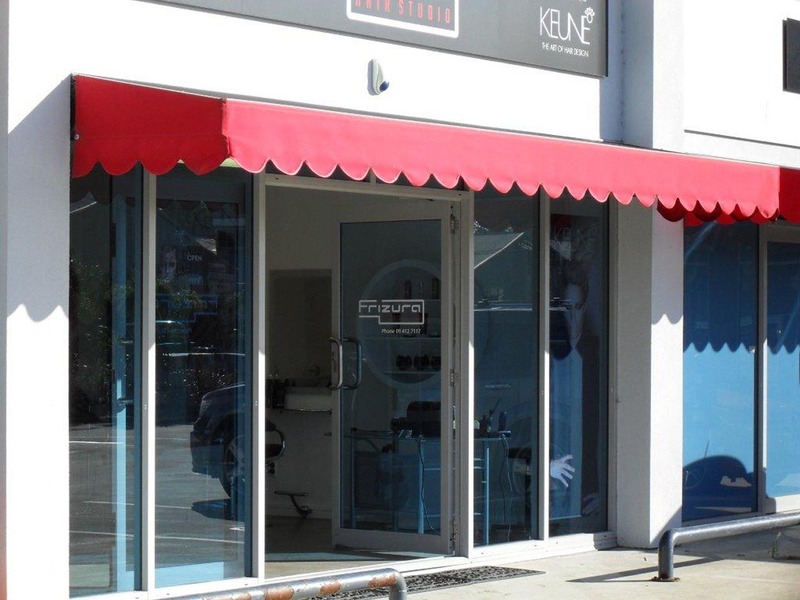 Follow-up We’re committed to giving you a ‘WoW’ experience through our service, advice and follow up.